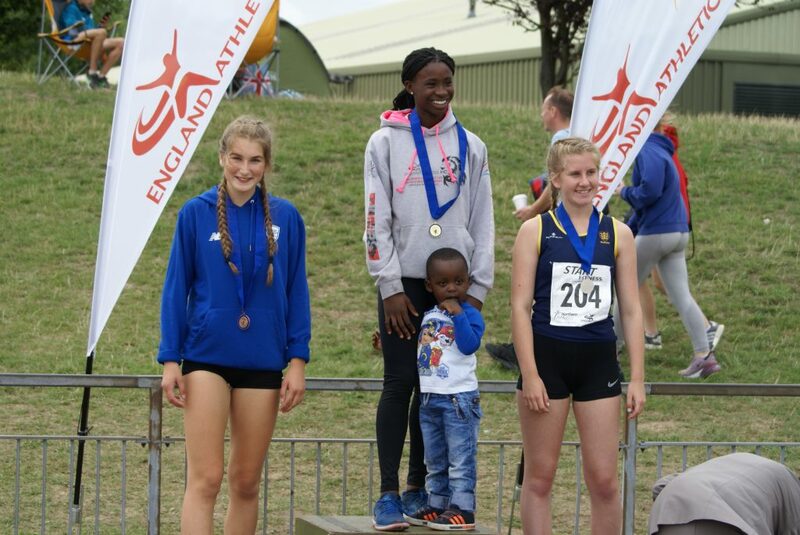 What a year for U17 Charlotte Williams! 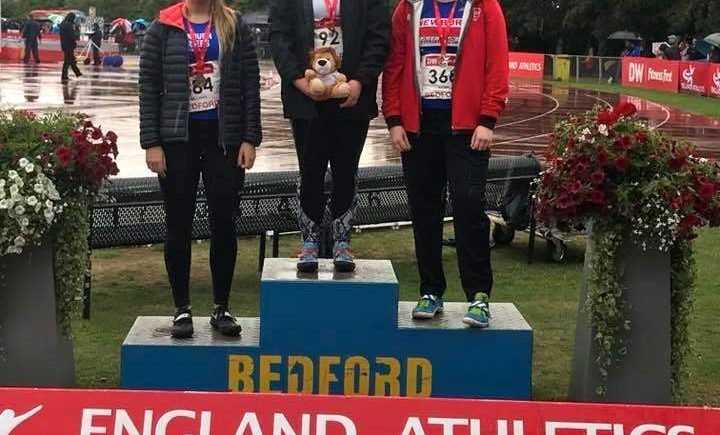 Started off thinking that she wouldn’t be able to compete in 2018 after undergoing surgery on her Meniscus and ACL – yet here she is, in only her fourth event of the year, throwing a seasons best distance of 57.41m to take 3rd place and the Bronze Medal at the National Championships. 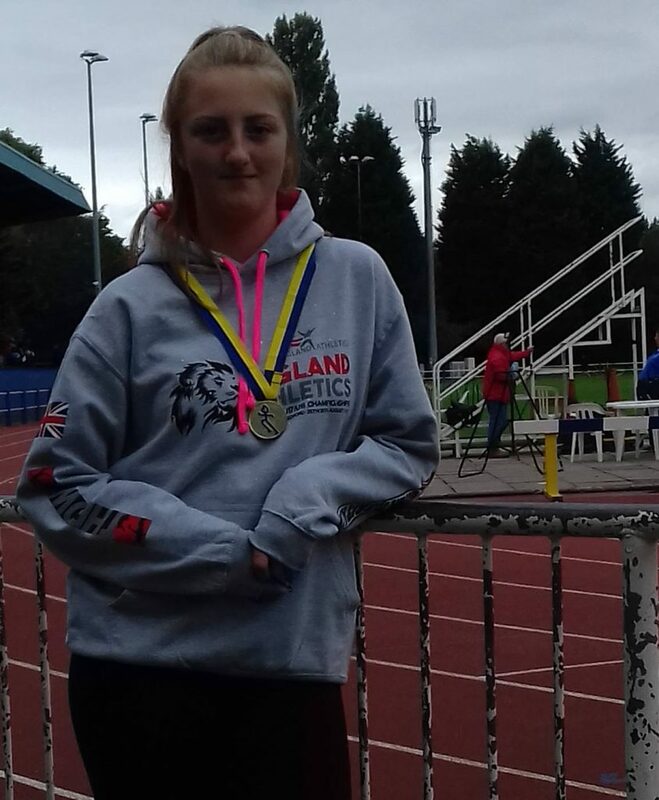 A delighted Charlie told the Club after receiving her Medal “To win a bronze medal at the National Championships when I got told I wouldn’t even be back throwing until November was a great surprise and the best way to end my season. 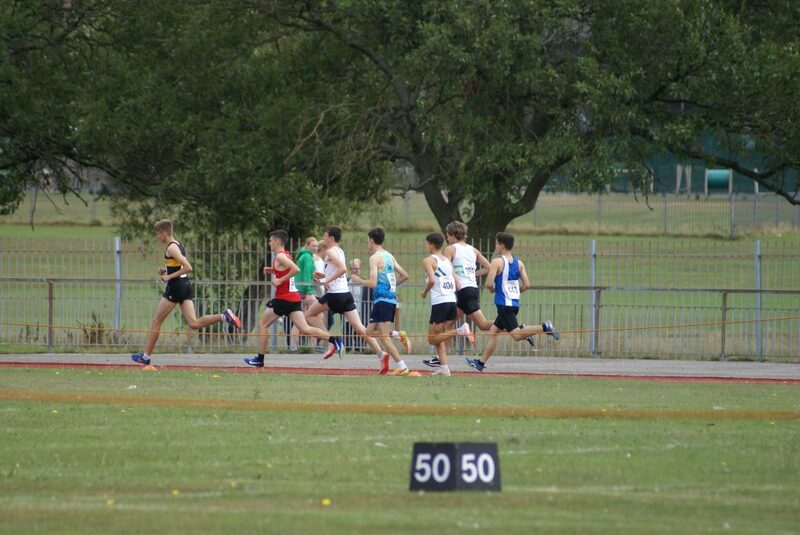 Thankyou to everyone in the club for the constant support”. 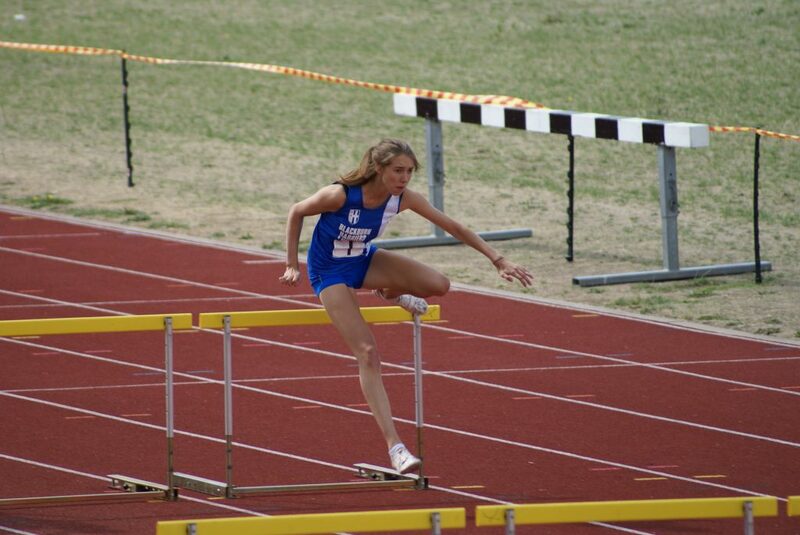 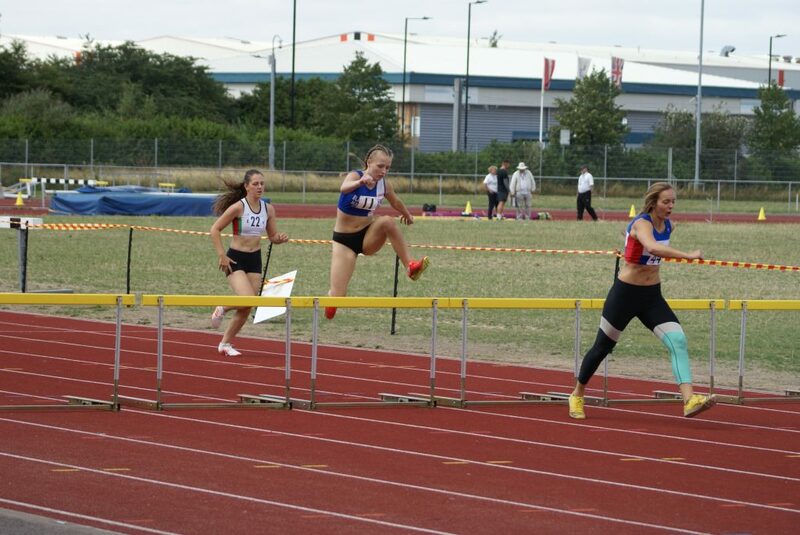 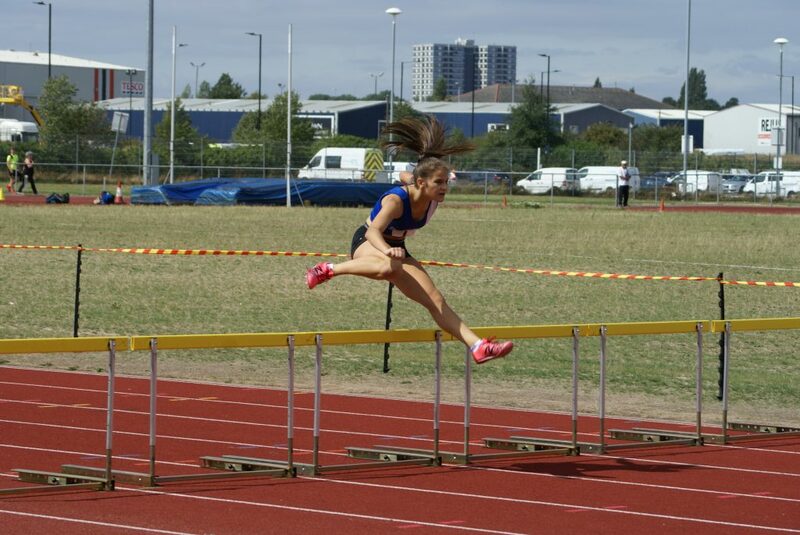 After qualifying and competing at English Schools this year and achieving a National Standard, Myah Booth ran in the 75m Hurdles which featured three Heats. 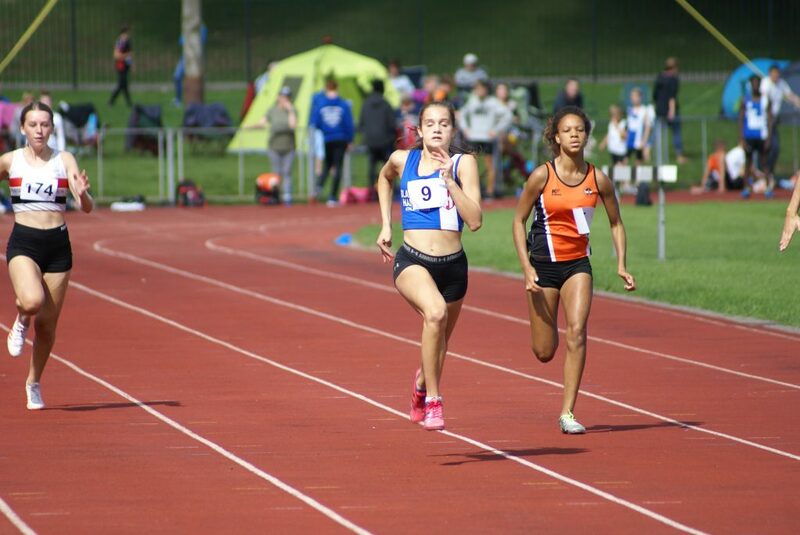 Myah was in Heat (3) and came home 3rd in 11.90 making her 9th overall in the three Heats, just missing out on the Final by one place. 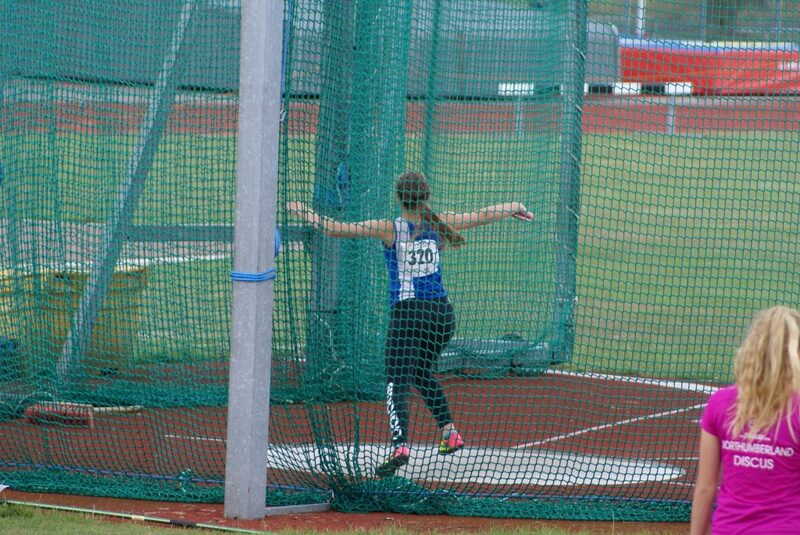 She had also entered the Shot Putt placing 10th in the Final with a distance of 10.21m. 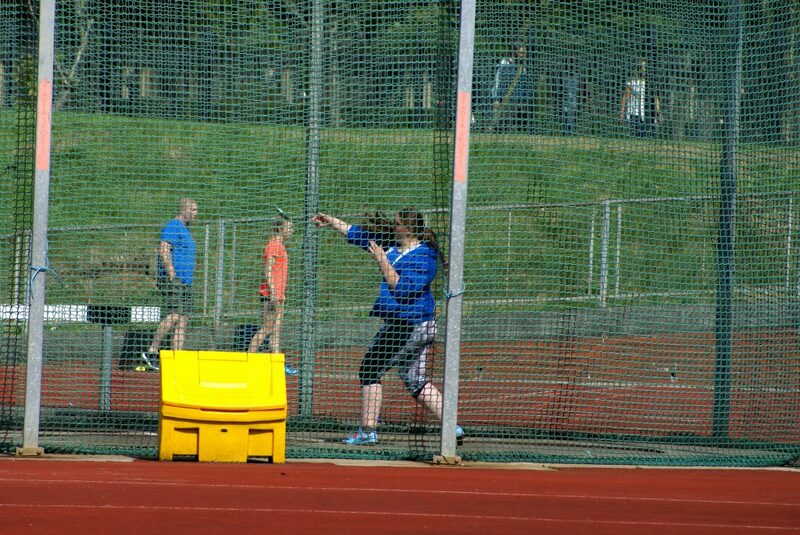 U15 Nicky Saunders was also competing at the National Championships in the Discus, the day after competing in the Mid Lancs League Medal Meeting in Blackpool. 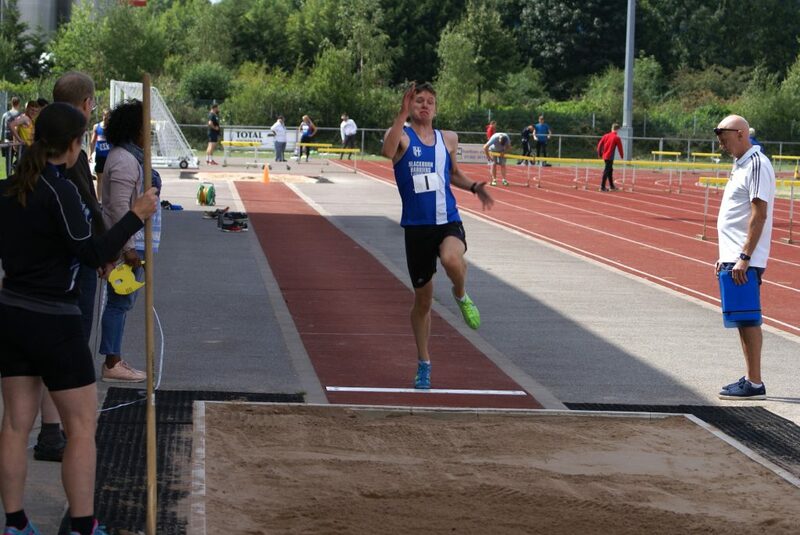 At the National Championships Nicky finished 8th in the Final with a distance of 27.55m. 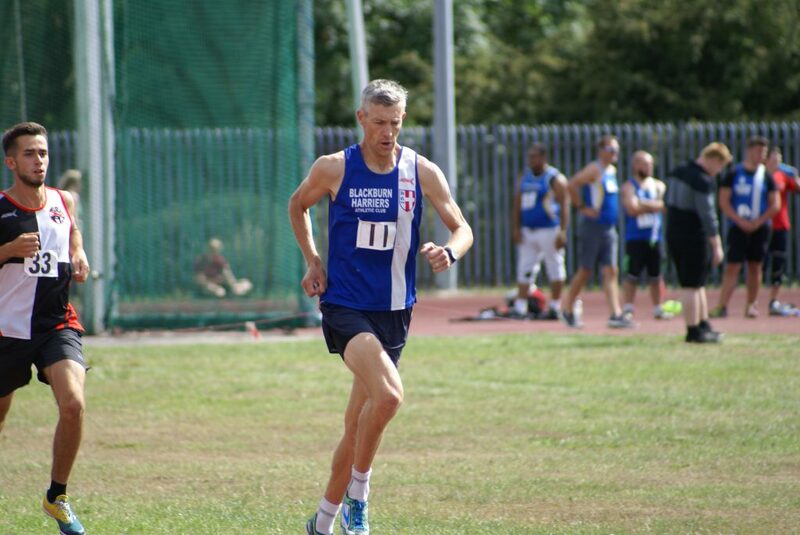 V50 Tony Balko has been targeing the British and World Masters Championship this year and the first Leg of that double took place over the weekend in Birmingham. 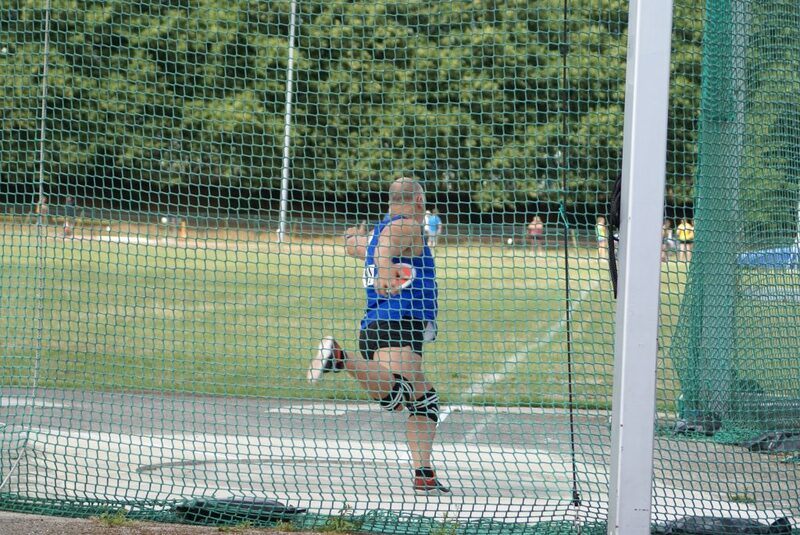 In the Discus Final Tony threw a little under his personal and seasons best (36.55m) to finish in 4th place. 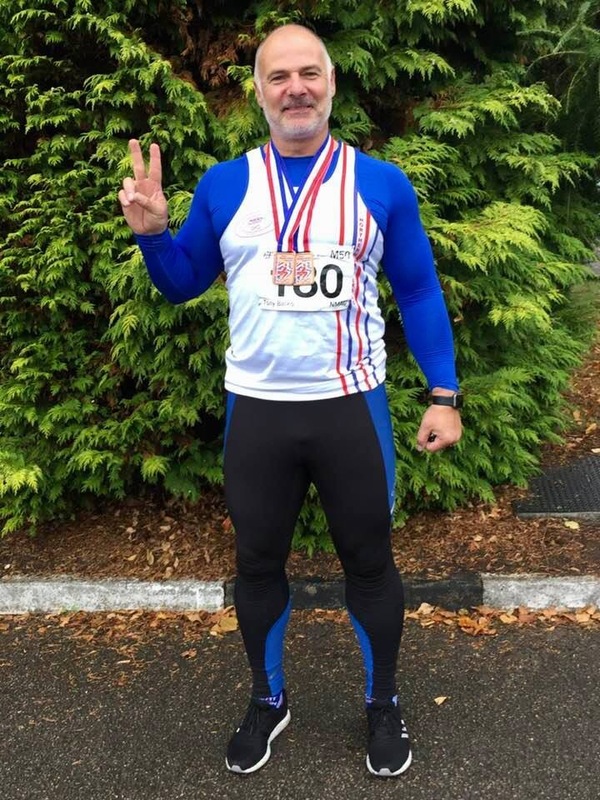 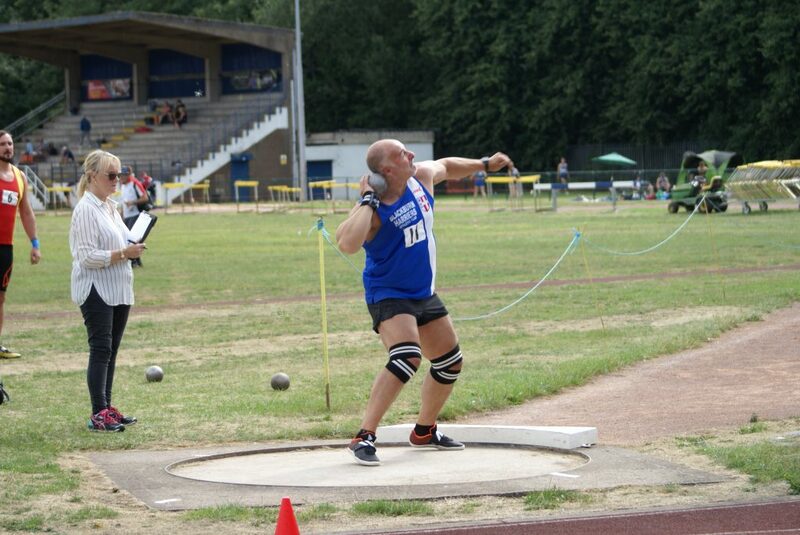 Despite the terrible weather conditions for throwing, Tony came away with two Bronze Medals which sets him up nicely for the World Masters Championships being held in Spain in September. 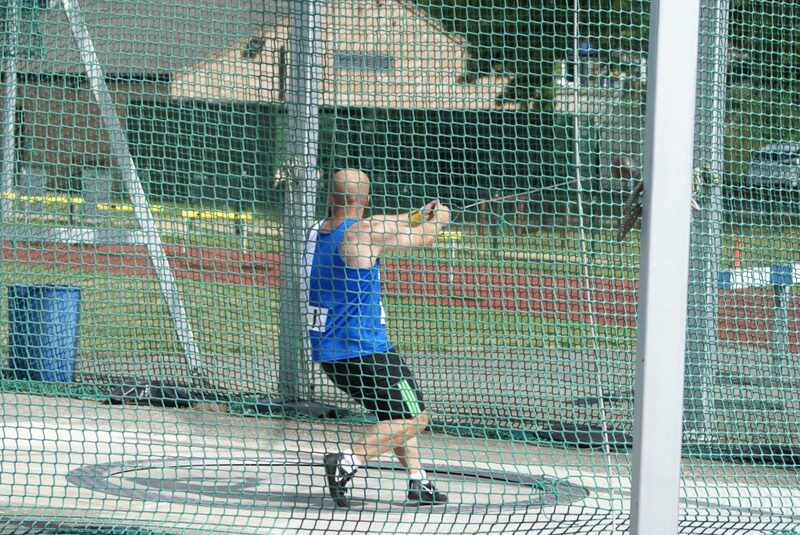 Tony’s Bronze Medals came in the Hammer (6kg) with 3rd place distances of 38.87m and in the Shot Putt (6kg) 10.35m. 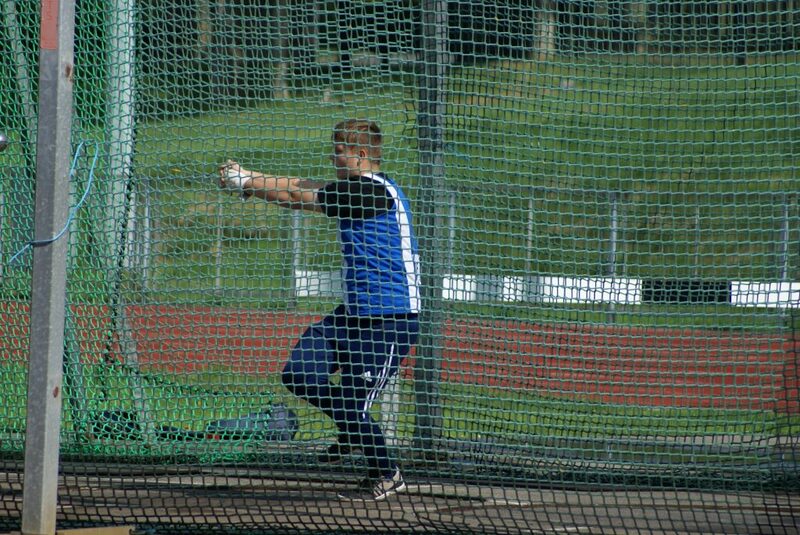 He also added two 4th place finishes in the Discus (1.5kg) with a throw of 36.55m and also 4th in the 11.34kg Weight (12.11m). 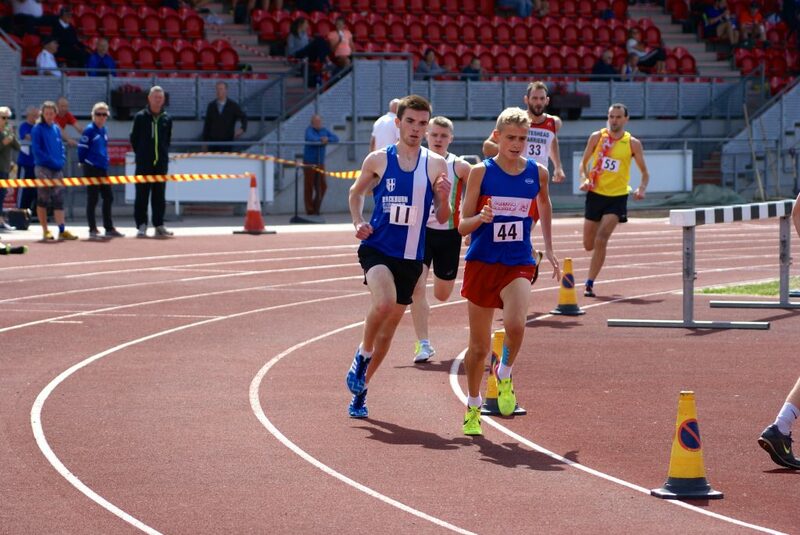 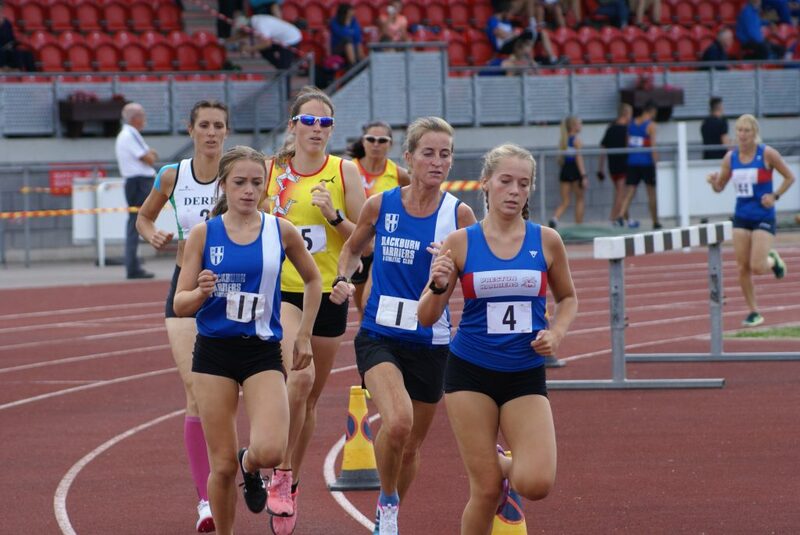 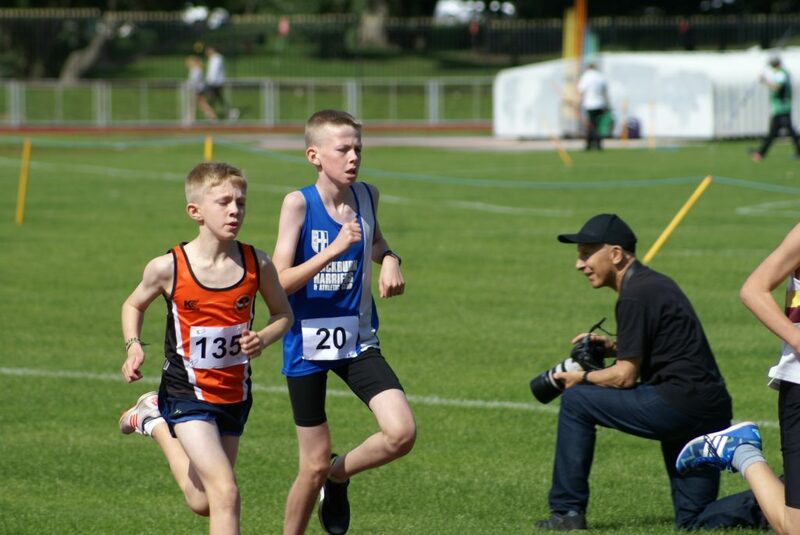 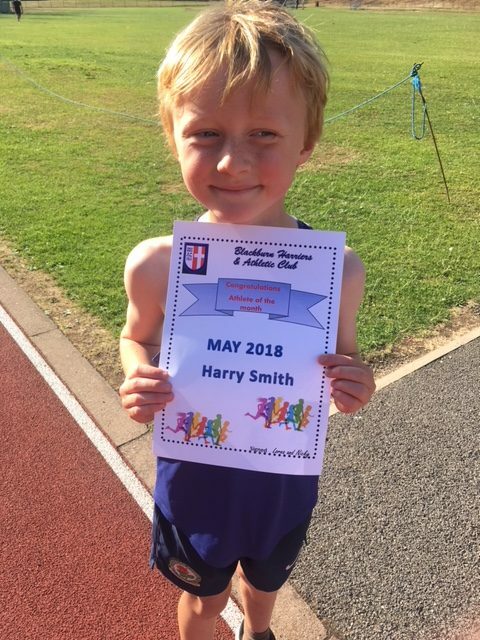 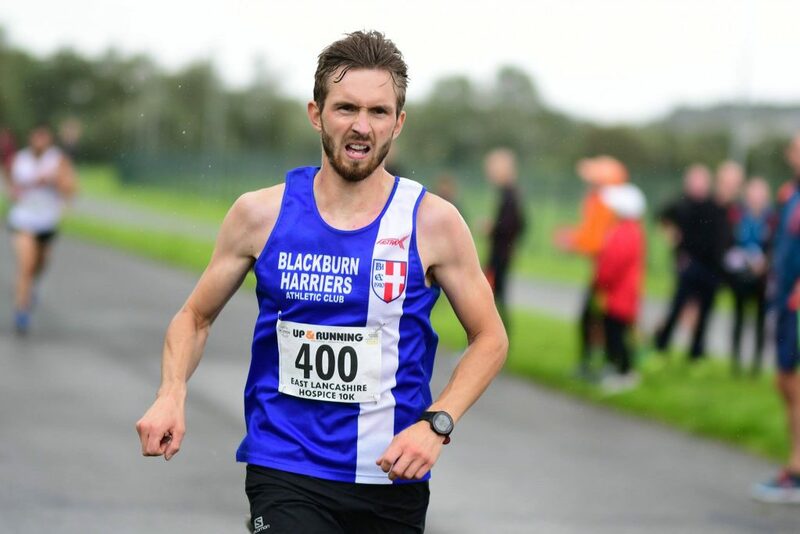 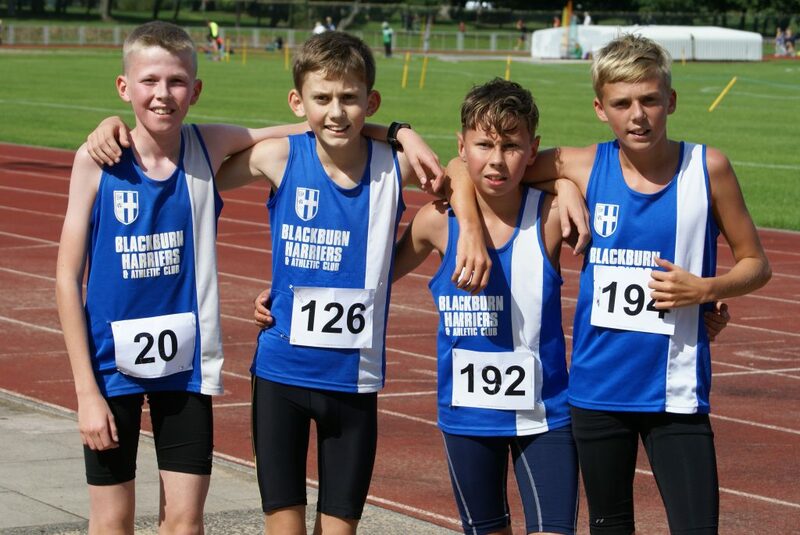 Another Mid Lancs Track & Field season came to an end on a warm but windy day in Blackpool with athletes from affiliated Clubs competing for Medals and among them – thirty two from Blackburn Harriers who set fourteen new personal bests and fourteen wins. 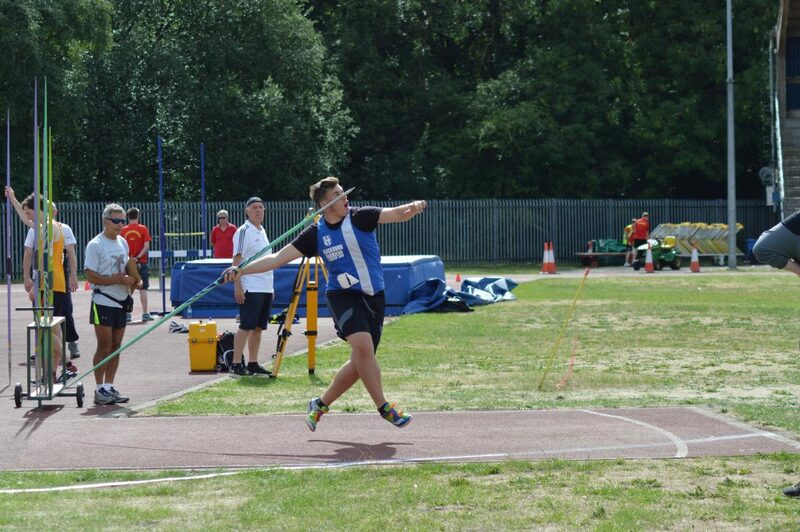 Anthony Kent (U20) is finishing the season in style with a new PB in the Senior Men’s Hammer (7.26kg) of 42.82m, over 3 metres further than he has thrown this season. 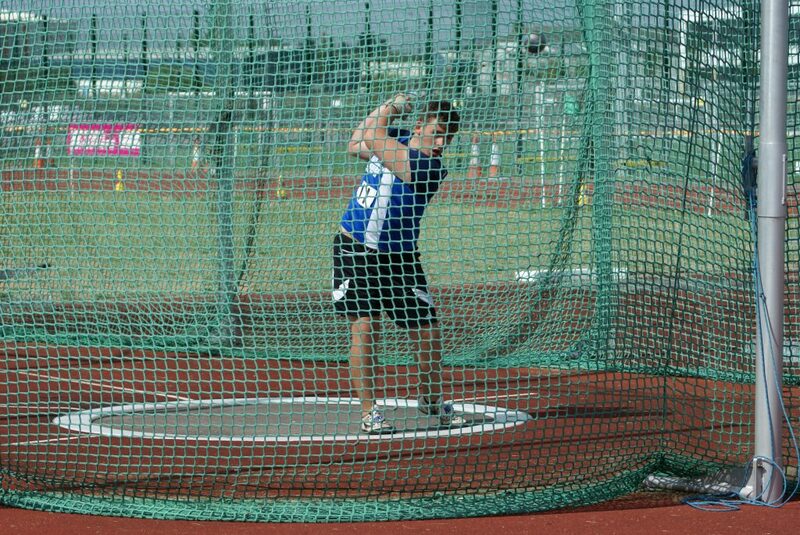 He backed that up with a 2nd place in the Discus with 30.78m and 3rd in the Shot Putt (10.84m). 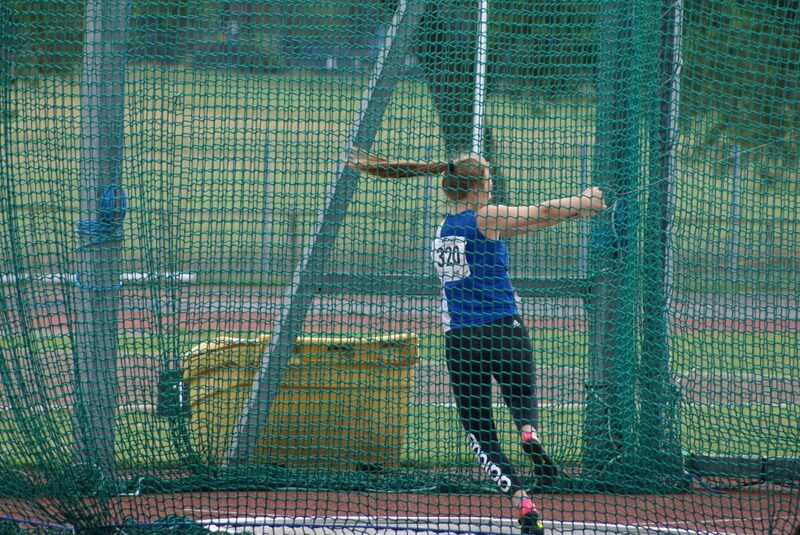 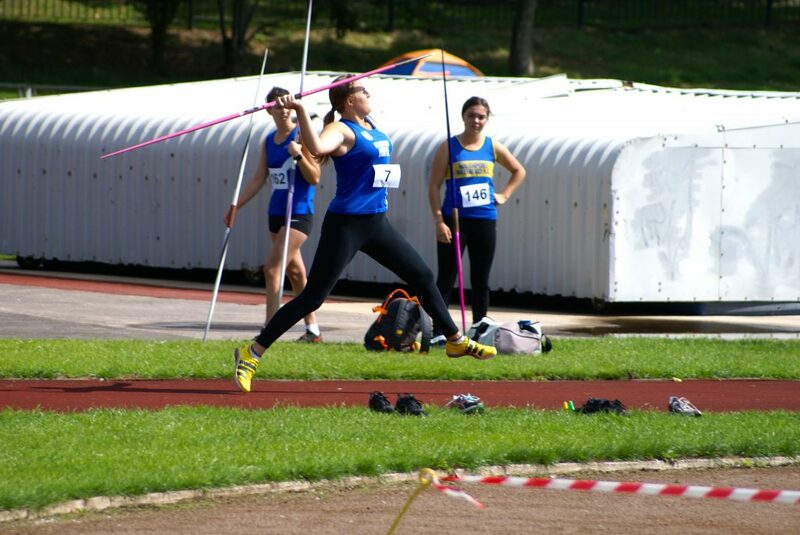 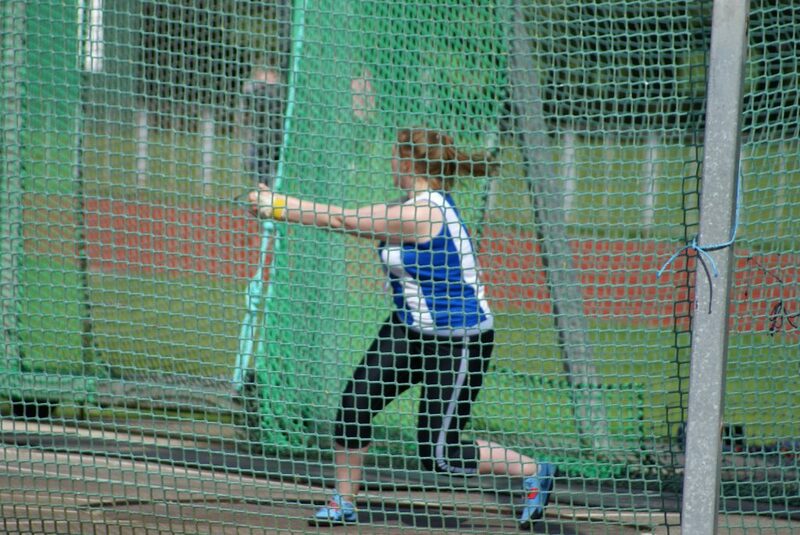 Similarly in the Senior Women’s Throws events where Anna Peers has wracked up a whole number of wins in this years Northern League and taking a win and two seconds places today – throwing 35.53m to win the Discus, 9.40m in 2nd spot in the Shot Putt, rounding off the day with a throw of 35.92m in the Javelin for 2nd place. 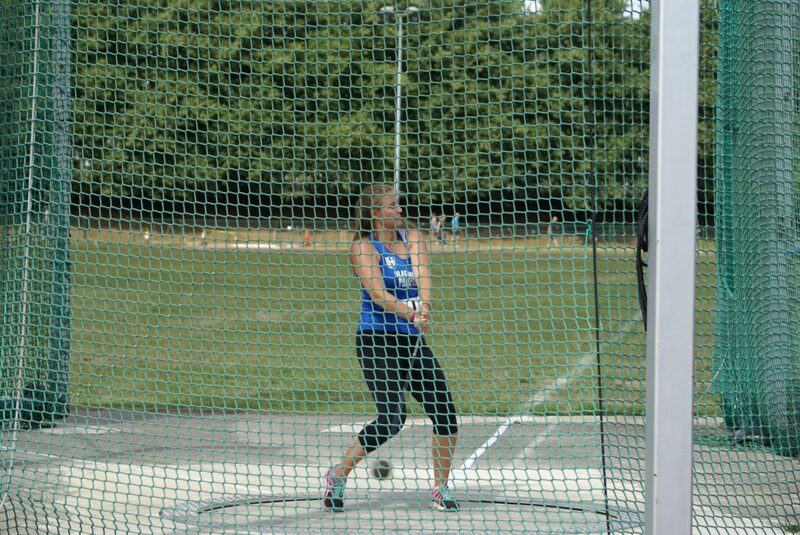 U17 Abigail Brown took on three throws events too, placing 6th in the Shot Putt (6.79m), 3rd in the Discus (21.85m) and 4th in the Hammer with a throw of 30.83m. 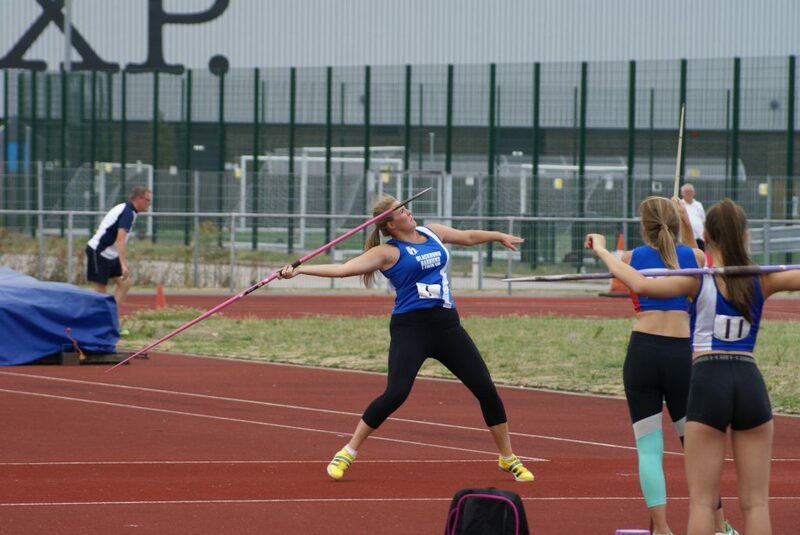 U17 Millie Coy was looking to Medal in the Javelin and placed 5th with a throw of 29.58m. 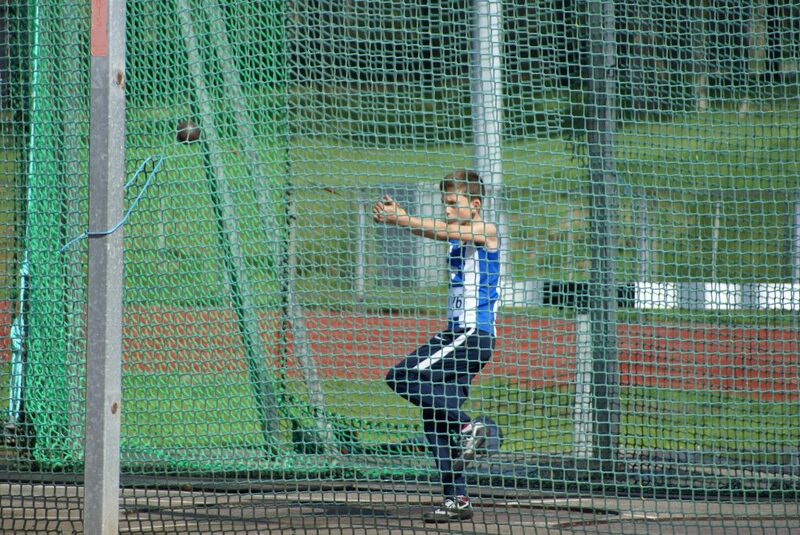 U15 Matt Heywood is another young athlete who has had a very good season in Throws events as evidenced by his performance here. 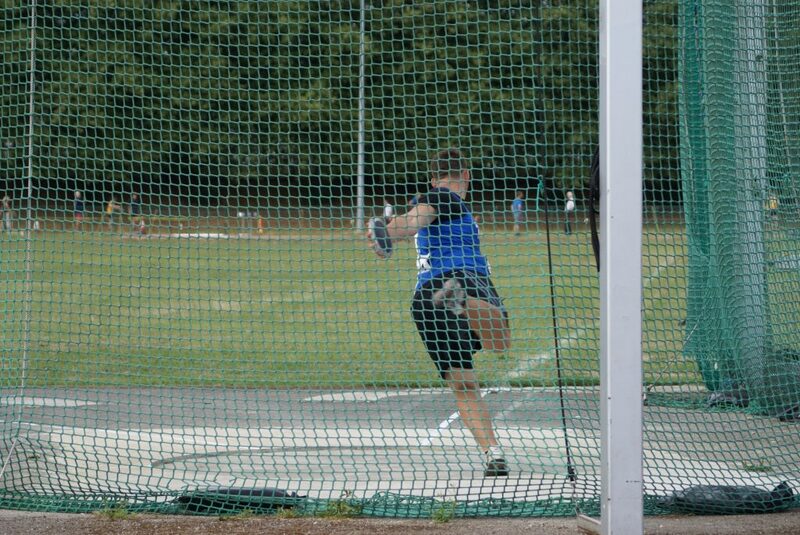 In winning the Hammer with a throw of 41.69m he showed how far he has progressed from his first ever Hammer throw of 23.33m just 12 months ago. 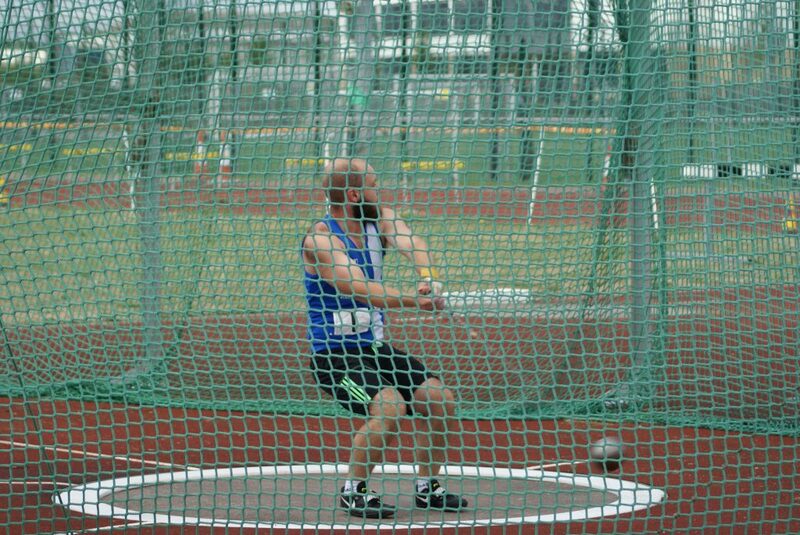 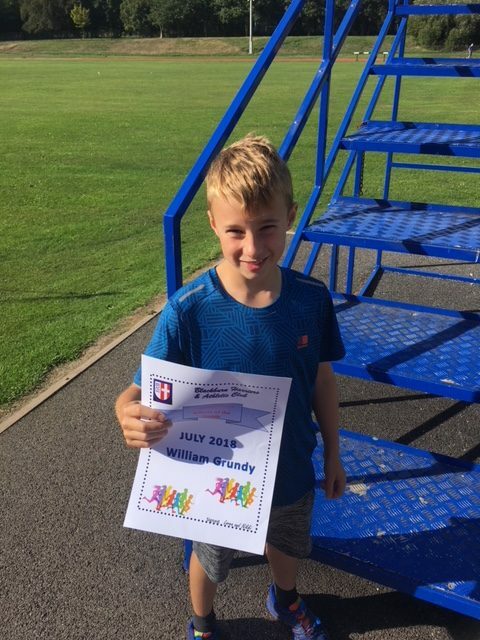 He came 3rd in the Shot Putt with 8.79m and won the Discus with a new PB distance of 31.49m – an improvement by over two metres. 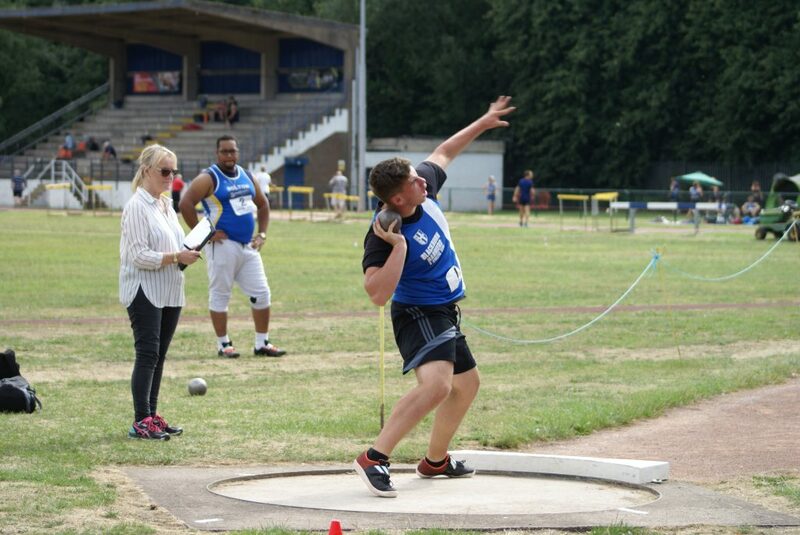 George Whittaker and Kyle Taylor-Pomfret were also contesting the Throws with George coming home 4th in the U15 Boys Discus (26.30m) and Kyle 2nd in the Hammer with 24.51m and just outside his personal best. 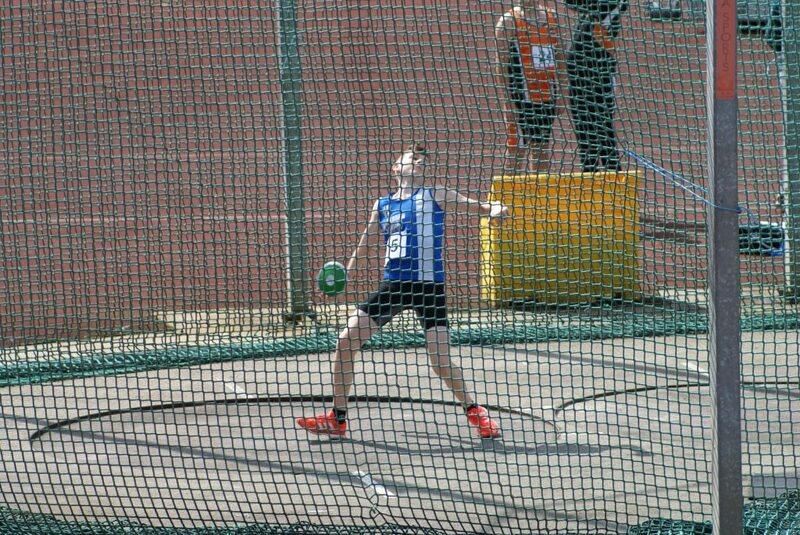 U13 Dexta Thompson had a go at the Throws events placing 2nd in the Javelin with 23.68m – just 7 cms off his best and 3rd in the Discus with his second ever attempt at the event (13.22m). 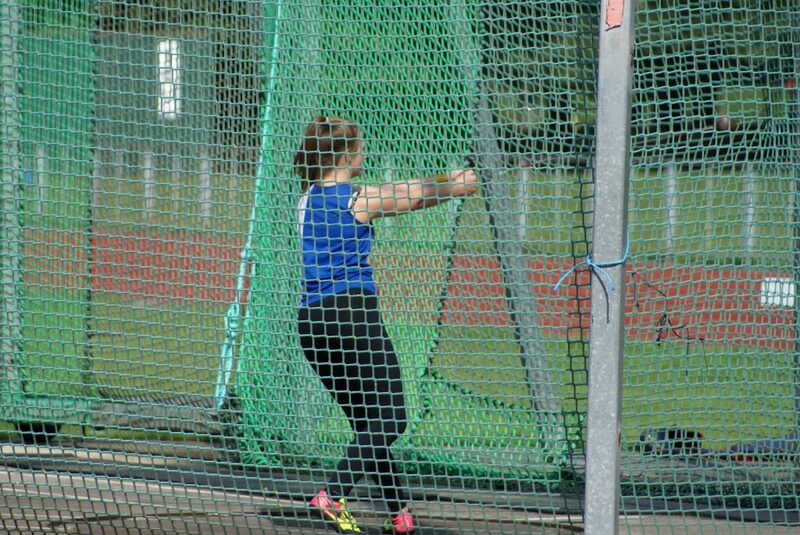 U15 Grace Bontoft is in her first competitive season in Throws and took on Shot Putt, Discus and Hammer recording 6.52m in the Shot Putt (5th), 15.18m in the Discus (6th) and 25.88m in the Hammer placing 4th. 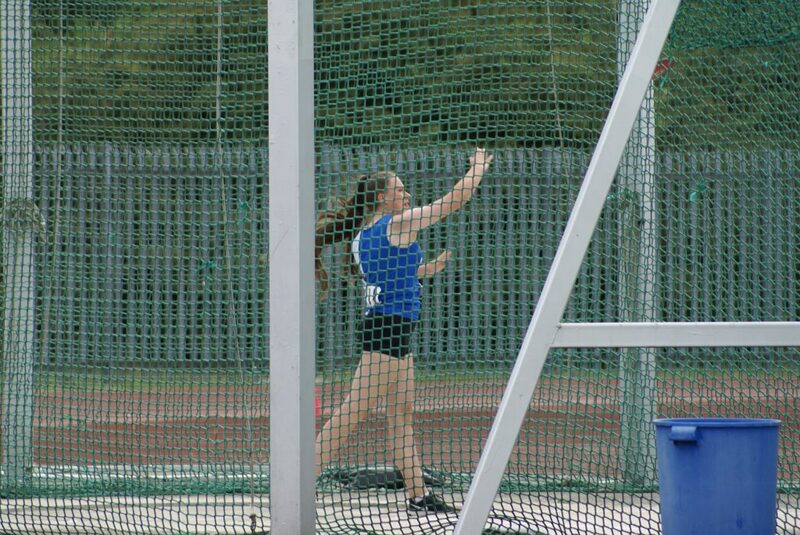 Nicky Saunders continued her good season by winning the U15 Girls Discus (28.89m) and a new PB by just 3cms, won the Hammer with a throw of 34.77m – a massive new PB by over 3 metres and finished 5th in the Javelin with 23.68m. 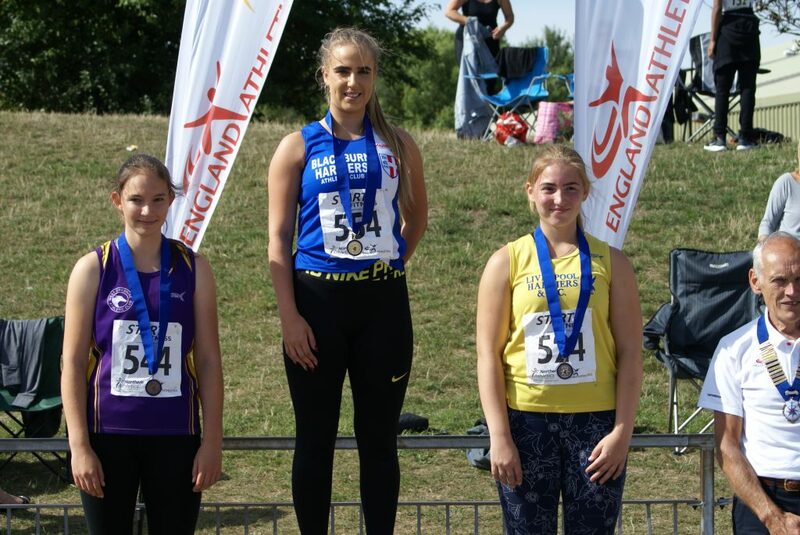 Madison Bontoft (U13) and also in her first competitive season in Throws nearly doubled the distance she has thrown in the Shot Putt as she reached a distance of 6.50m for a massive new PB, and set another new PB in the Javelin by a metre, throwing 12.19m in 9th position. 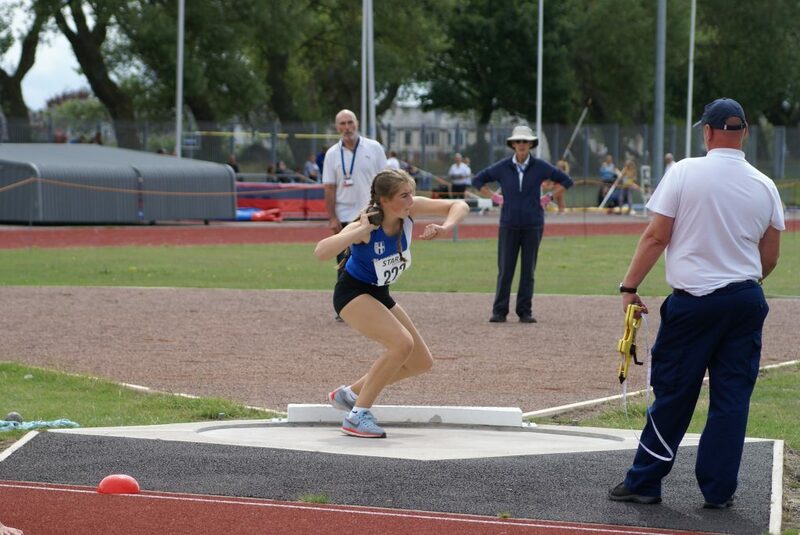 Caroline Woodworth took on the U13 Girls Discus, placing 6th with 16.67m and 5th in the Javelin with a throw of 17.75m. 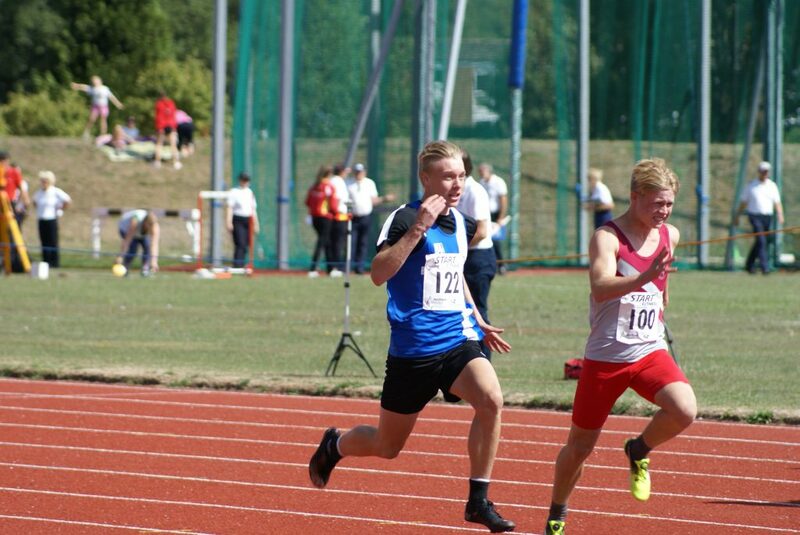 U17’s Solomon Brown and Benjamin Whittaker were in action in the Sprints which saw Benjamin finish 3rd in Heat (2) of the 100m in 12.10 a new PB by two tenths and 6th in the 200m Heat (1) clocking 24.90 – Solomon came home in 5th in Heat (1) of the 200m posting a time of 24.40, a new PB by nearly a second. 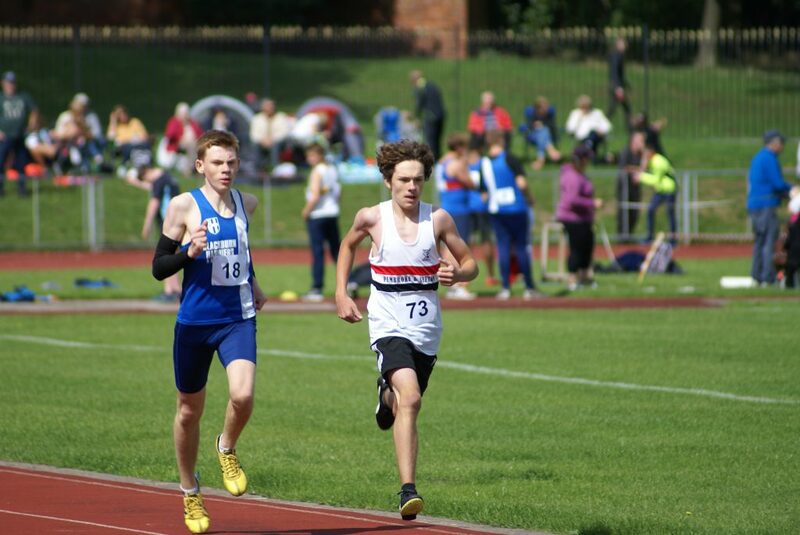 U15 Ben Boocock ran his first ever 100m race clocking a time of 13.50 in 8th place whilst George Whittaker ran 26.80 in the 200m for a new PB by two tenths. 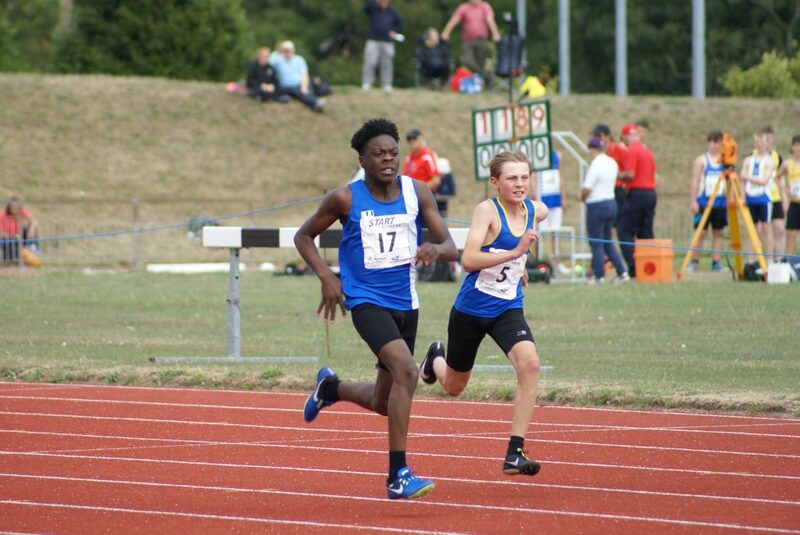 U13 Tobi Olidapo has made a very big impression in his first season sprinting for the Club and ran well again today to record a time of 13.00 in 3rd place in Heat (1) of the 100m. 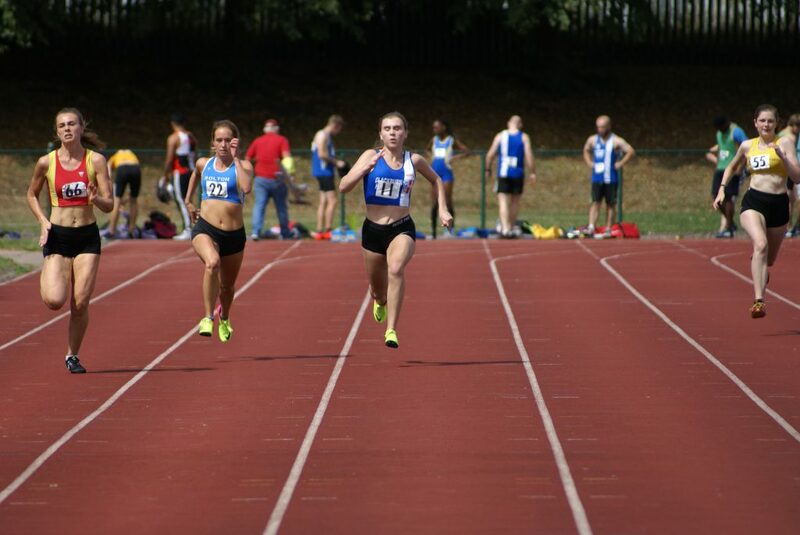 The entries in the Senior Women’s Sprints were sparse to say the least with just two athletes in the 100m and 200m – Chloe Bleeks won both races comfortabley running 13.50 in the 100m and 28.10 in the 200m. 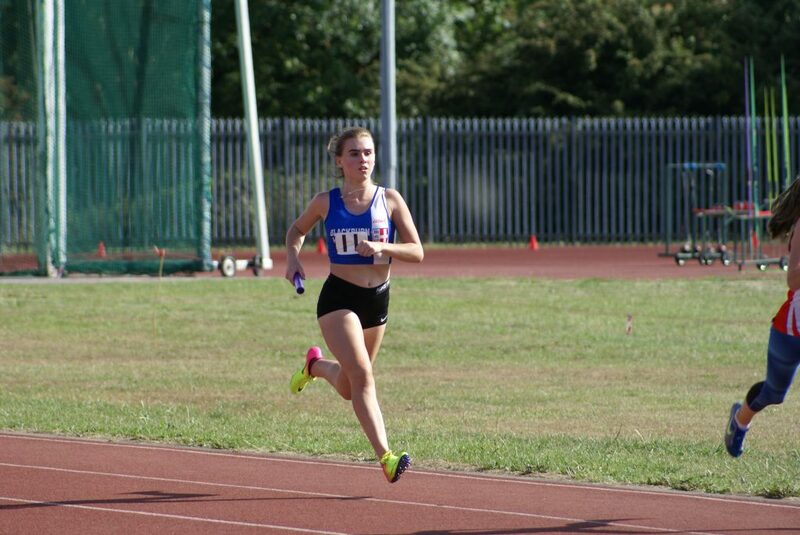 U17 Millie Coy knocked two tenths of her previous best time to set a new PB of 13.10 as she won Heat (1) of the 100m, going on to come a very, very close 2nd in the 200m with 27.10 – the same time as given to the winner. 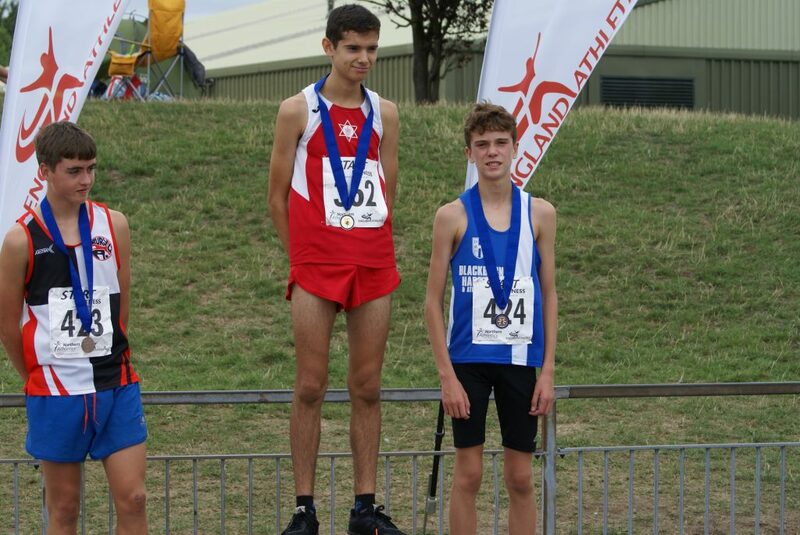 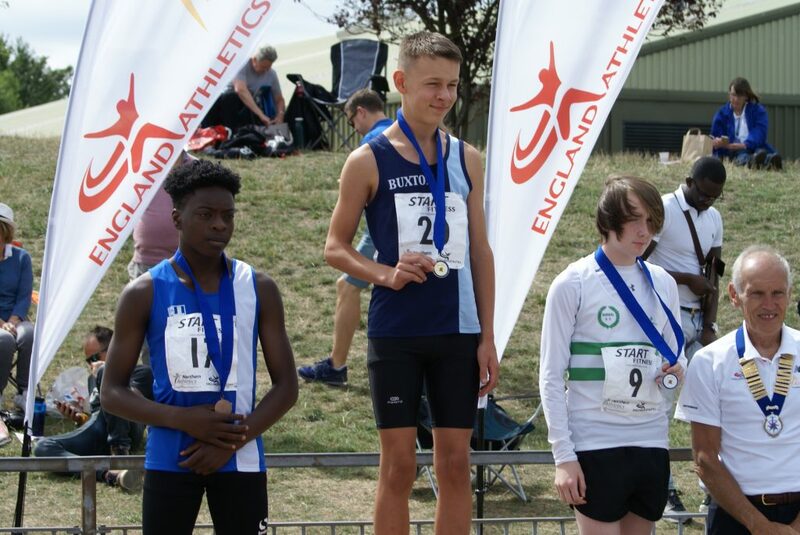 U17 Ben Branton is his first season as a Long Jumper and showing real promise, has only had five competitions leading up to the this years Medal Meeting. 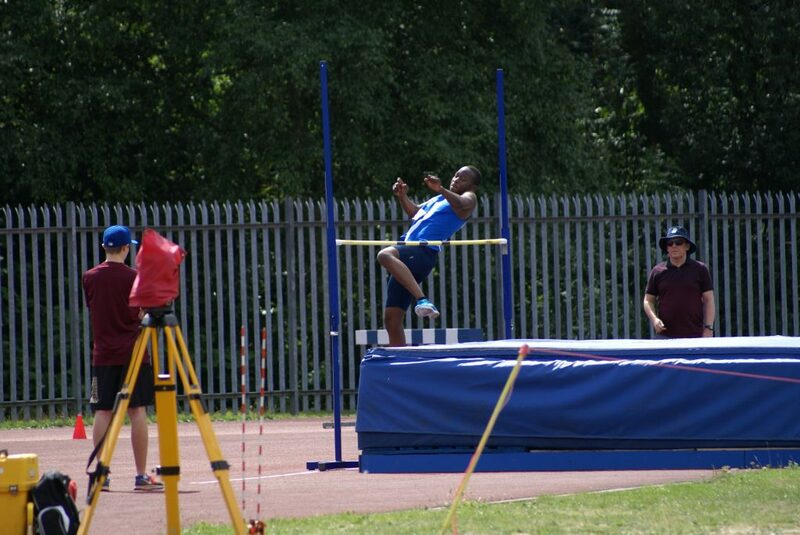 He kicked off his season with a jump of 5.11 and yesterday he leapt out to 5.75m for a new PB in 3rd place. 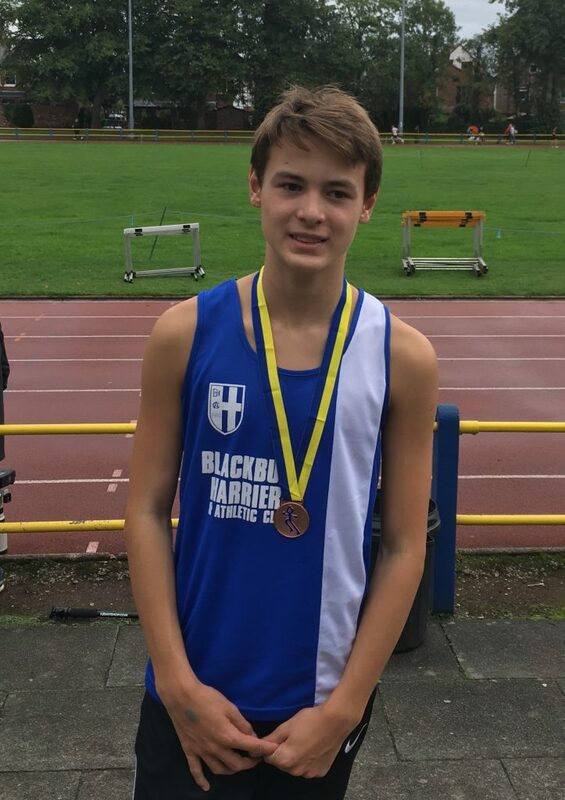 800m runner – U15 Hayden Mercer – has jumped just once ever in the Long Jump (3.92m) and today in only his second ever attempt leapt out to a new PB of 4.69m (5th). 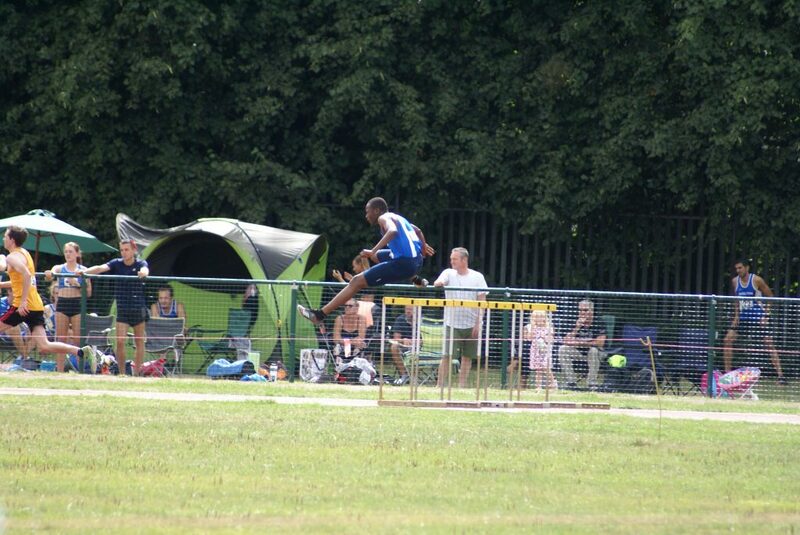 U13 Tobi Olidapo was one of twelve athletes in the U13 Boys Long Jump where he placed 6th with a leap of 4.21m. 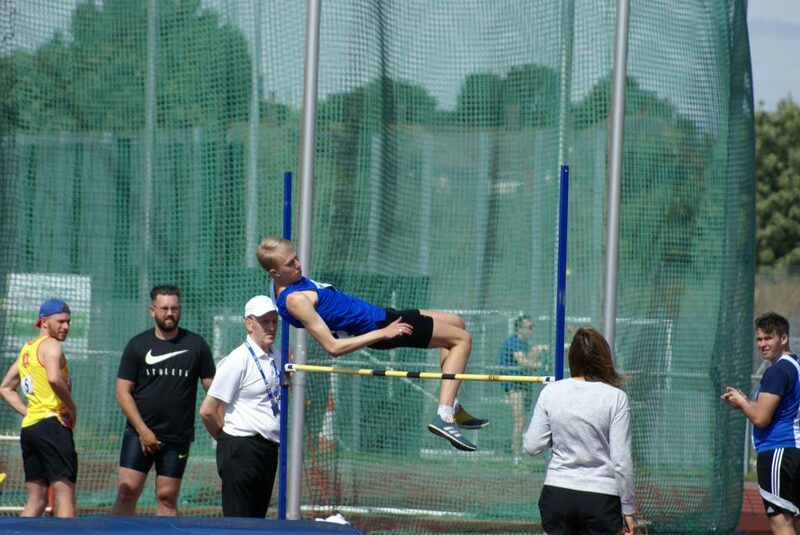 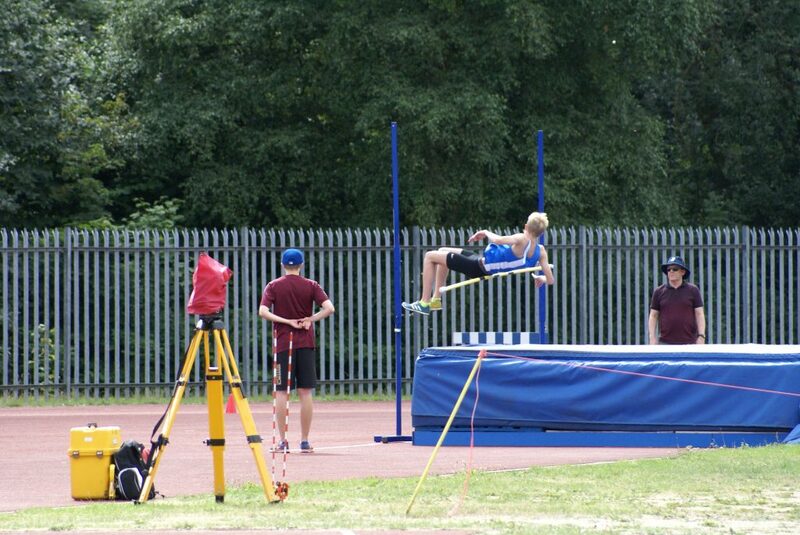 It’s great when young athletes take on a new event and it comes off as it did for U13 Daniel Smith clearing 1.30m in the High Jump (4th) with Dexta Thompson in equal 6th place. 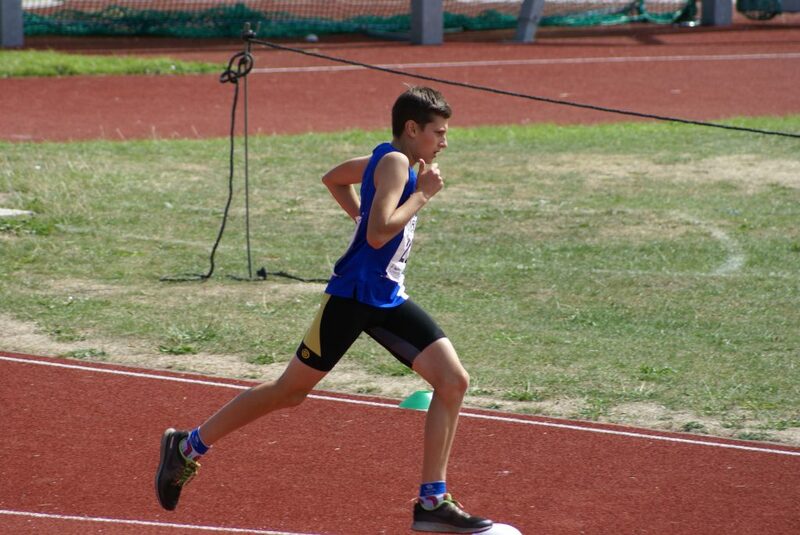 (1.10m). 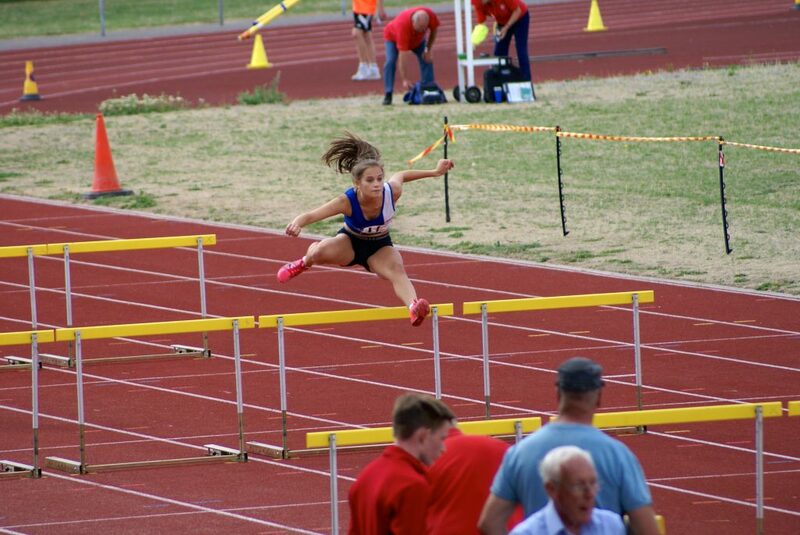 Chloe Bleeks added a 2nd placed jump of 4.24m to her two wins in the Sprints events as U13 Kady Thompson cleared 1.15m in the High Jump to equal her personal best. 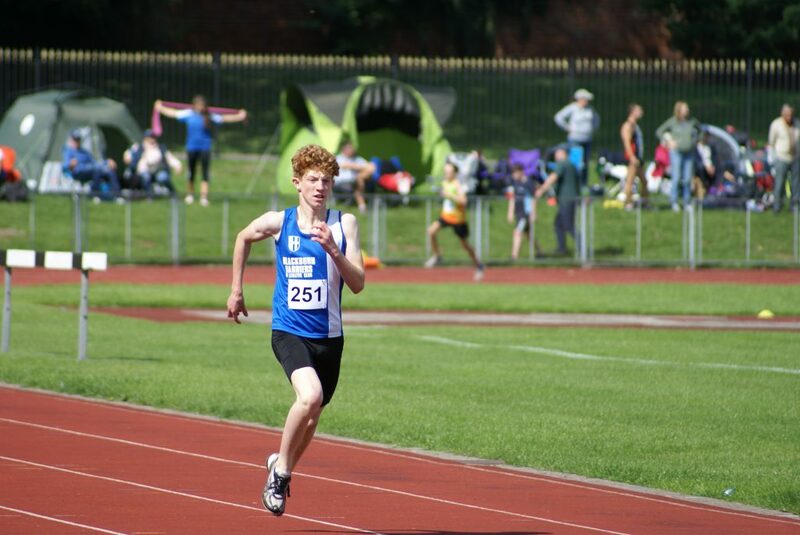 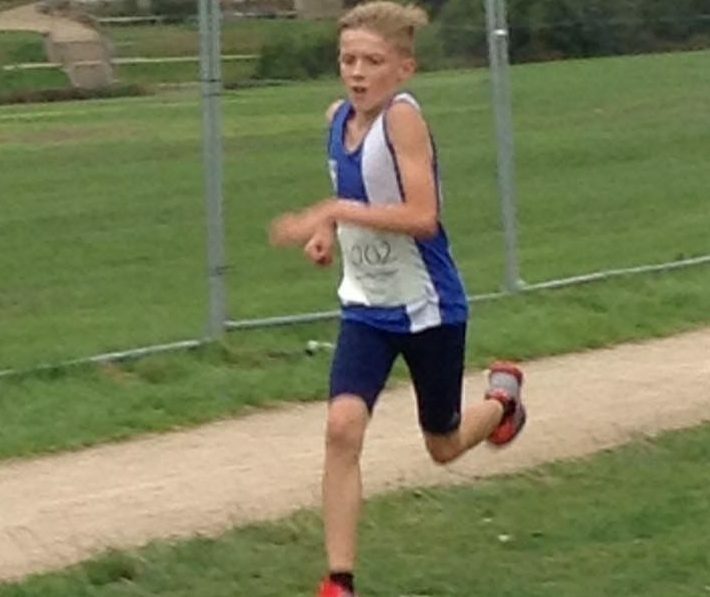 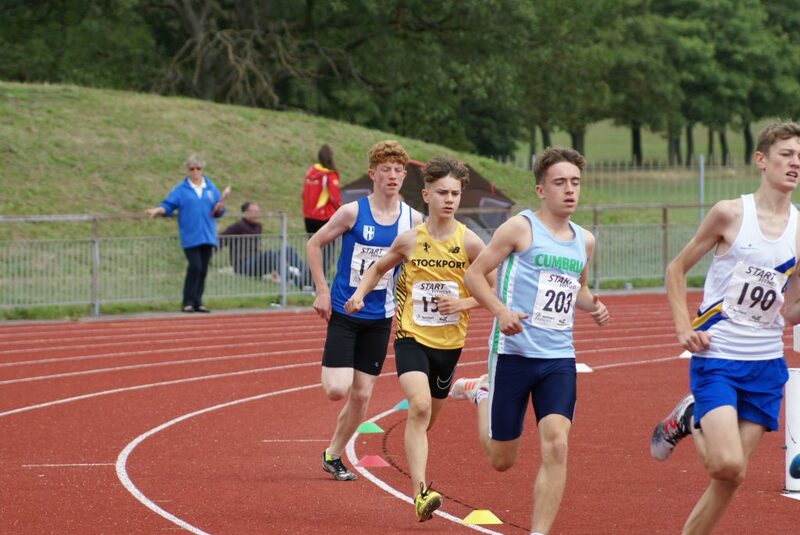 Another athlete trying an event for the first time was U15 Hayden Mercer who took on the 400m winning in a time of 57.30, a time which suggest a revision of his 800 personal best. 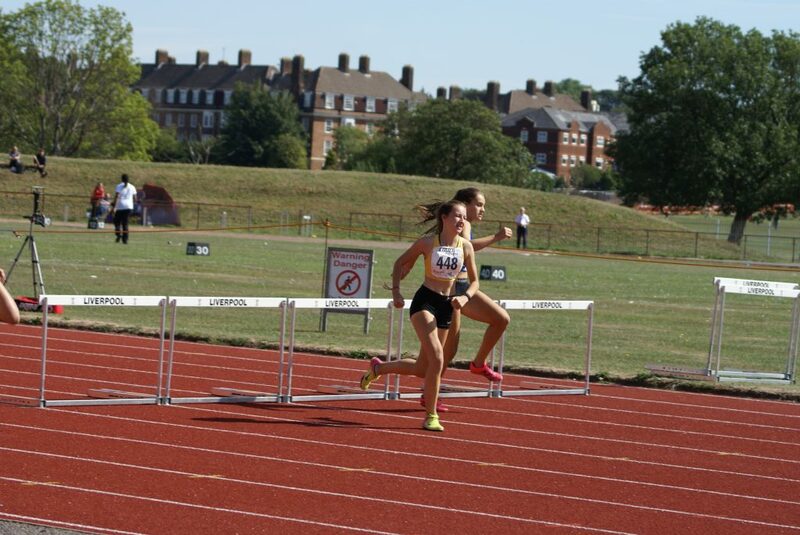 The windy conditions meant that personal bests would be at a premium in the middle distance events with a strong win going down the back straight. 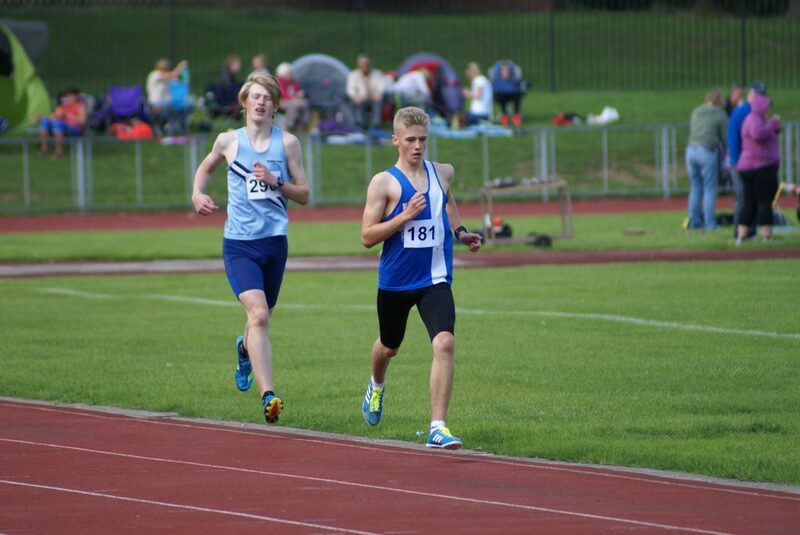 Sam Hodkinson ran 4.39.60 for 2nd spot in the U17 Men’s 1500m. 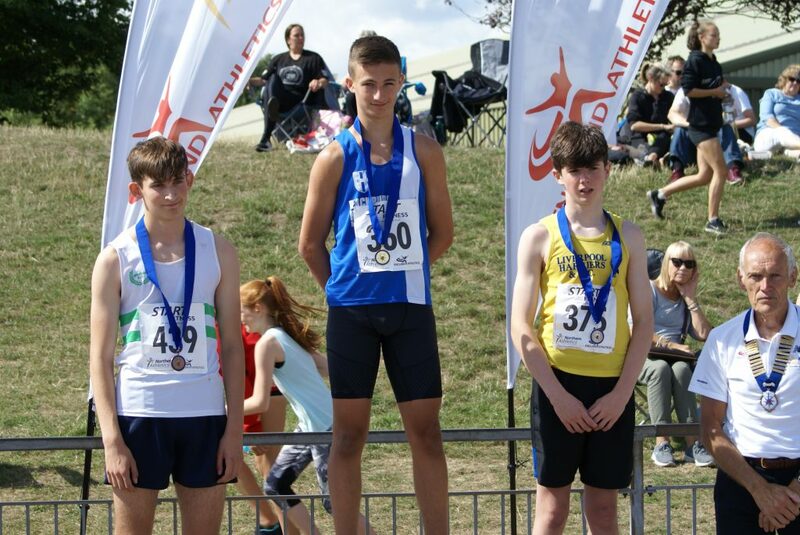 In the U15 Boys 800m George Whittaker tried to lead from the front and paid the price a little as he finished in 2nd place with 2.24.90. 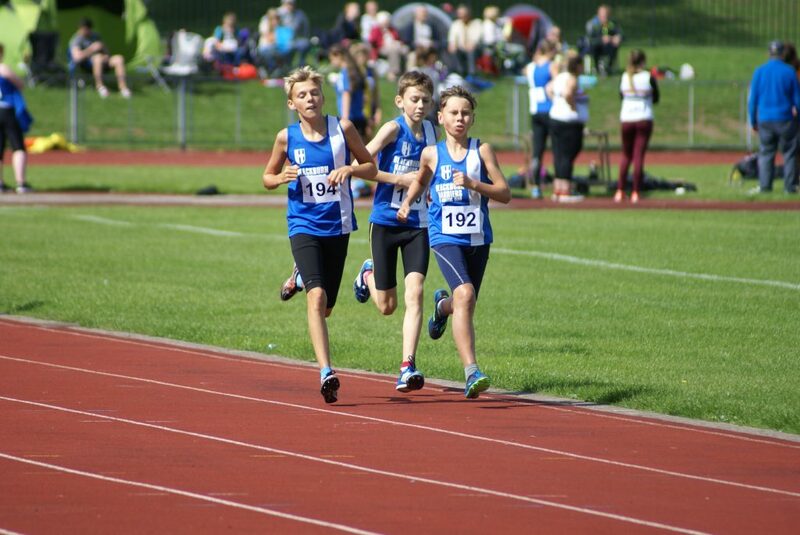 The U13 and U15 Boys ran together in the 1500m which resulted in a 1/2 for the Harriers in the U15 Boys – Kyle Taylor-Pomfret 1st in 4.54.20 and David Holman 2nd in 4.57.60 and a win for Isaac Butler in the U13 race as clocked 5.01.90 with Daniel Smith chopping five seconds off his best time to set a new personal best of 5.20.20 in 3rd place. 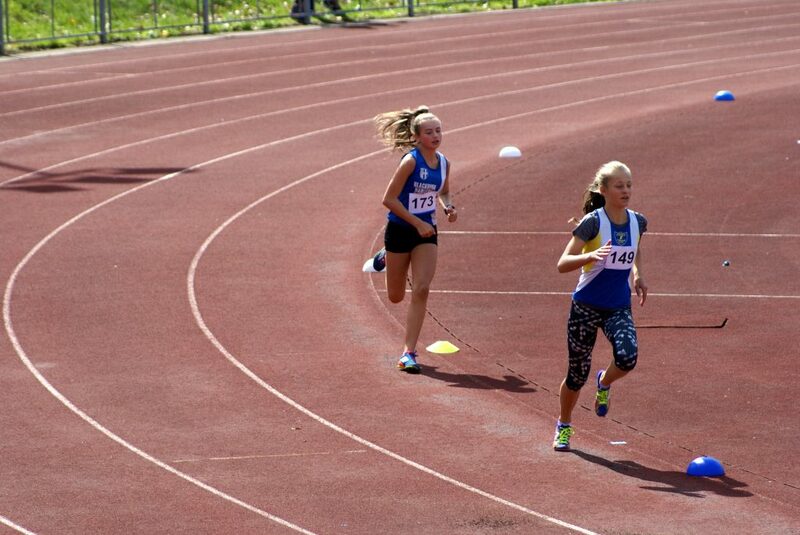 In the U15 Girls 800m which only had two athletes competing, Leah Hoole placed 2nd in 2.37.20 and Kady Thompson ran 3.07 in the U13 Girls 800m. 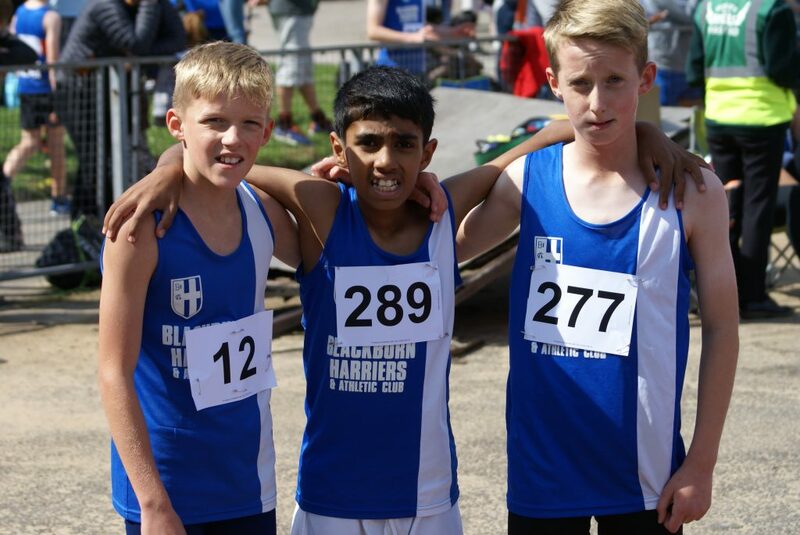 U13 Boys Ben Livesey, Codie Dewhurst and Umair Rafiq ran the 800m with Ben clocking a new PB of 2.39.50 in 4th place, Codie in 5th (2.40.70) and Umair running 2.45.70 in 7th. 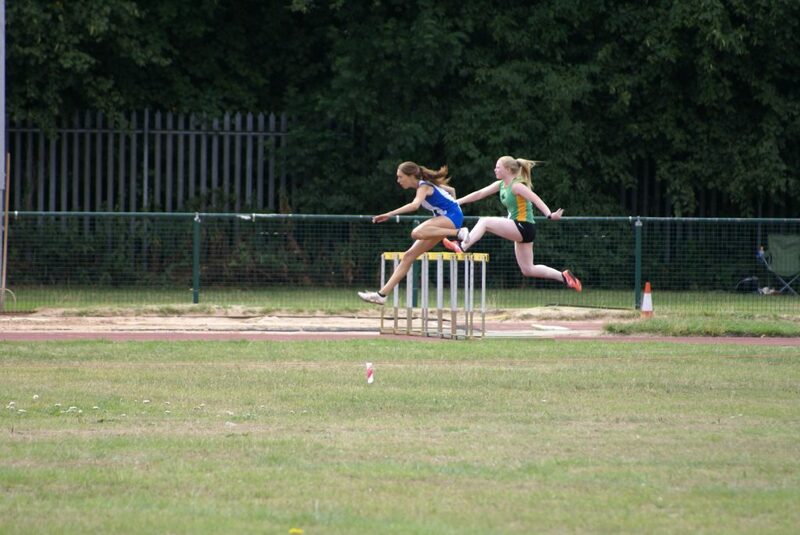 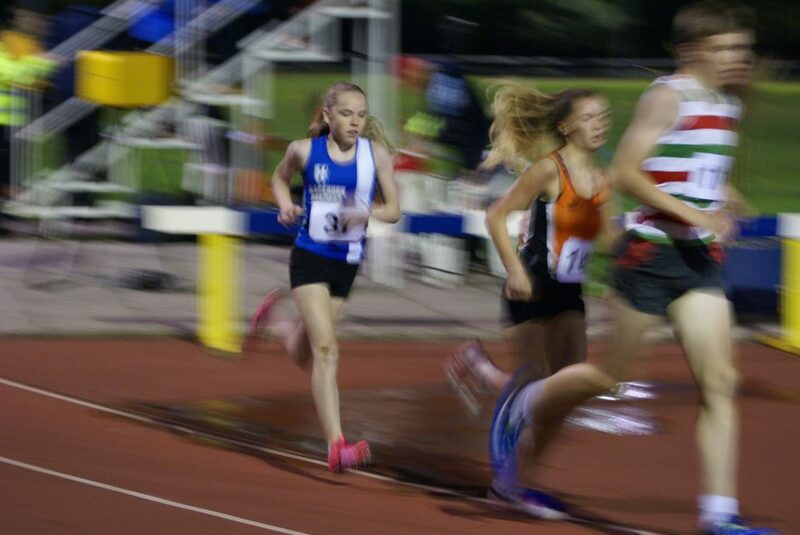 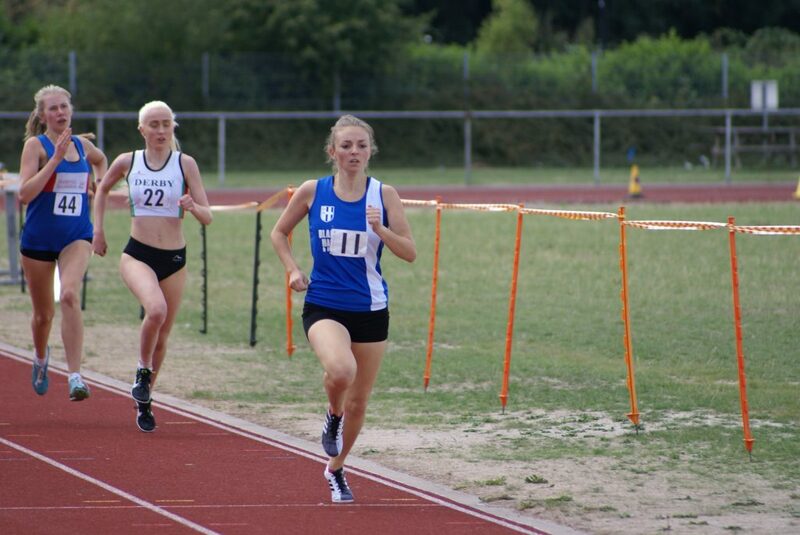 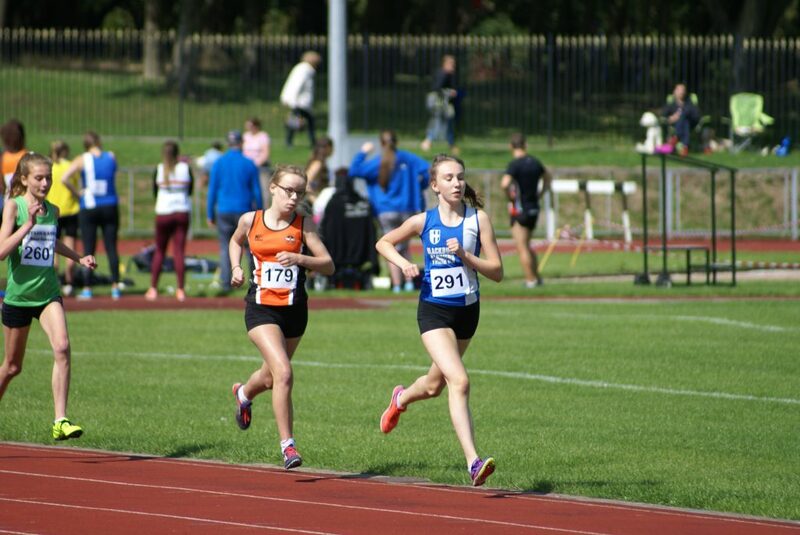 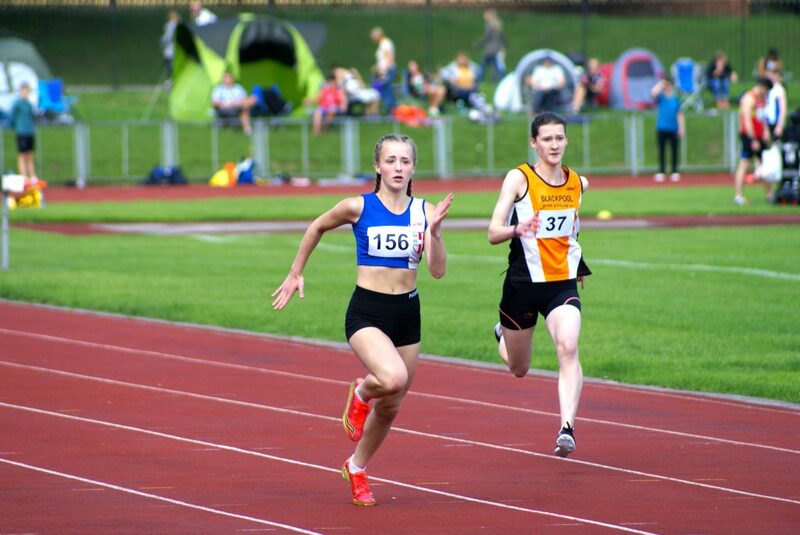 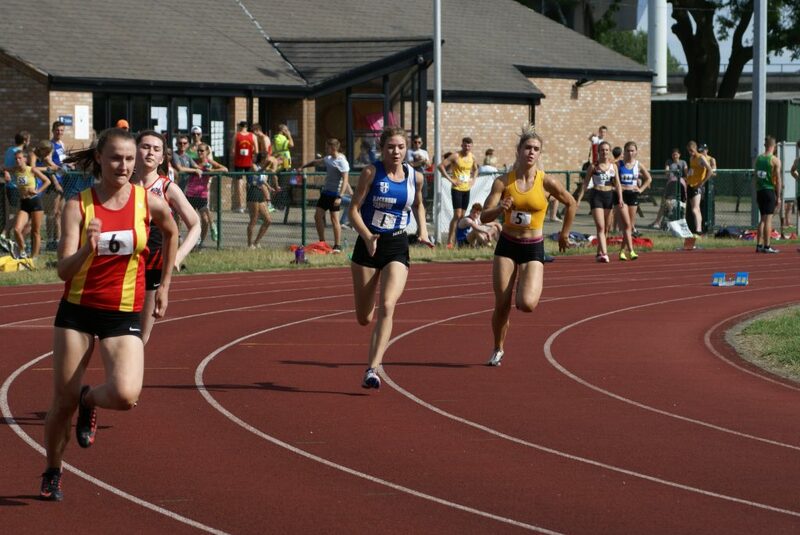 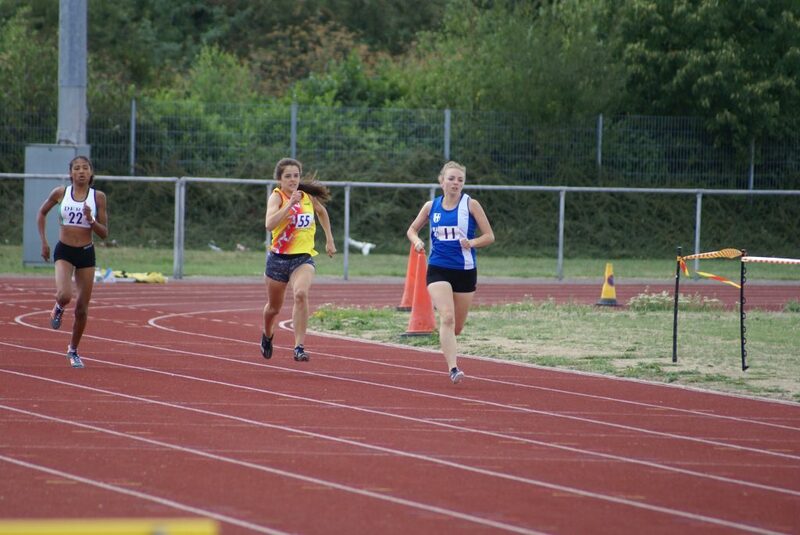 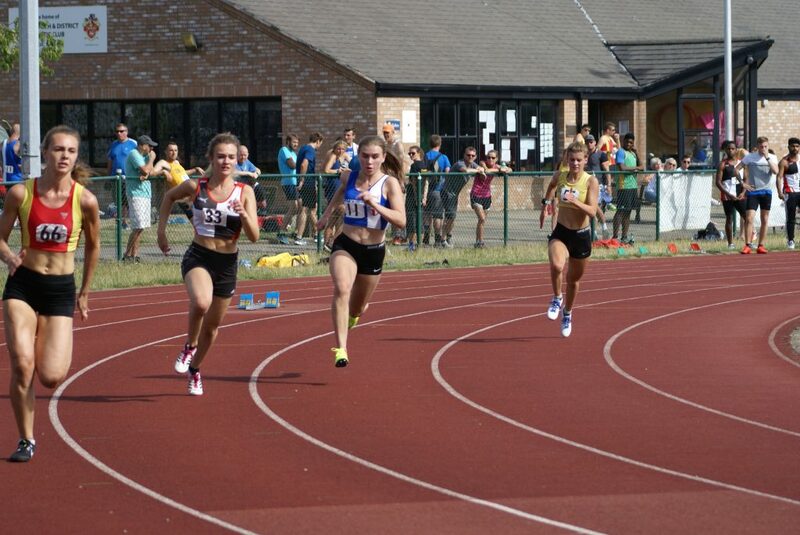 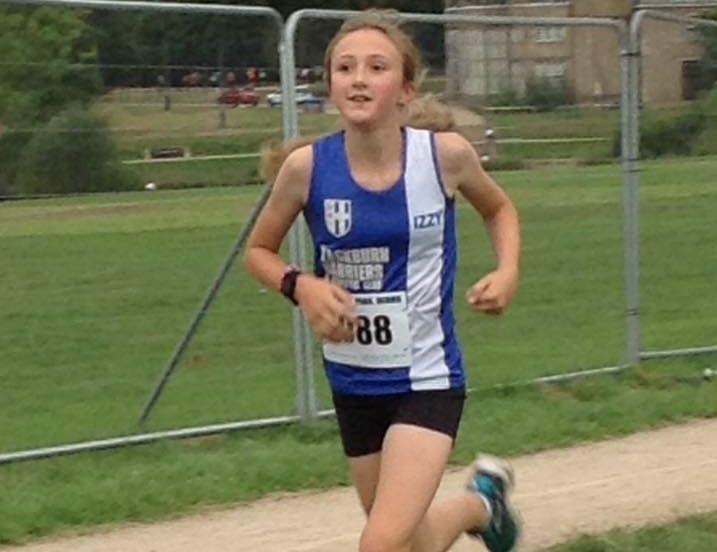 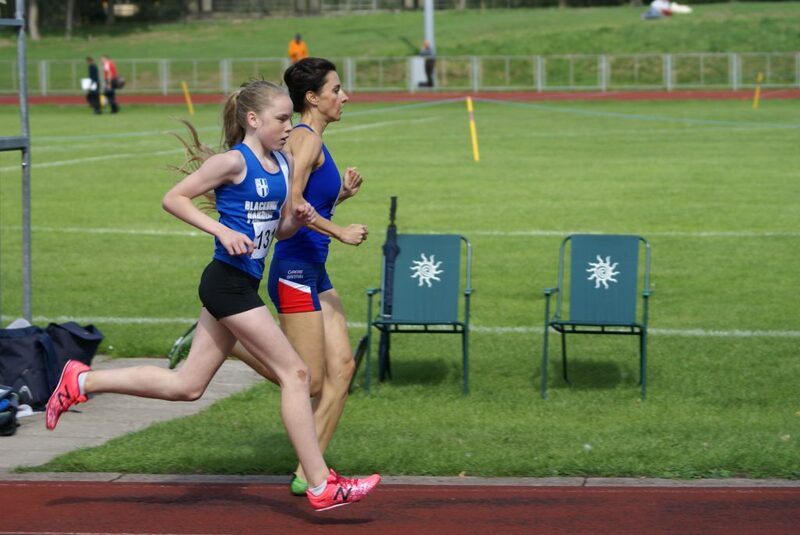 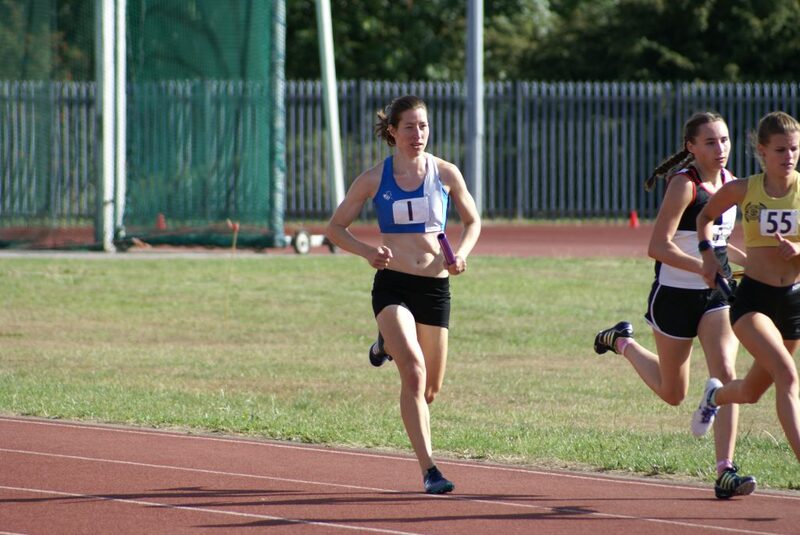 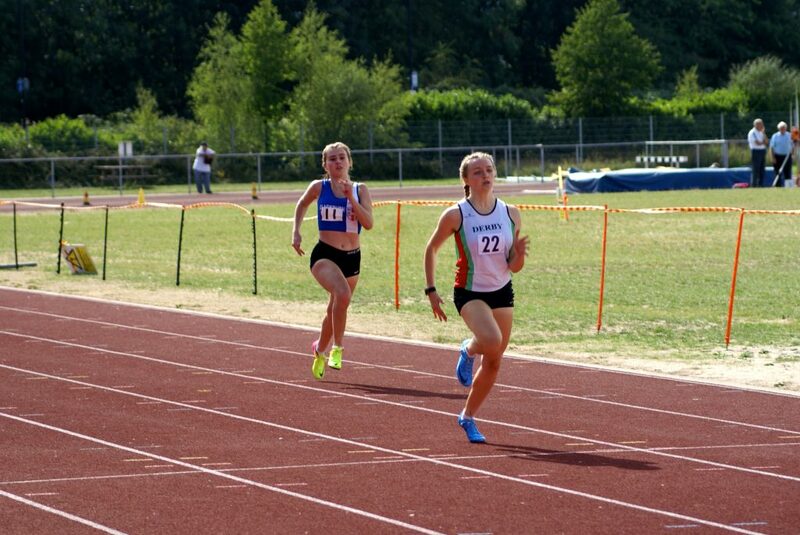 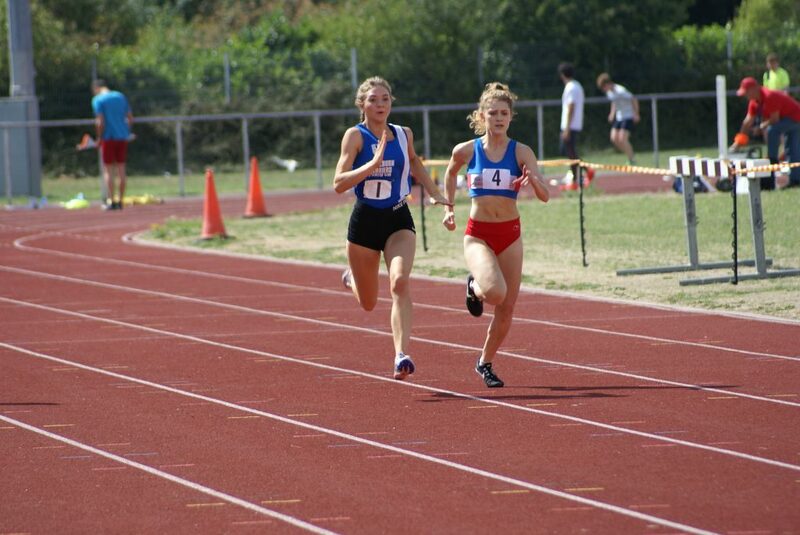 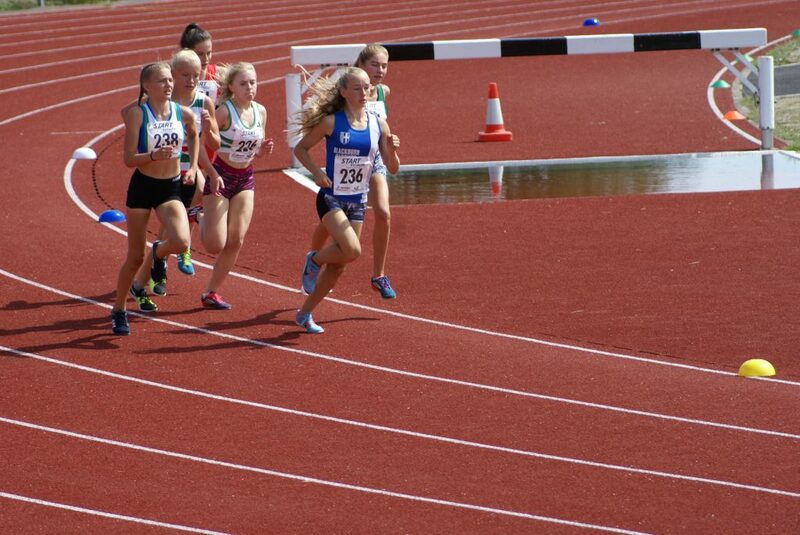 Amy Davies was the only runner unfortunately in the U17 Girls 1500m (5.07.00) as the Senior Women and U15 Girls all ran together – Hollie Cubbon snatched a win with a determined finish in the U15 Girls race on the line in 5.35.10 and in the U13 Girls 1500m Molly Grinshaw placed 5th in a time of 6.01.40 in her first race since June of this year. 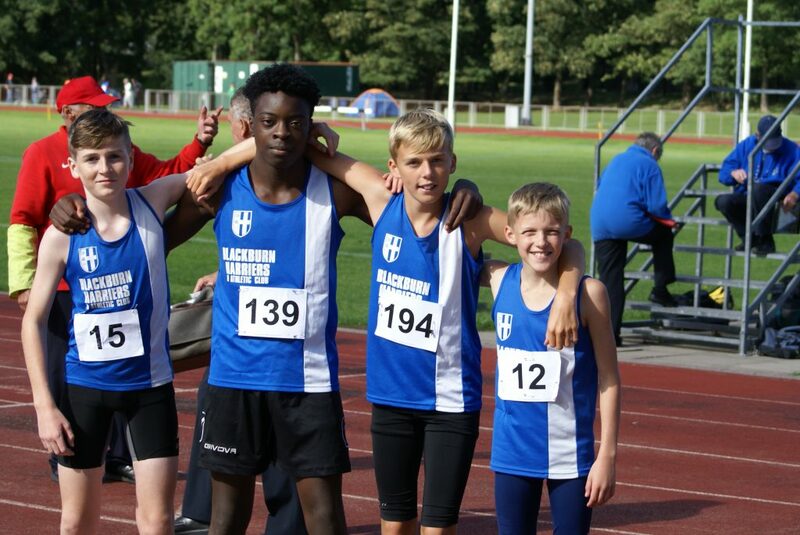 Three endurance runners and a sprinter – Codie Dewhurst – Dexta Thompson – Isaac Butler – Tobi Olidapo – made up the Harriers 4 x 100m Relay Team as they clocked 59.10 in second place to Blackpool. 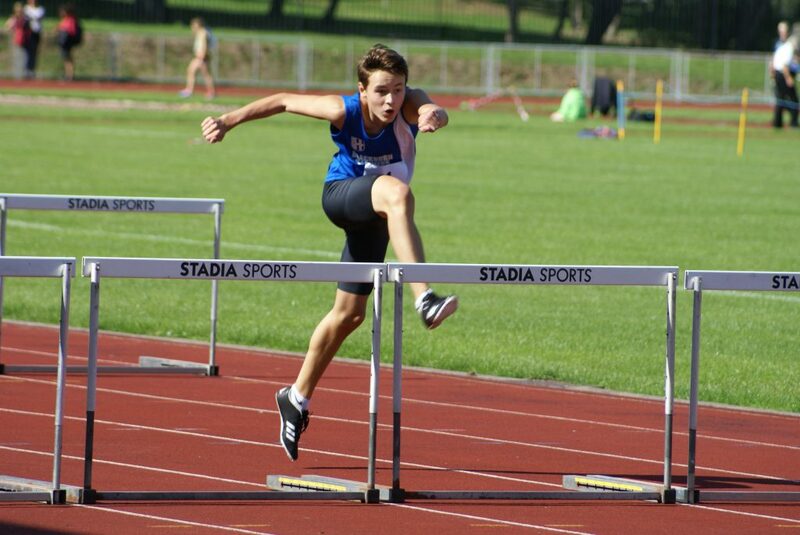 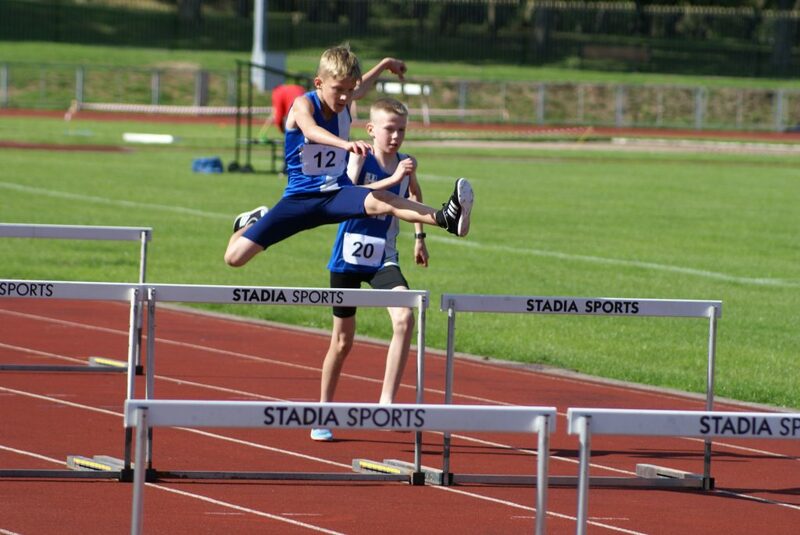 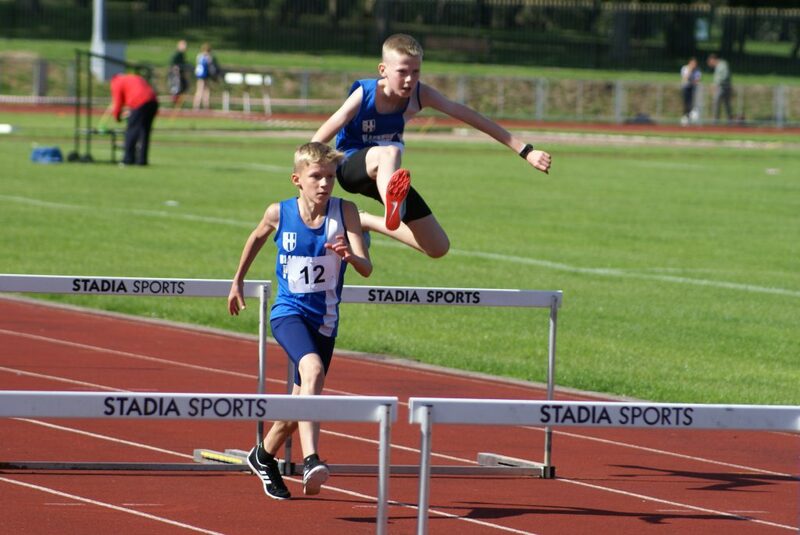 Before the Relays Codie Dewhurst and Daniel Smith ran the U13 Boys 75m Hurdles placing 2nd (16.70) and 3rd (17.20) respectively and Ben Boocock ran 13.00 in the U15 Boys 80m Hurdles. 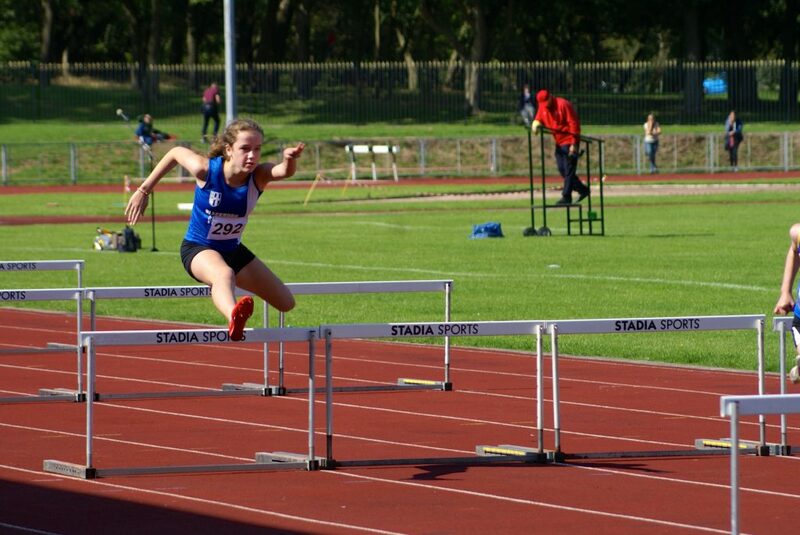 Lucy Ramsden ran 12.80 for 3rd position in the U13 Girls 70m Hurdles which equaled her personal best run at this years County Championships. 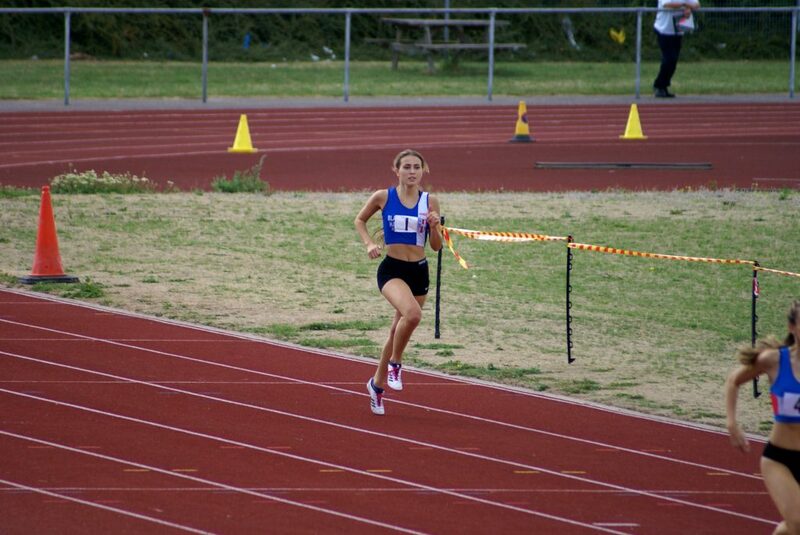 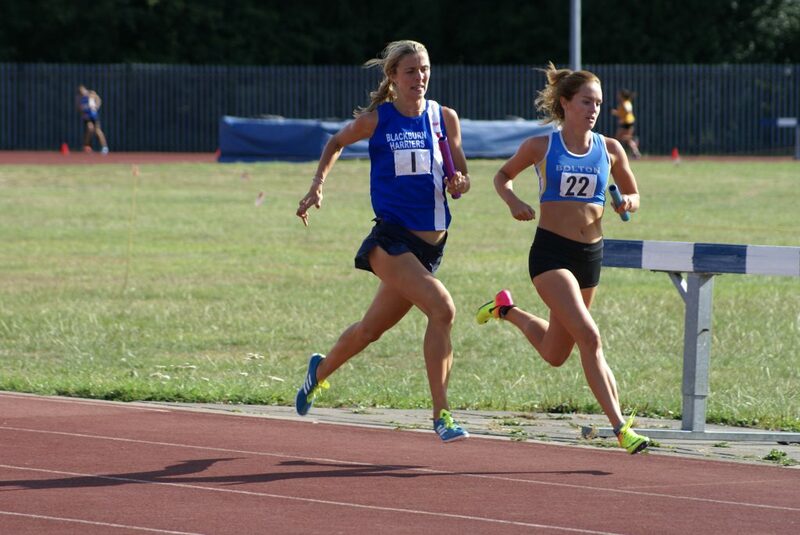 Jes Judd had a tough evening at this meeting taking on the 1500m and 3000m with an hour of each other. 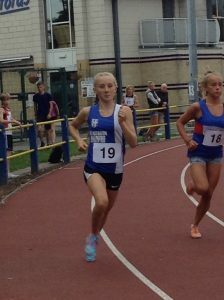 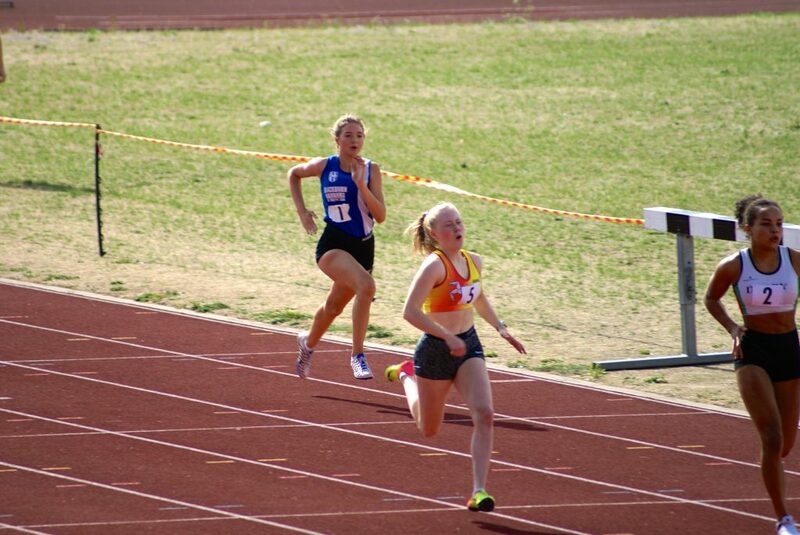 Jess ran both races in an all male field clocking 4.14.04 in the 1500m followed by the 3000m in which she ran a time of 9.09.90. 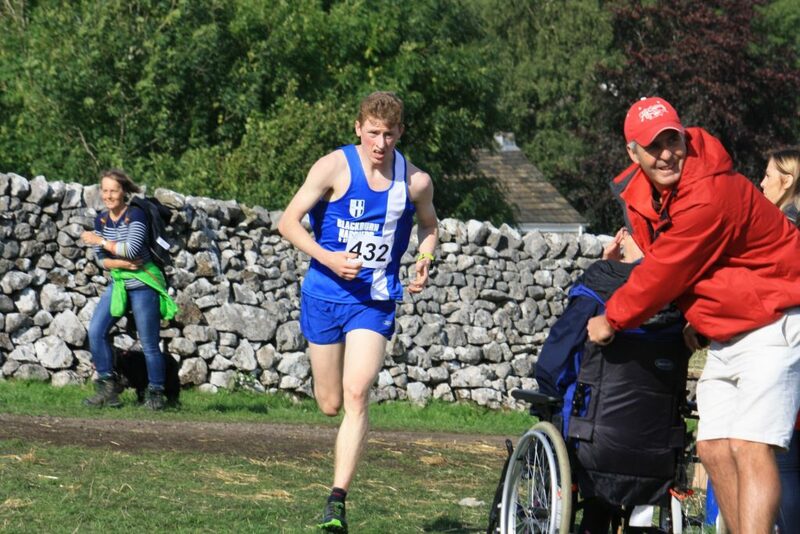 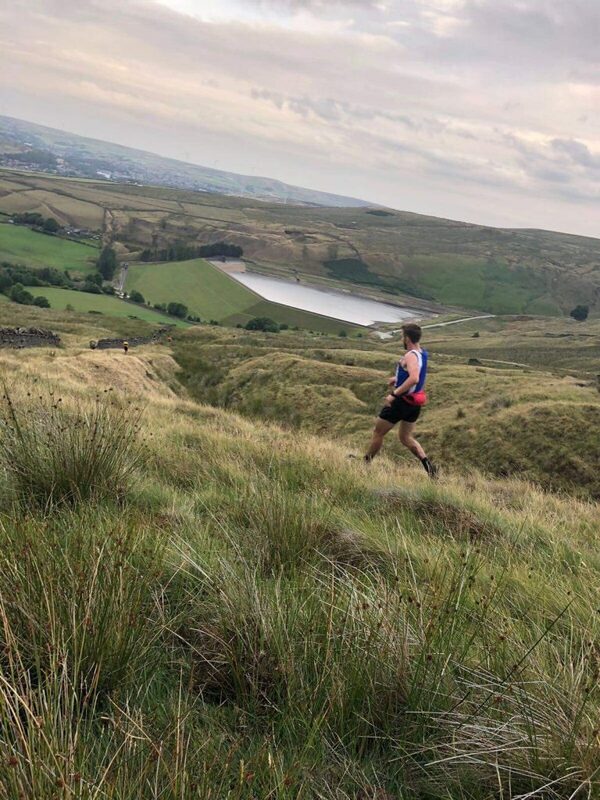 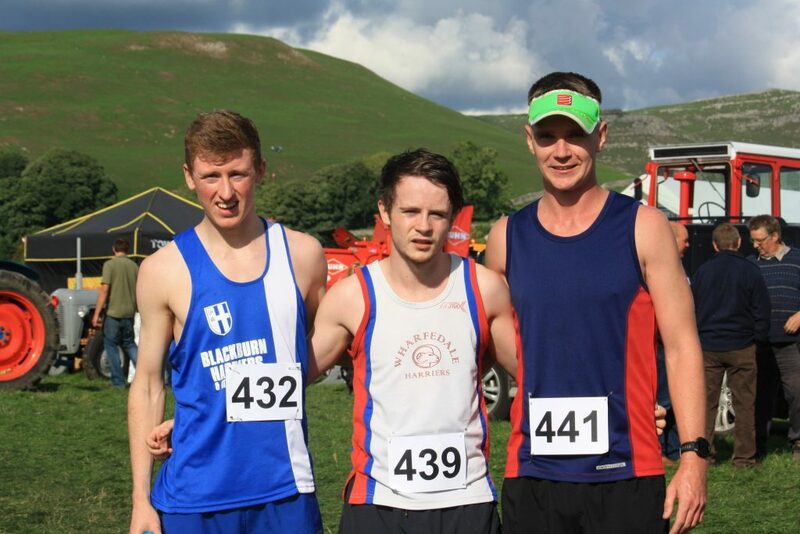 A good run for Tom Marchant at Malham on Saturday which saw him come home in 4th place with a time of 20.26 just one second behind 3rd placed Rob Carr in 20.25. 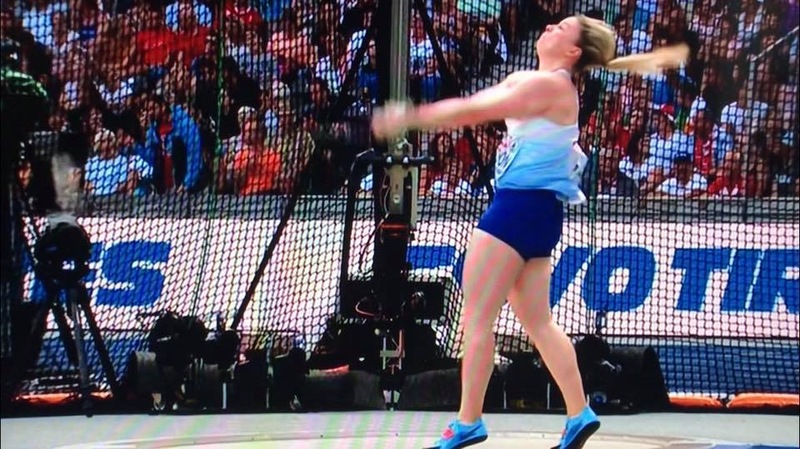 Holly Bradshaw is having a great year. 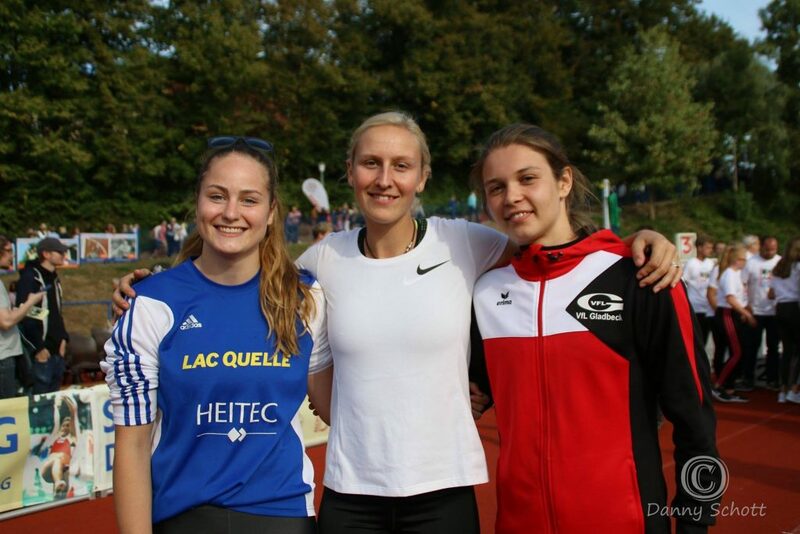 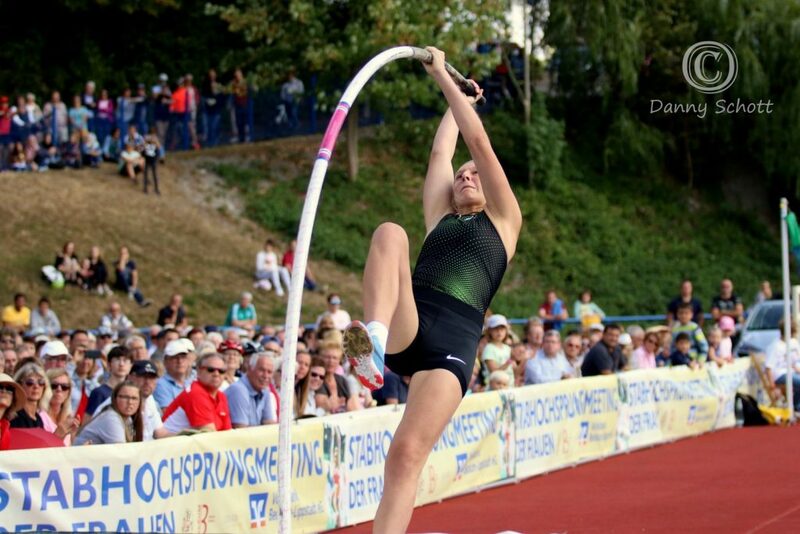 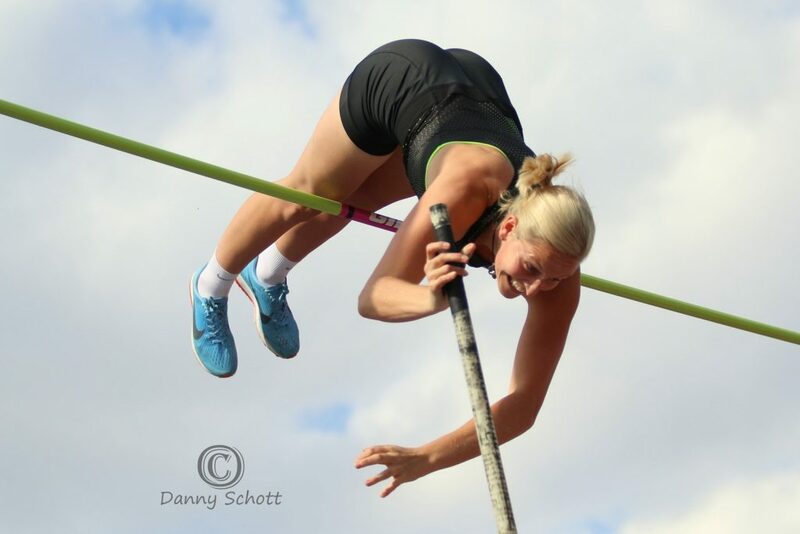 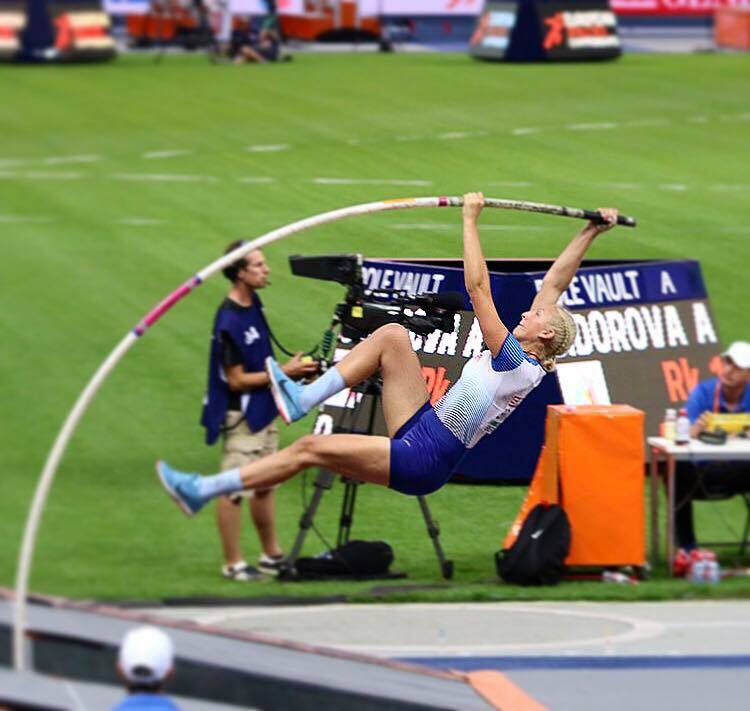 The British No.1 Pole Vaulter has got progressively better throughout the season which saw her clearing 4.80m in Germany in the middle of July. 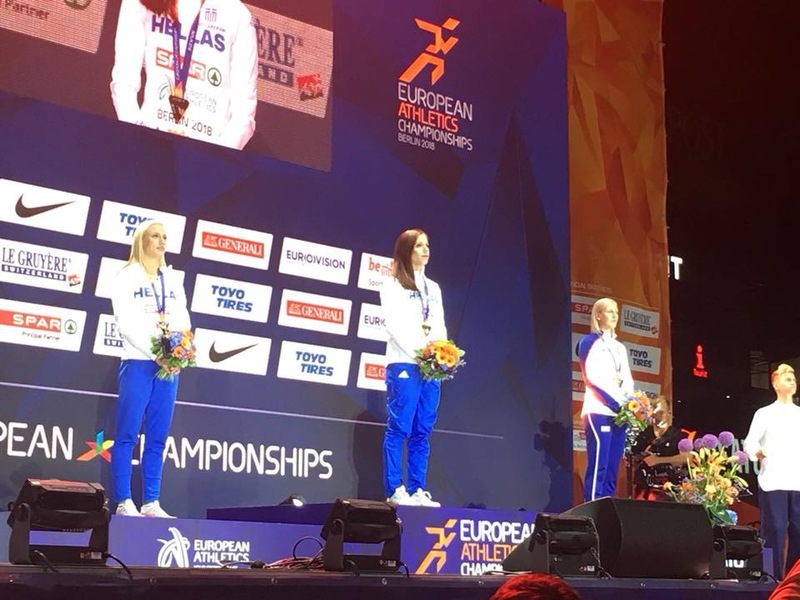 In the European Championships she qualified for the Final with a first time clearance of 4.50m and went on in the Final to clear 4.55m and 4.65m at the first attempt, passed 4.70m and then cleared 4.75m for the second time this year culminating in a very well deserved Bronze Medal. 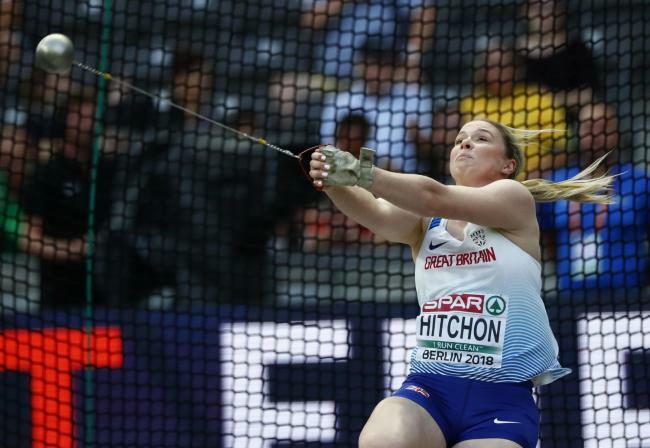 Sophie Hitchon qualified for the Hammer Final on Friday with a distance of 68.74m before finishing 8th in the Final with 70.52m. 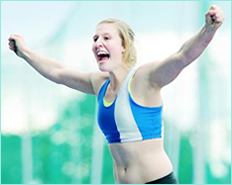 Sophie – British record holder and No. 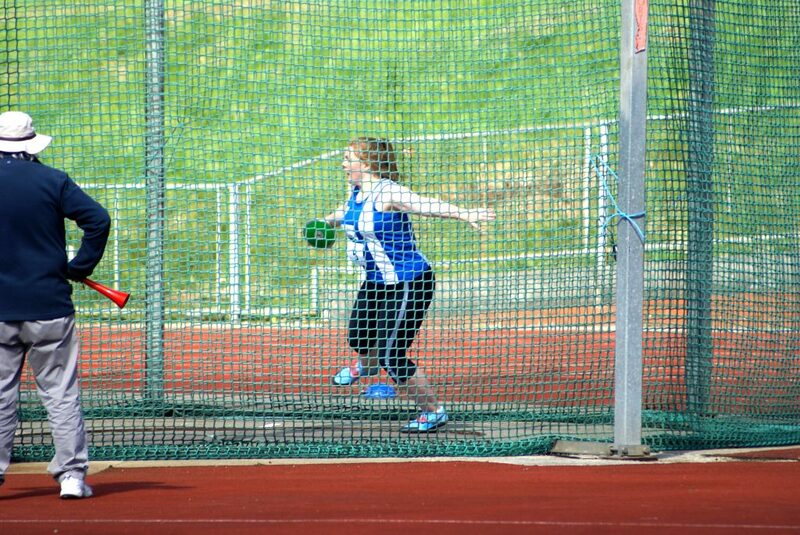 1 – has said that she is working on a change in her technique and is confident that once she has got on top of that she will become more competitive with consistently longer throws. 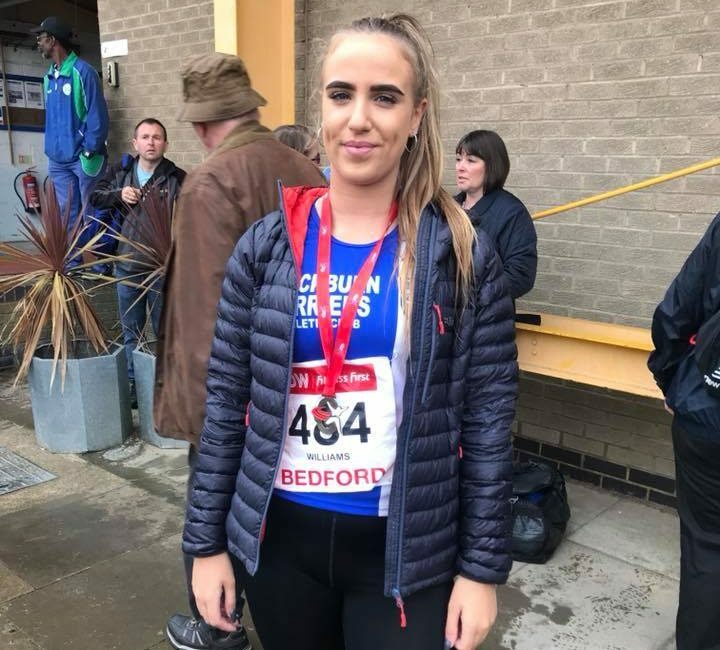 As Sophie’s sister posted on Twitter “The road to success is always under construction’. 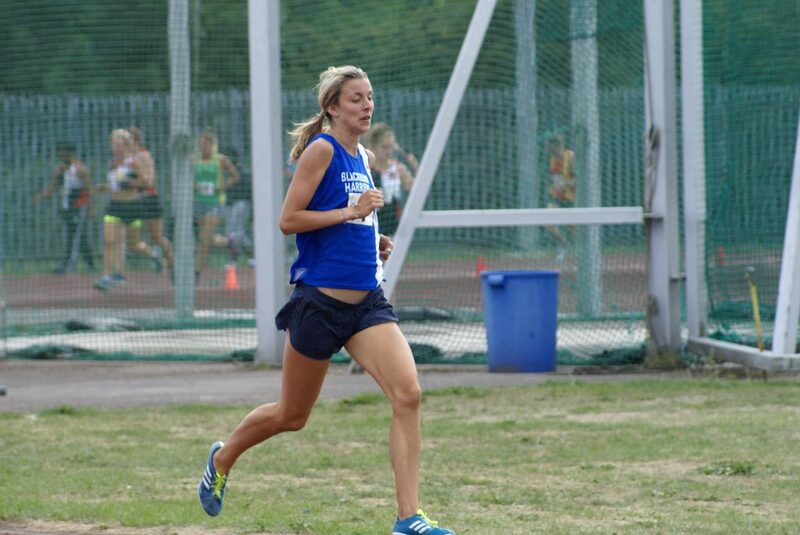 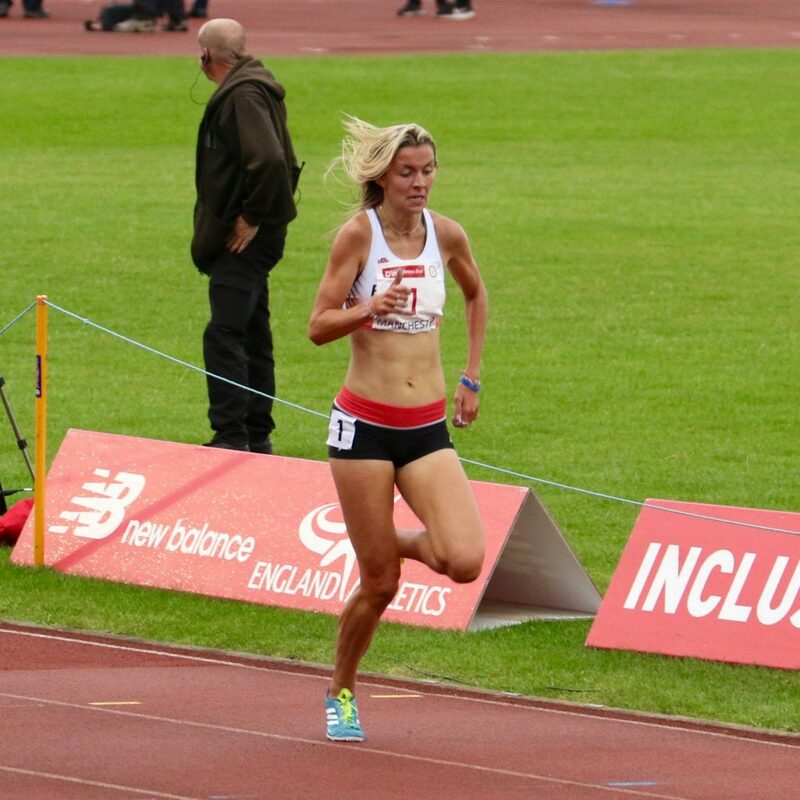 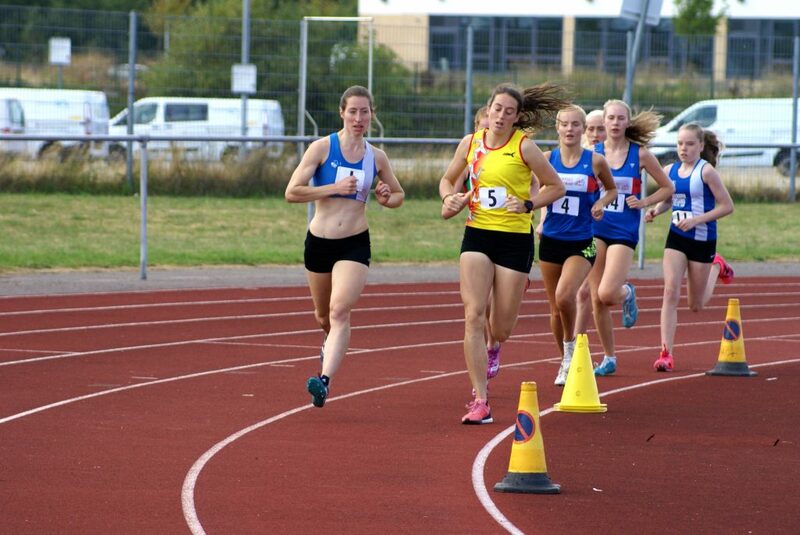 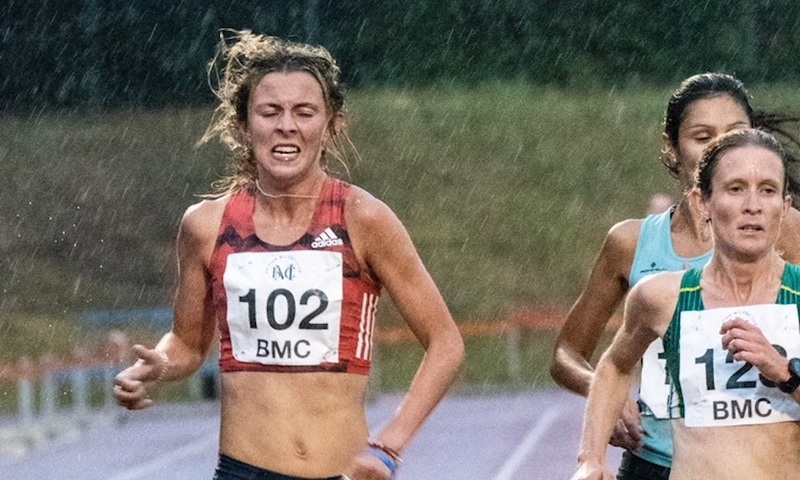 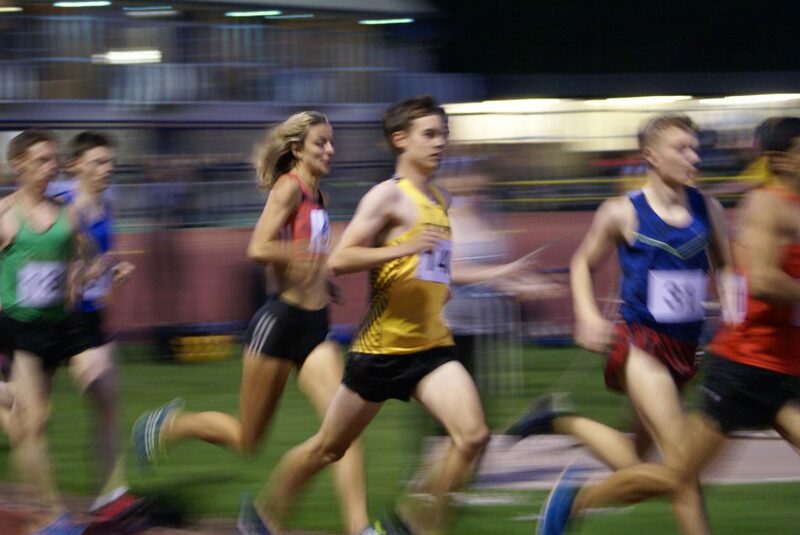 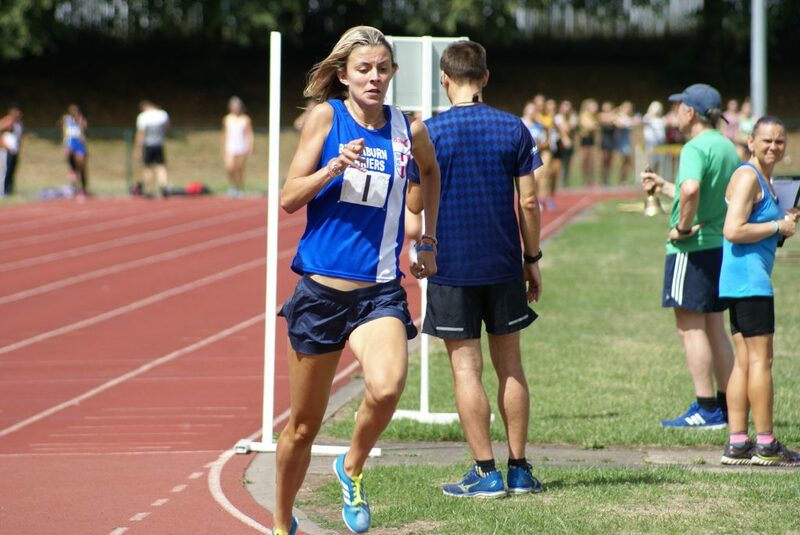 After running a time of 2.04.57 over 800m at Watford during the week Jess Judd ran the BMC 5000m on Saturday evening to head a field of twenty one athletes in a winning time of 15.37.23 with Emily Thornhill in 2nd (15.58.31) and Emelia Gorecka in 3rd (16.06.30). 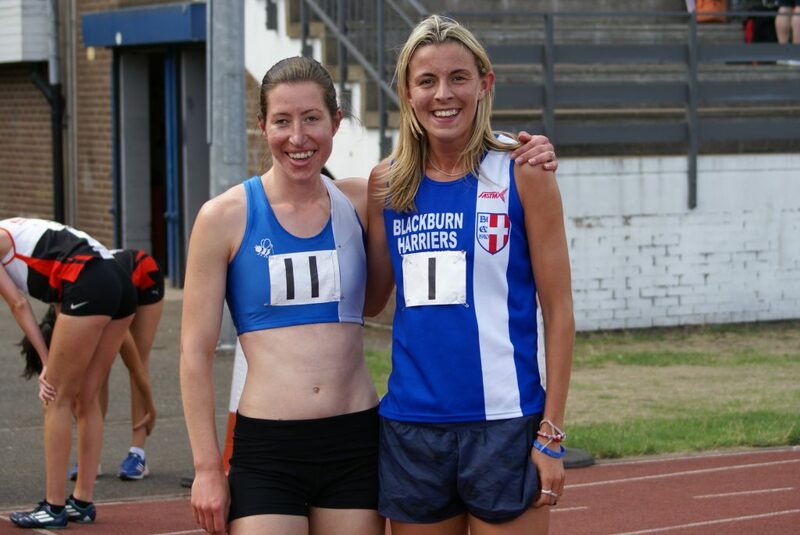 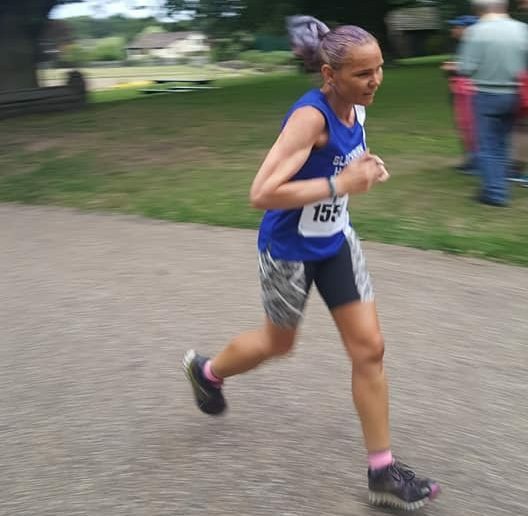 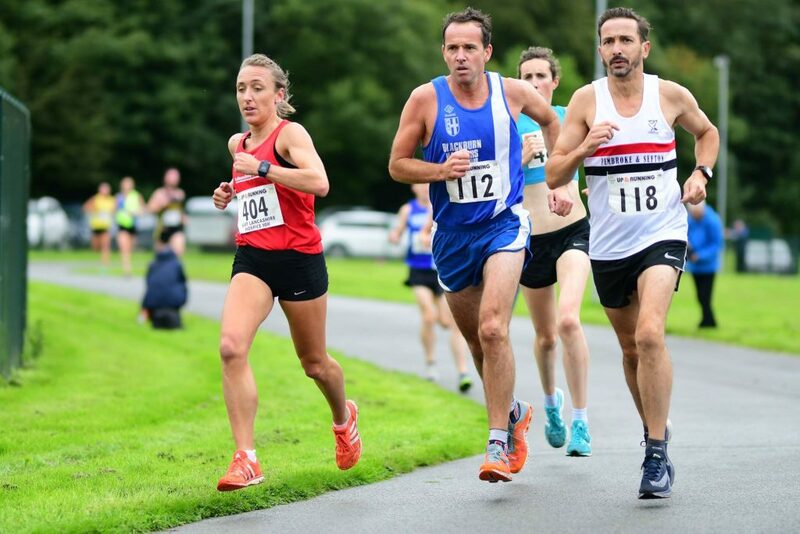 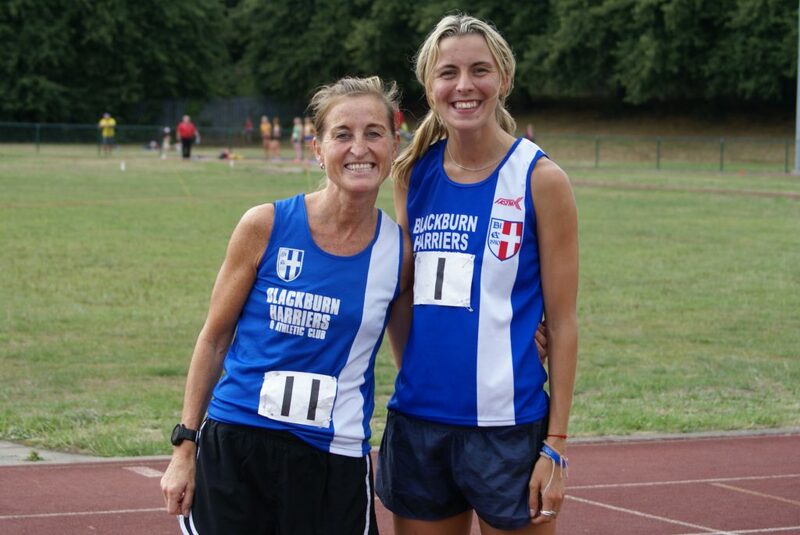 In doing so, Jess broke Blackburn Harriers Club Record which was set by Pauline Powell in 2001 and was just three seconds outside her own personal best. 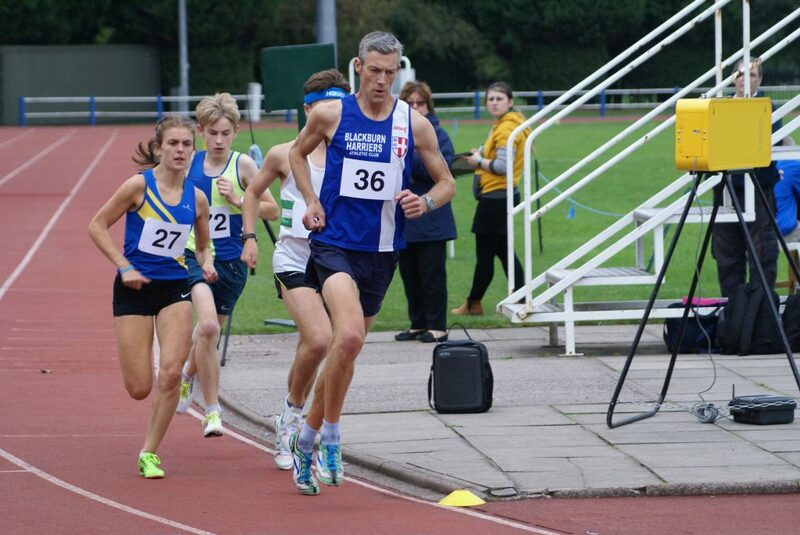 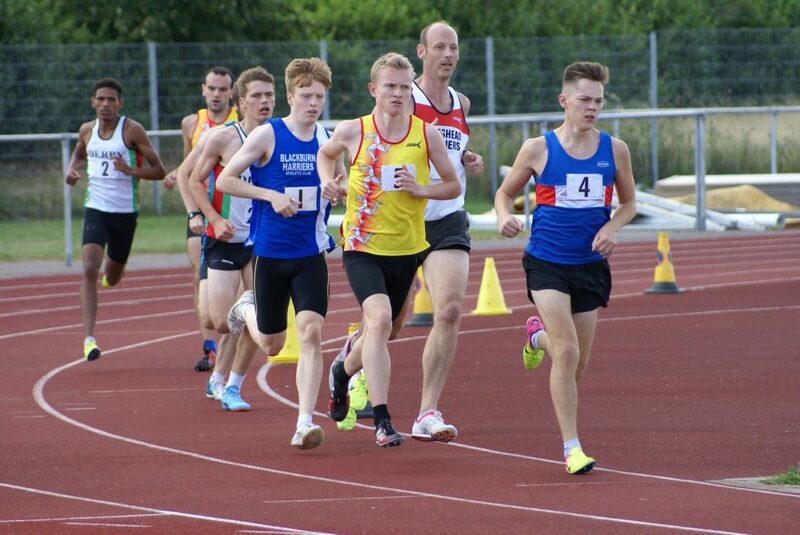 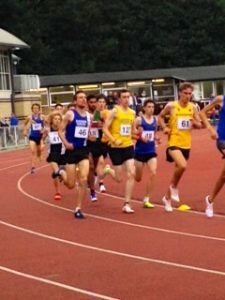 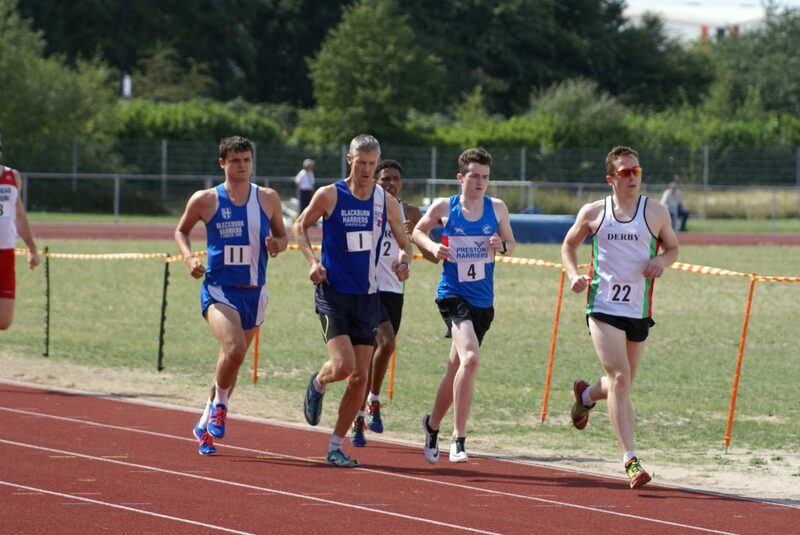 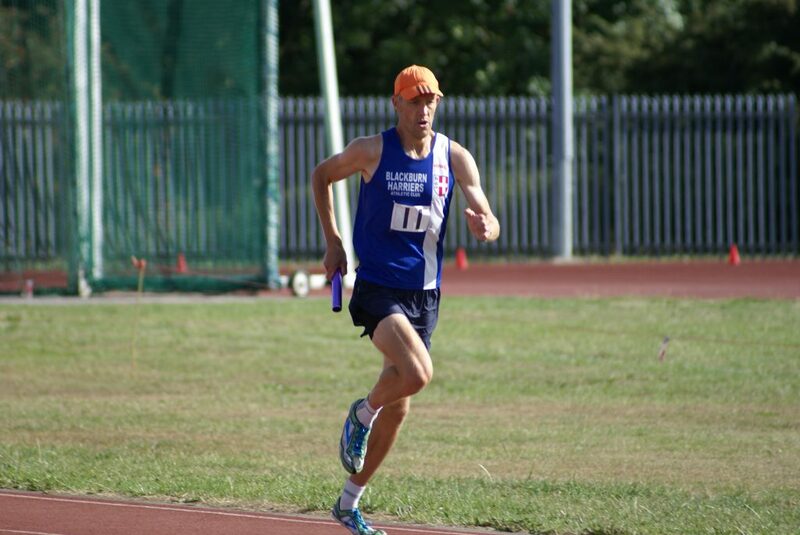 In the week leading up to Milton Keynes BMC Rob Warner ran the 1500m at the Watford BMC on August 8th to clock a time of 3.52.10 in 11th place. 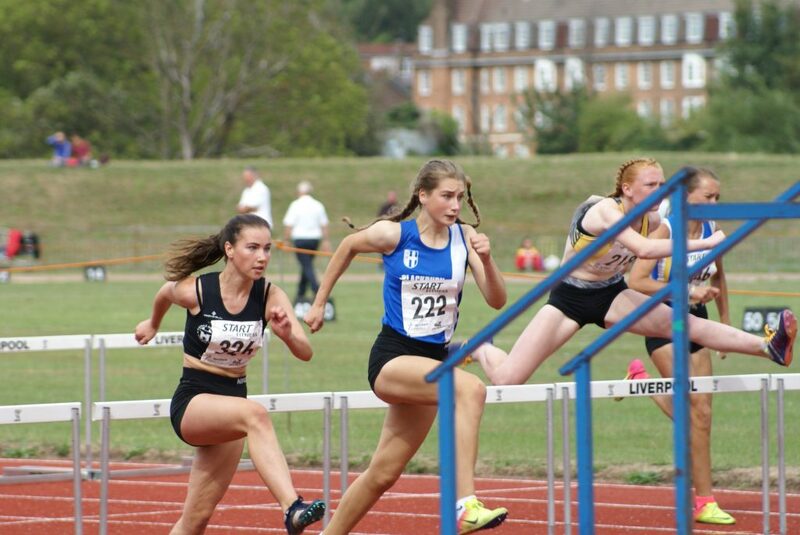 U17 Abigail Brown went into the Championships with a shoulder injury which hampered her performance. 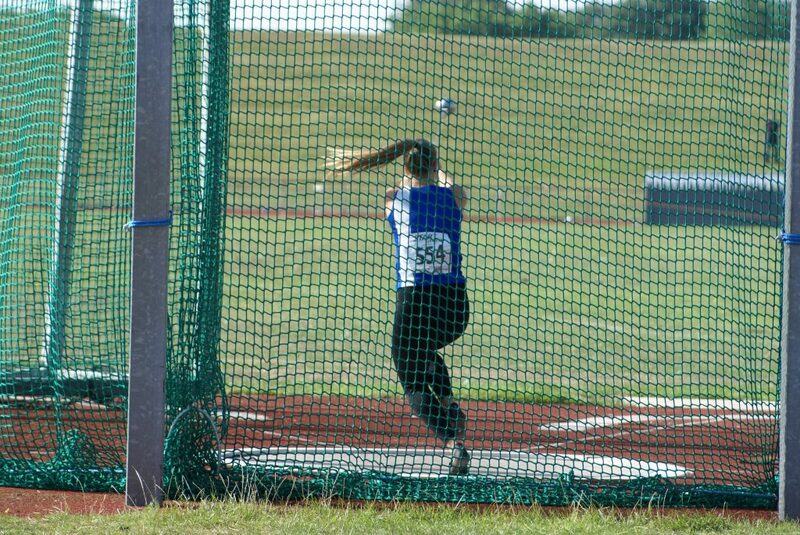 In the Hammer she placed 11th in the thirteen strong field with 32.72m and due to the injury wasn’t able to compete in the Discus and Shot. 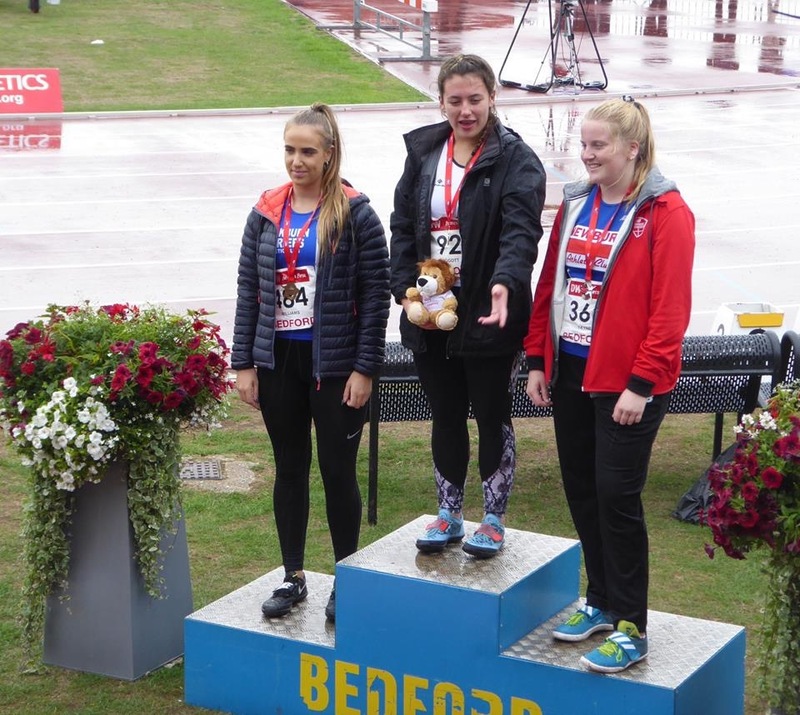 Nicky Saunders won a Bronze Medal in the U15 Girls Discus with a new PB throw of 28.86m placing third out of a field of fifteen competitors and this was after she threw another new PB in the U15 Girls Hammer placing 5th with 31.16m. 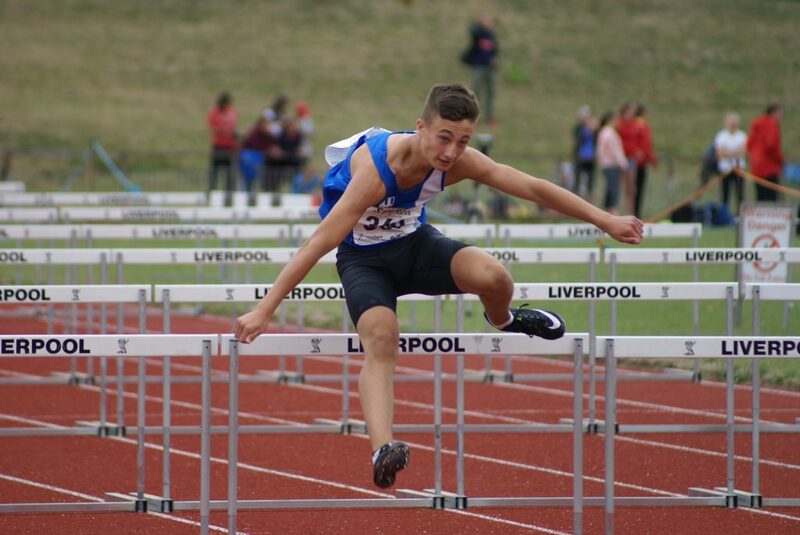 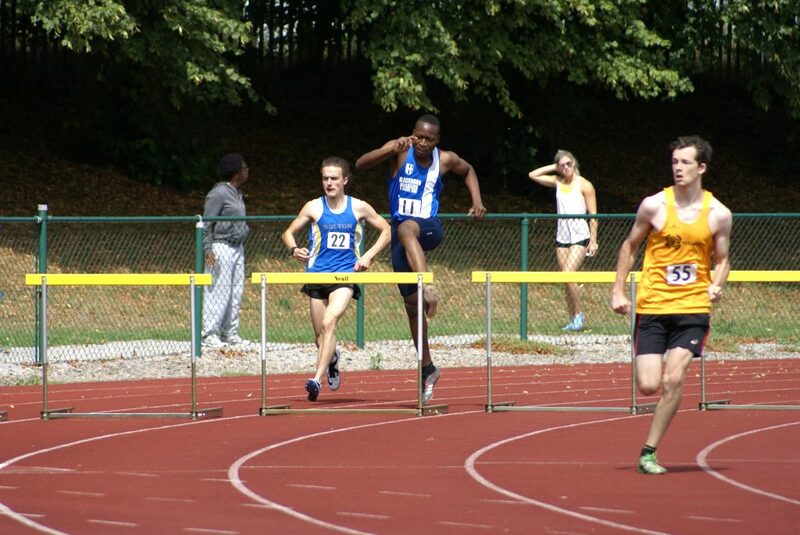 U17 Solomon Brown came straight from the airport having flown back from holiday in Bulgaria to win the 400m Hurdles and become Northern Champion in a time of 60.04. 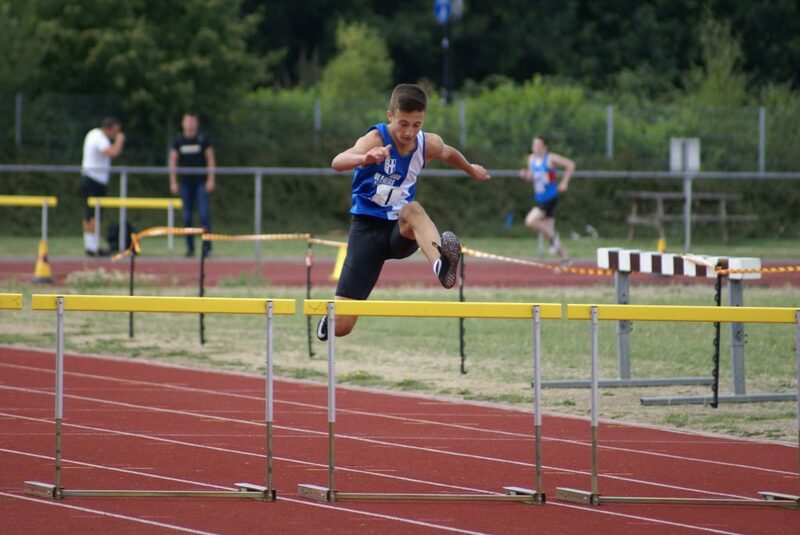 After a nights sleep he was back the following day to take Bronze in the 100m Hurdles with a time of 15.51 and that into a headwind of -2.9. 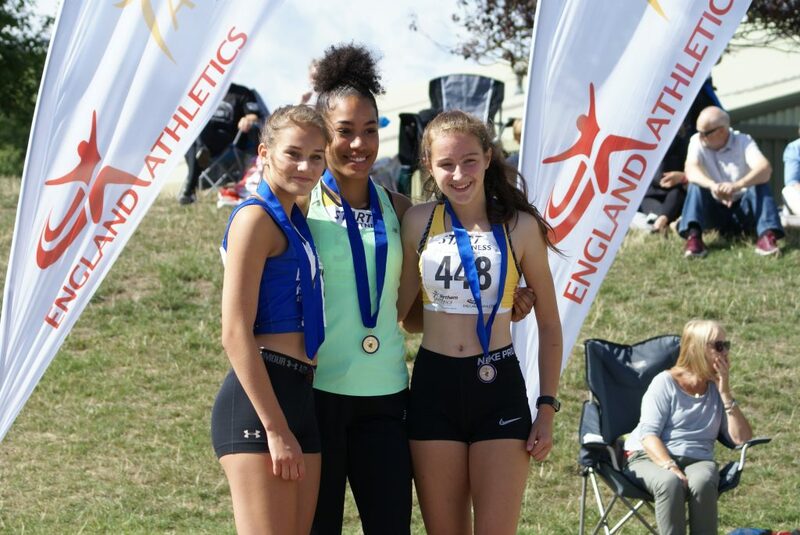 There was another Bronze Medal in the Hurdles for the Harriers, this time won by U17 Millie Coy in a battling 300m Hurdles Race with a new PB of 47.43. 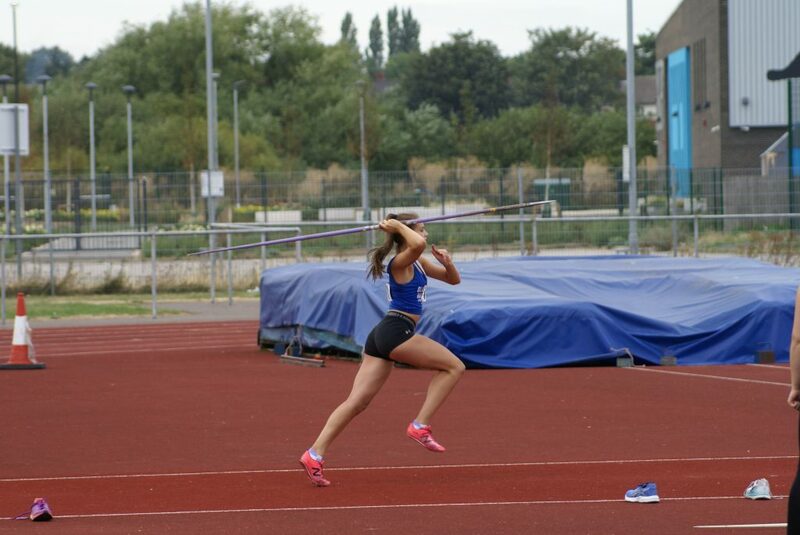 Millie was also back on the Sunday and this time in the Javelin in a competition featuring thirteen athletes where she finished in 8th position (33.06m) some four metres outsider her best. 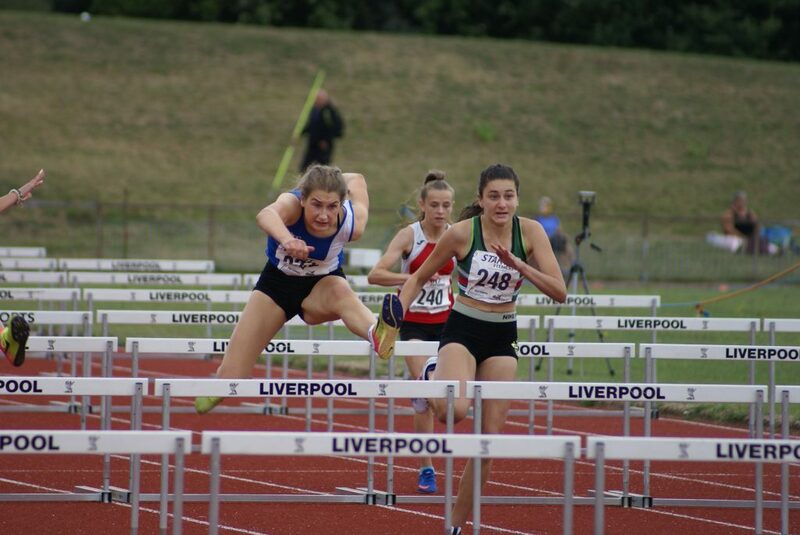 English Schools Hurdler Myah Booth had a very good Championships as she won her Heat of the 75m Hurdles in a time of 12.04 and again into a headwind of -4.9 going onto claim the Silver Medal in the Final clocking 11.60 – the headwind dropping to -1.7. 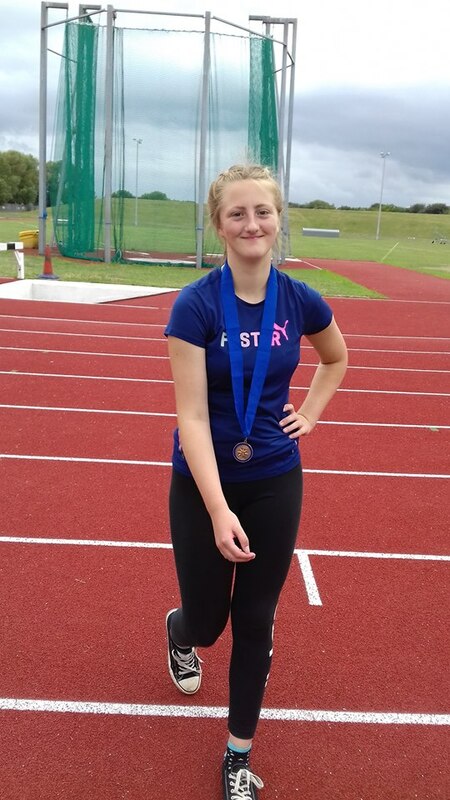 Then onto the Shot Putt in which Myah threw 10.84m, just 15cms outside rhest best to win her second Medal of the Championships with a Bronze in 3rd place. 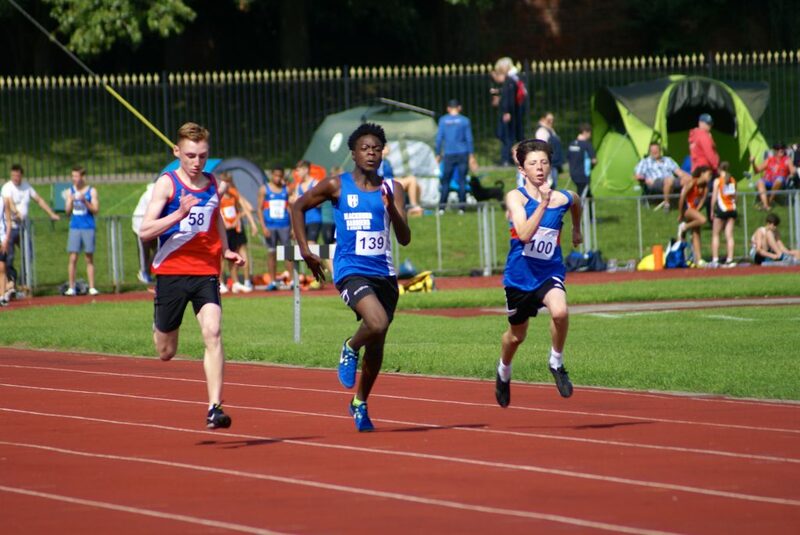 Tobi Olidapo had a great first ever appearance in a Championships entering the U13 Boys 100m and Long Jump. 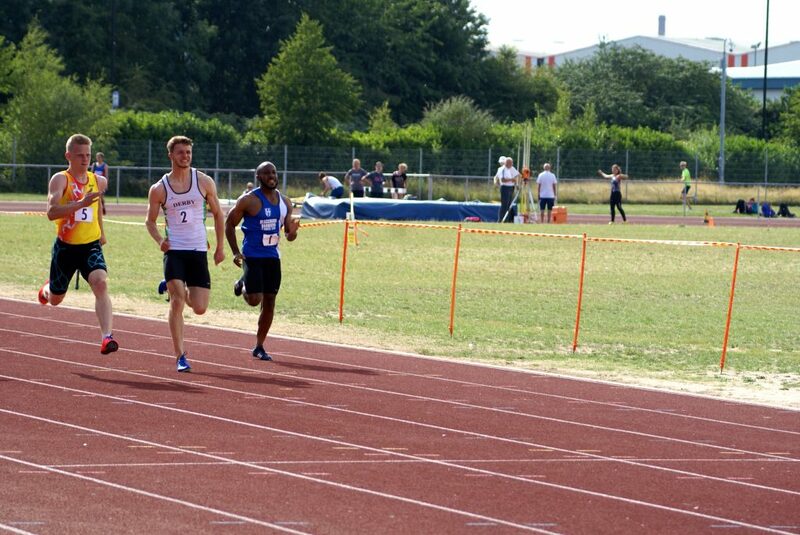 Running into a big headwind of -2.6 he won his Heat to qaulify for the Final in a time of 13.62 and then went onto win Bronze in the Final, clocking 13.78 and this time into a wind measuring -3.0. 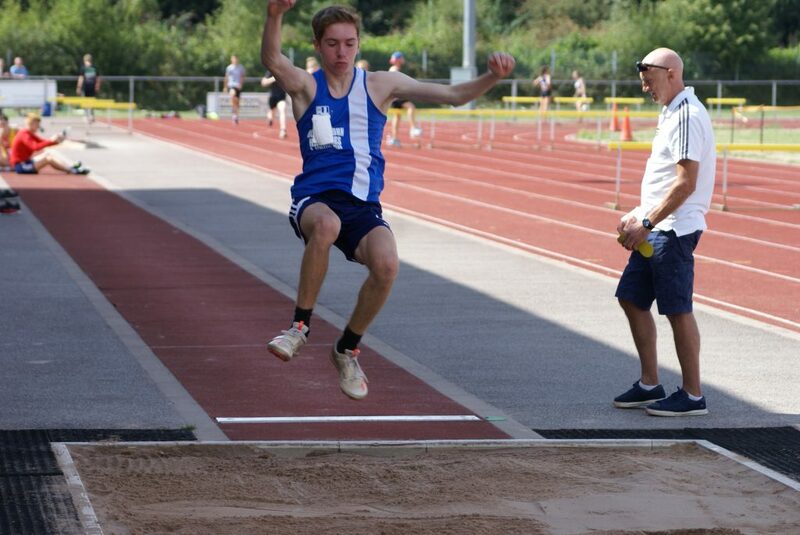 In the Long Jump he wasn’t far away either jumping a new PB distance of 4.52m in 7th place and just 14cms outside the Medals. 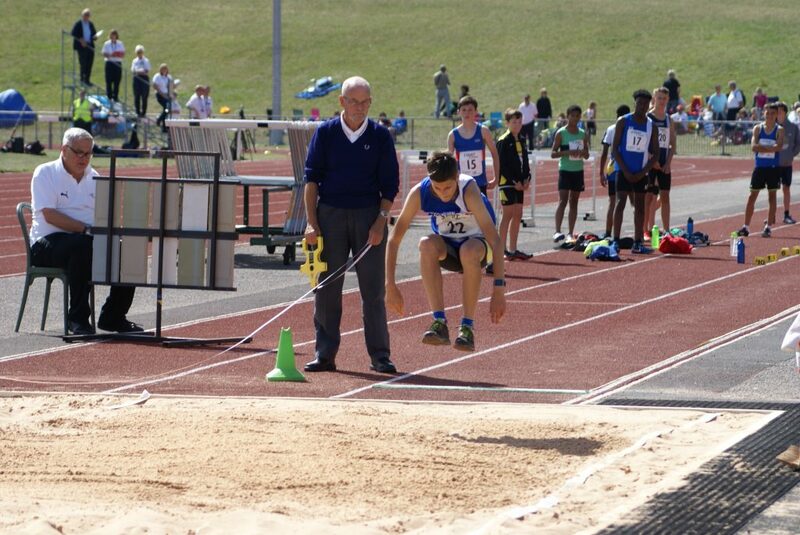 Also in the Long Jump was Saul Sharp who also had a good day posting a new PB of 3.69m – going on to run a time of 2.44.59 in the U13 Boys 800m. 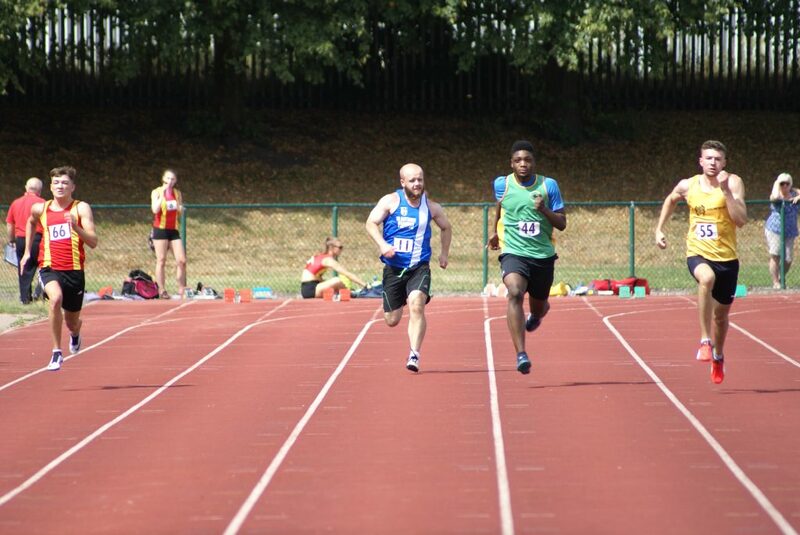 Tobi’s older brother Tope Olidapo (U17) entered the 100m and 200m – having pulled up with a cramp in the 200m he was back for the 100m on Sunday clcoking 12.98 in Heat (1). 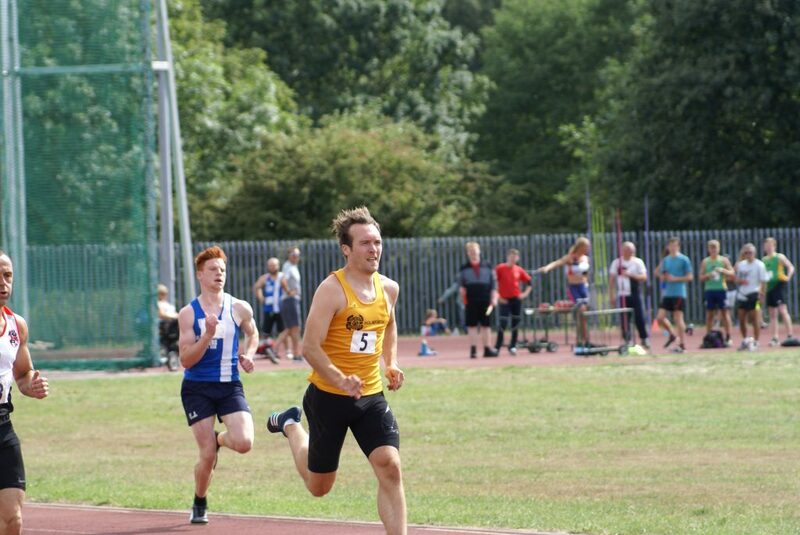 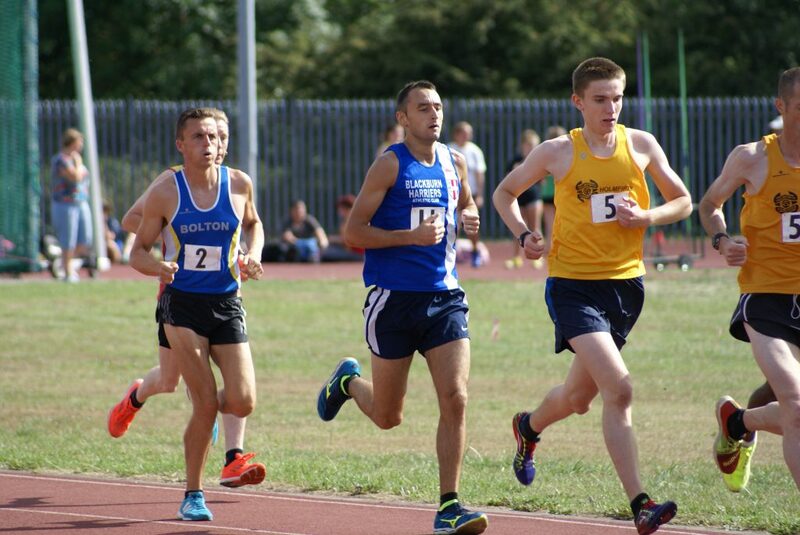 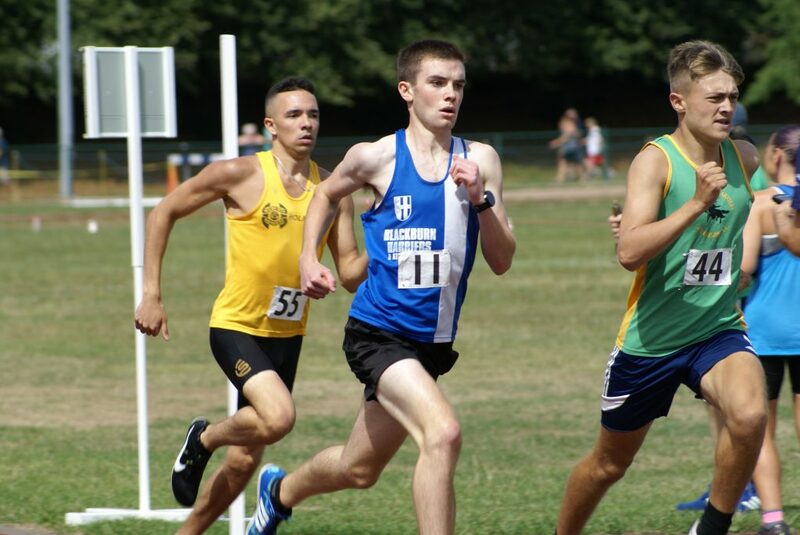 Ethan Downes who has had an excellent season this year in the UKYDL, was like all the sprinters running into substantial headwinds and in Ethan’s Heat it measured -3.4 as he ran a time of 12.62 in 3rd place which didn’t get him a place in the Final. 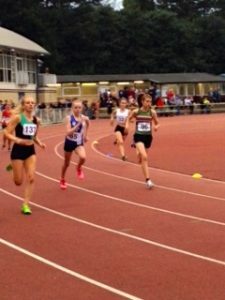 U17 Amy Davies clocked a time of 5.03.97 in the 1500m coming home 6th in the Final whilst Harry Wilkin ran 5.05.46 in the U17 Men’s 1500m. 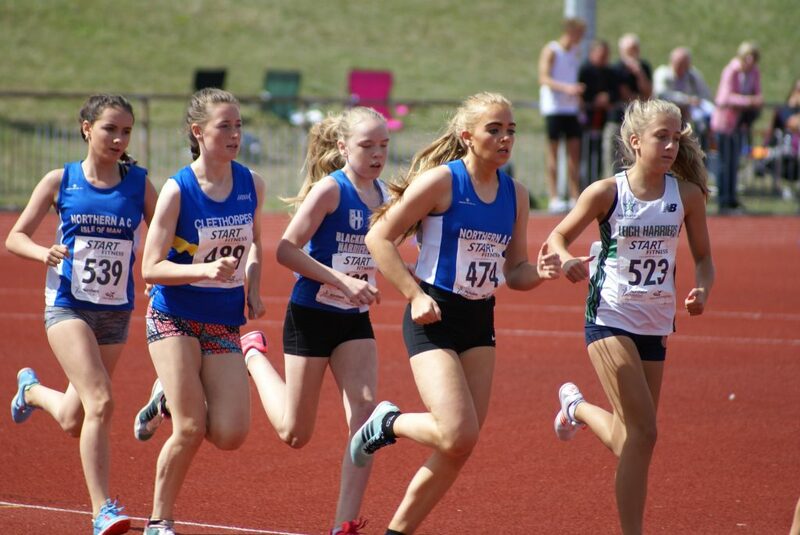 In the U15 Girls 800m – Eleesha Charnley placed 4th in Heat (2) ot three Heats with a time of 2.25.56 which meant she missed qualification for the Final. 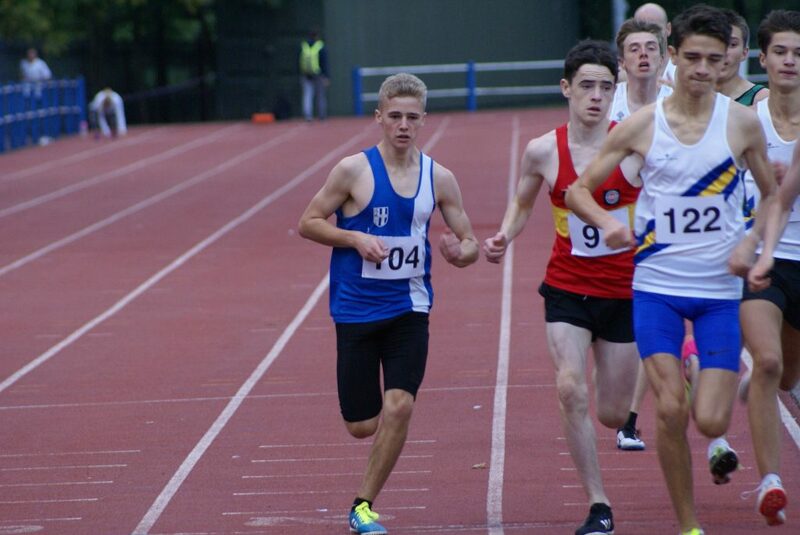 Hayden Mercer ran the U15 Boys 800m qualifying for the Final as a fastest loser in 2.19.26. 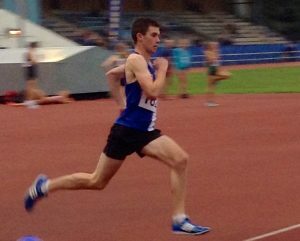 A much better performance in the Final saw him run very close to his personal best as he clocked 2.13.82. 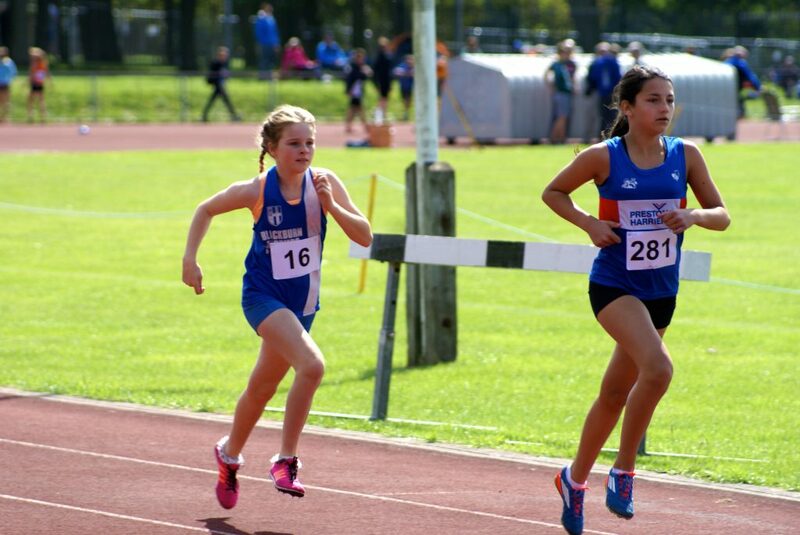 The U13 Girls 800m was run as three Time Trials with the winner of each Race taking the three places on the Podium. 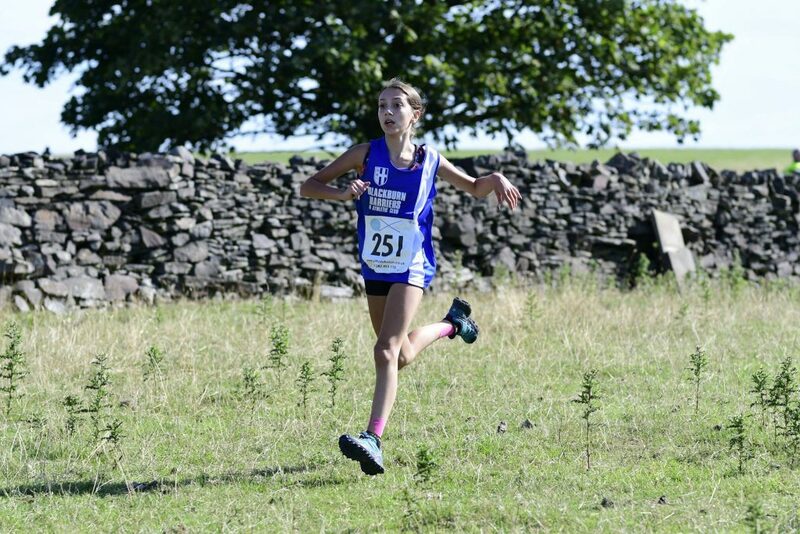 Keira Haxton ran a really gutsy and competitive race as she fought to finish in 2nd place in her Race with a time of 2.41.89. 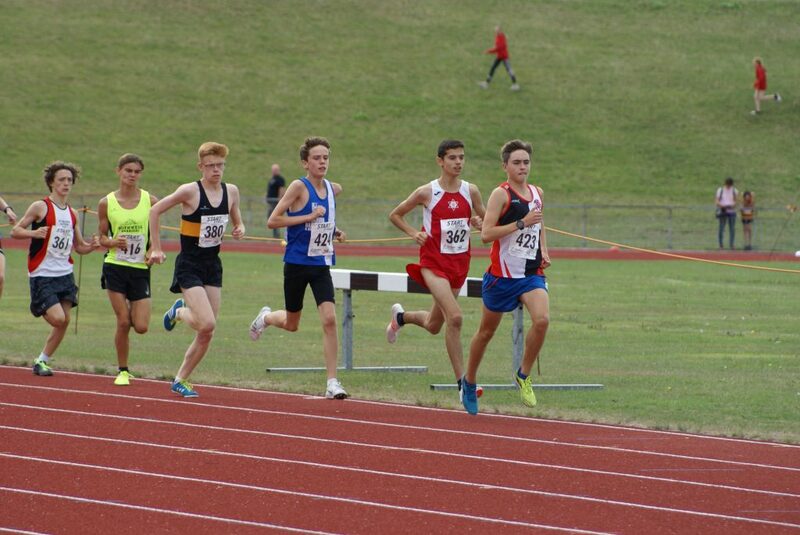 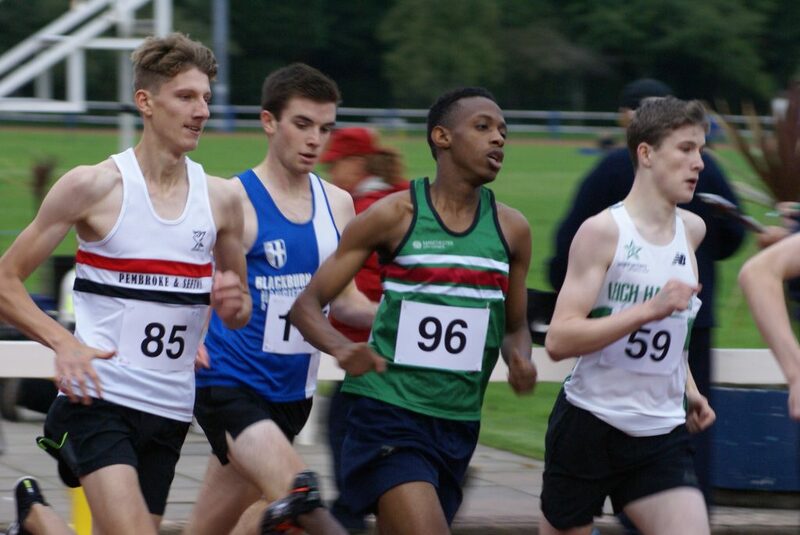 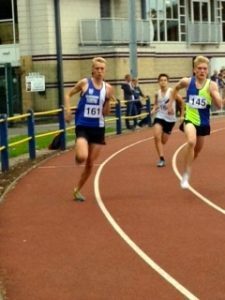 In the 3000m Nick Smith was invited to run in the U17 men’s Race as there had been only the one entry in the U20 Men’s 3000m. 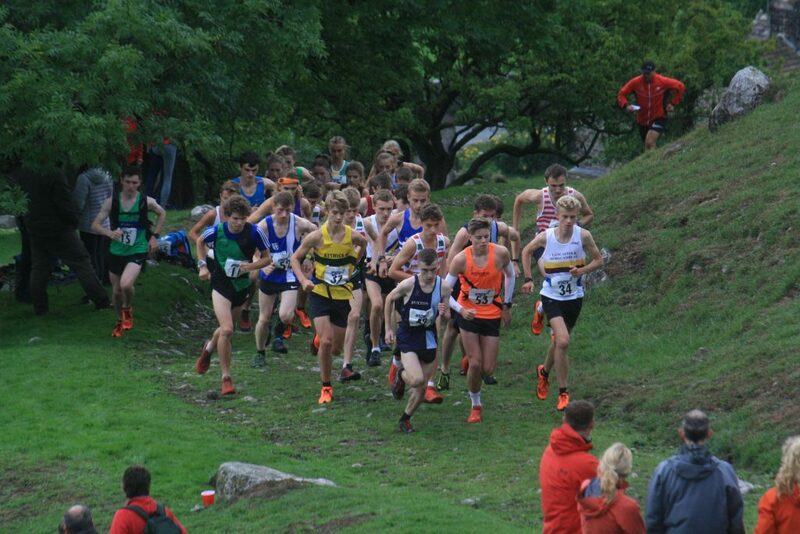 Matt Ramsden was hopeful of a Medal in the U17 Race which featured a number of good athletes in the Entry List. 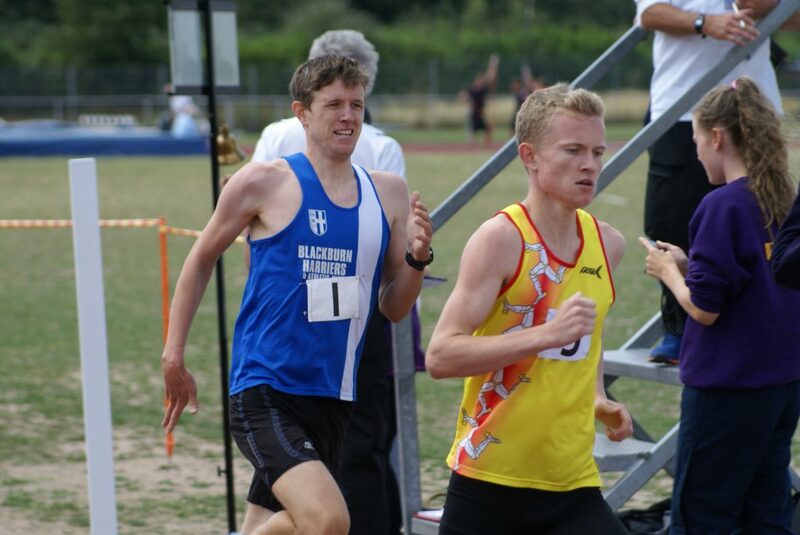 On the day two of the athletes who lined up were sub 9 minute athletes – Joseph Buckley and Matt Ramsden and that is how the Race finished with Buckley winning in a time of 9.12.07 and Matt in 2nd place closing the winner down all the time in the home straight as he clocked 9.14.52 to win Silver. 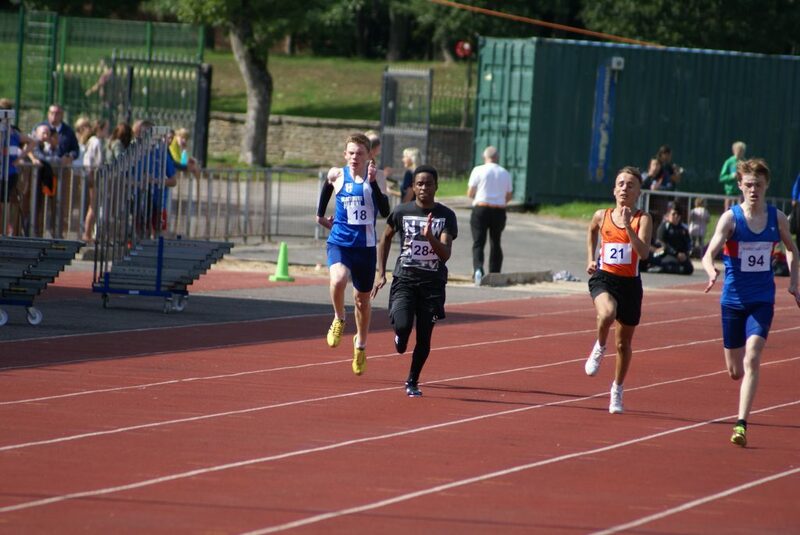 Nick Smith ran a time of 10.10 and was presneted with the Gold Medal. 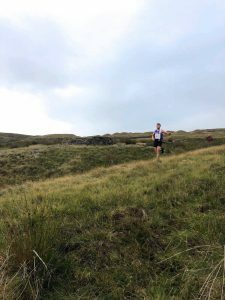 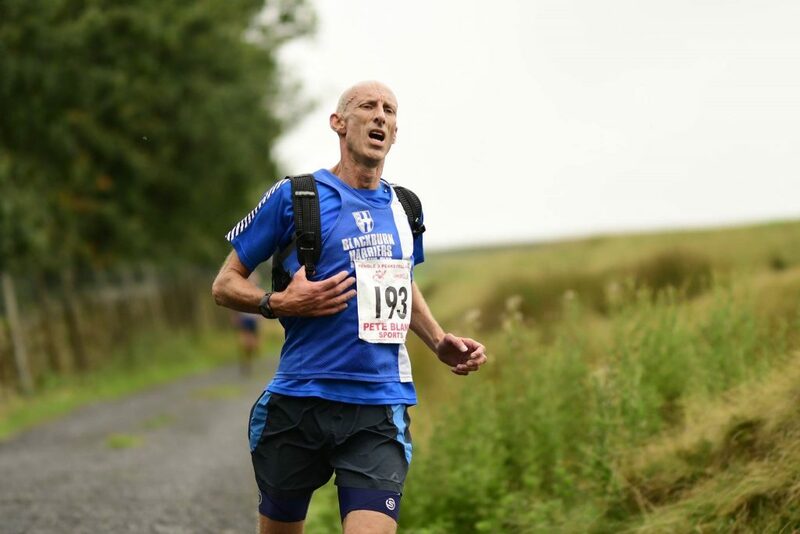 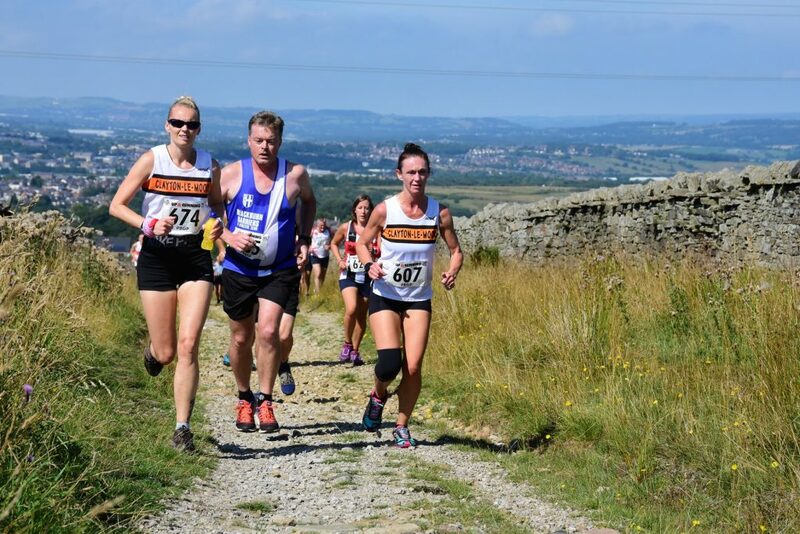 John Horrocks has continued his fine form on the Fells in his latest Race – Pilgrims Cross – which is part of the Rossendale Series. 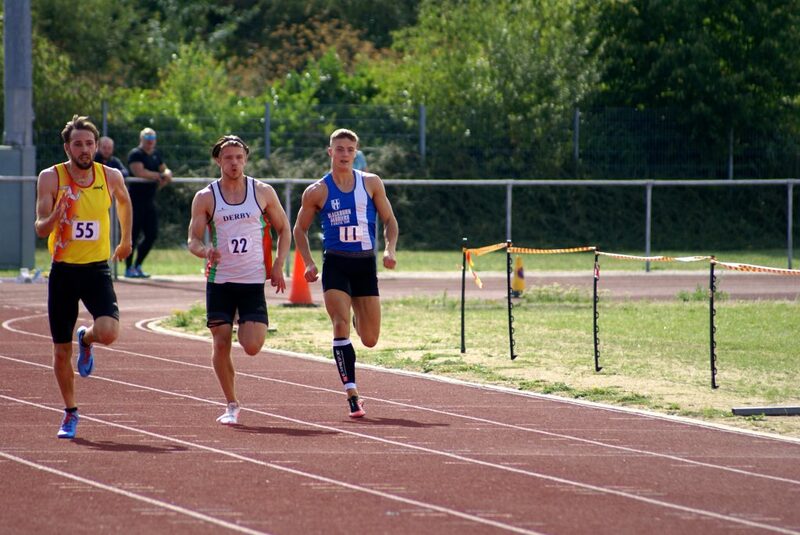 This latest outing saw John take 3rd place in a time of 40.54 with Luke Turnmer taking the win (40.05) and Andy Buttery in 2nd (40.13). 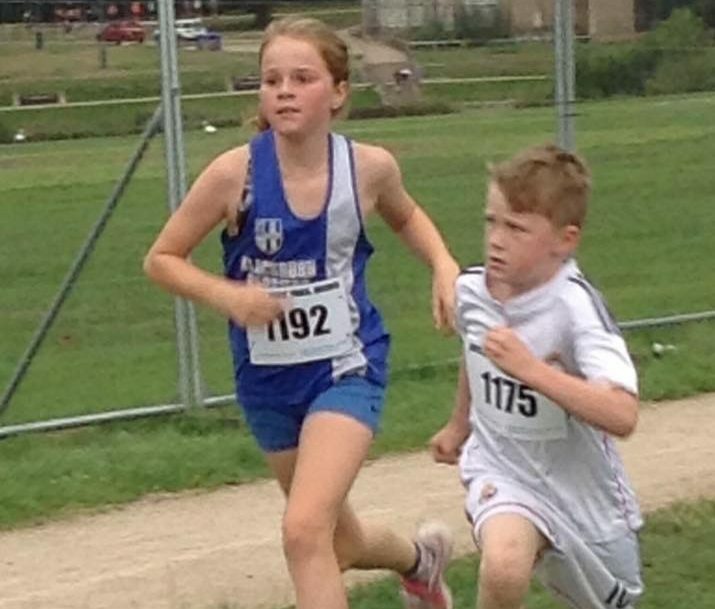 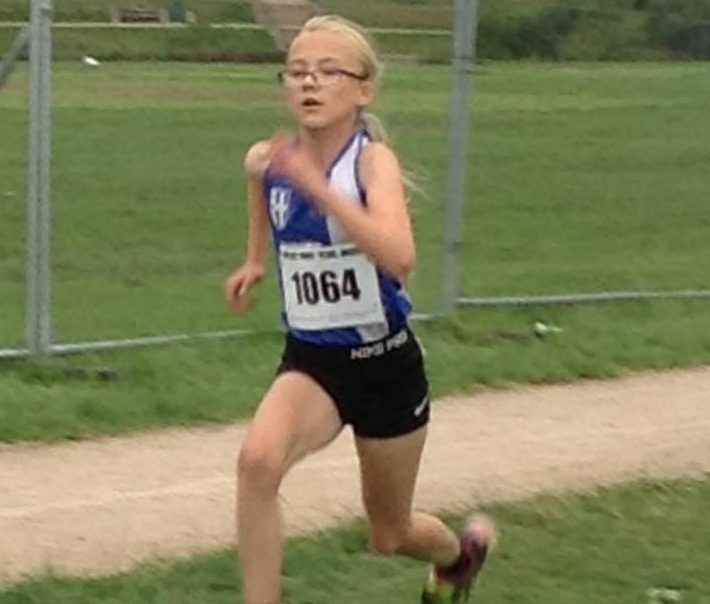 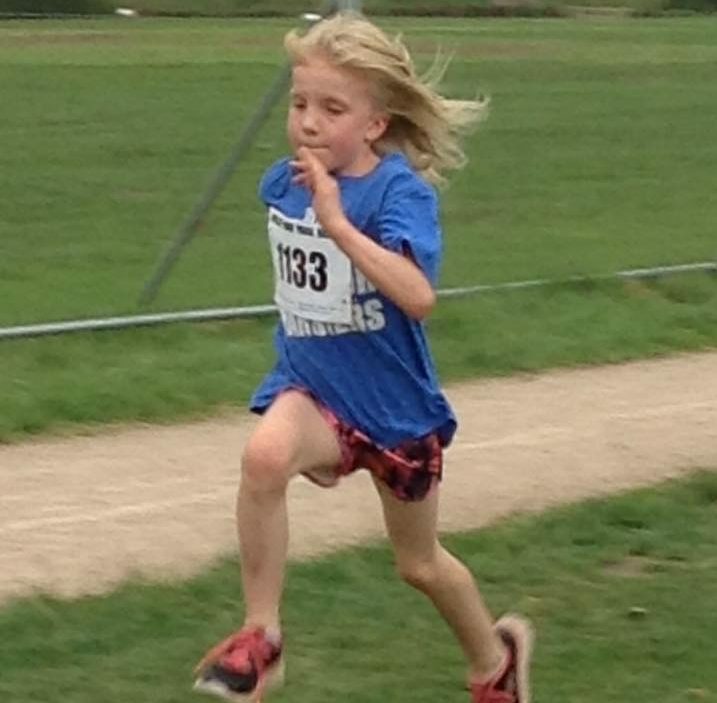 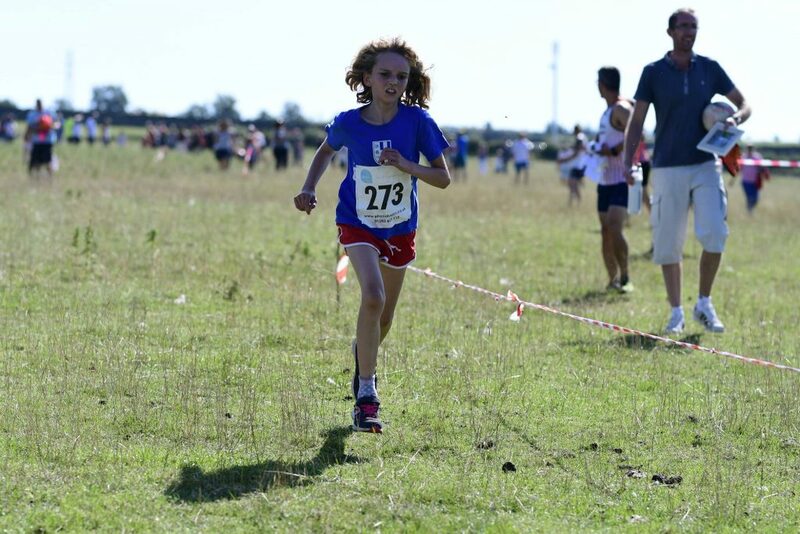 Charlotte Smith maintained her run in the Series on Sunday coming home in 4th place (4.17) in the U9 Girls Race. 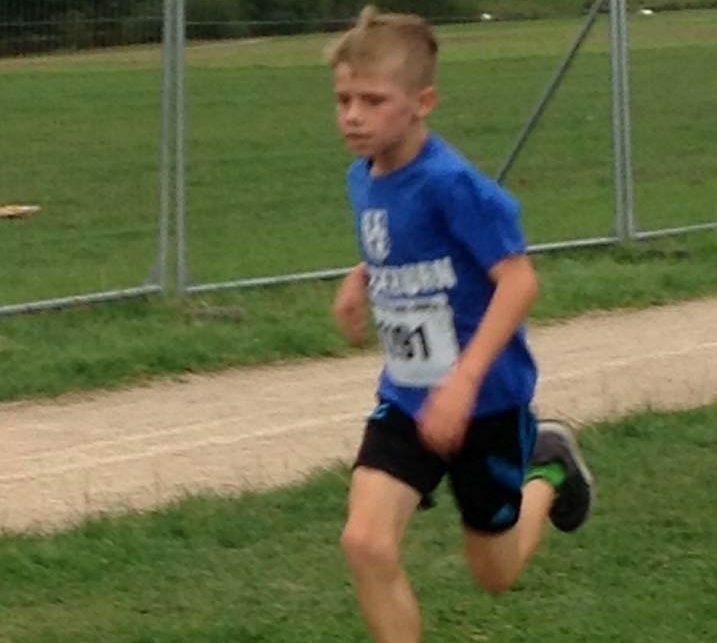 Matthew Smith has had a great Series and won the U11 Boys race again in a time of 6.59 with Theo Robinson in 7th place in a time of 7.56. 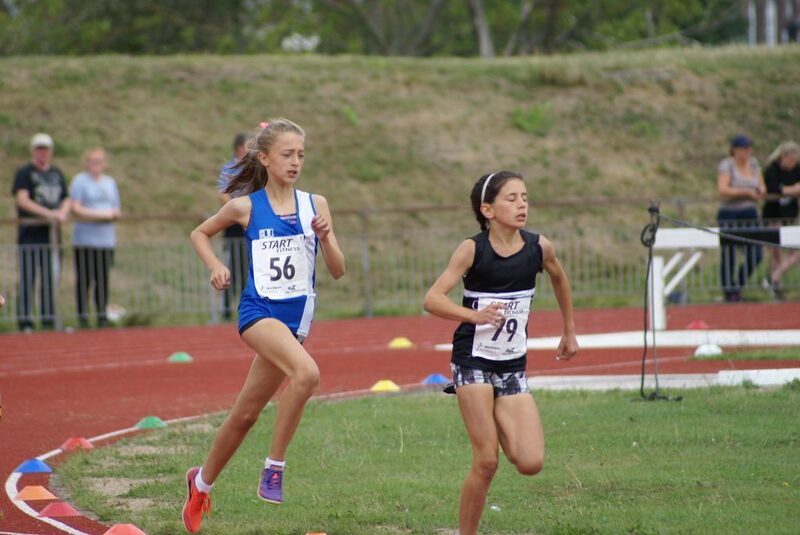 Imogen Robinson maintained her good fun with 4th position in the U11 Girls Race clocking 8.16 and followed in by Tippi Francis in 8th place (8.46). 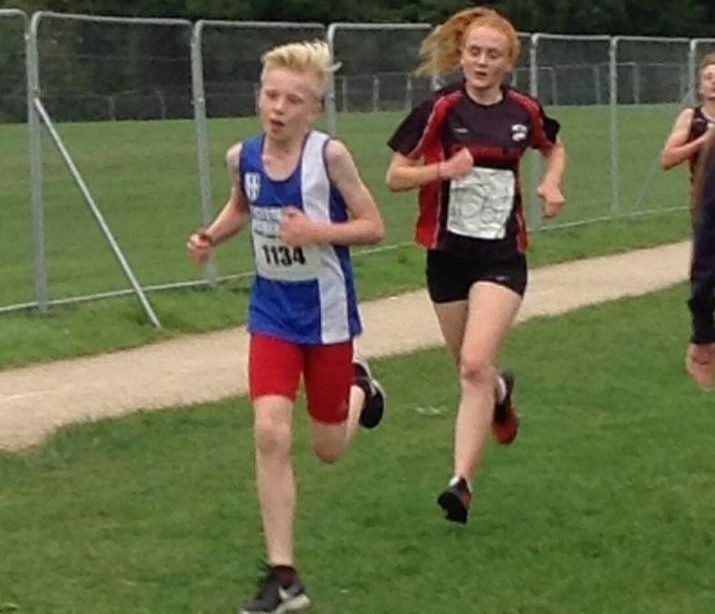 Codie Dewhurst bagged himself anothet top three place as he came home with a time of 7.14 in the U13 Boys Race as Libby Neal finished 10th in 9.03 in the U13 Girls Race. 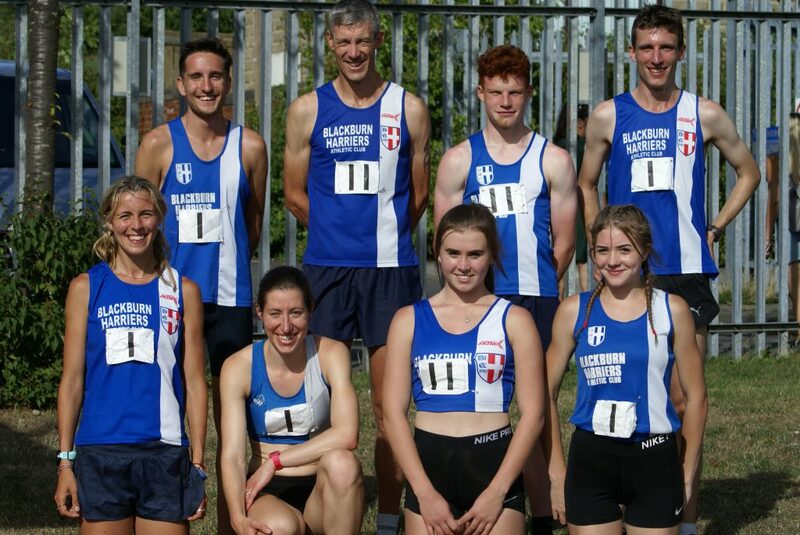 Another Saturday, another glorious day and another great performance by the Club in the last of this years Northern League fixtures, held at Cleckheaton. 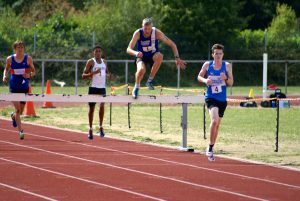 At this time of year, all teams are affected by holidays and when you throw in work and injuries, it can be a stressful time for team managers, trying to put their best teams out. 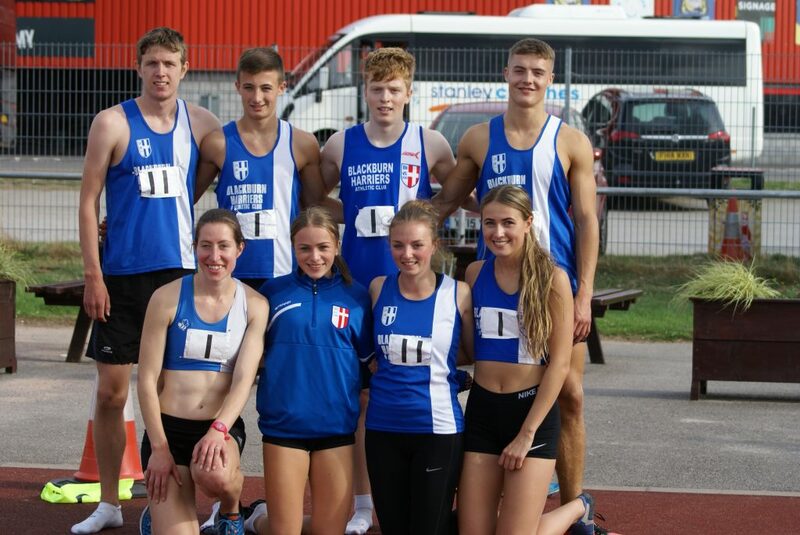 The Harriers went into this fixture missing more athletes than we have done this year, but what a reaction from everyone. 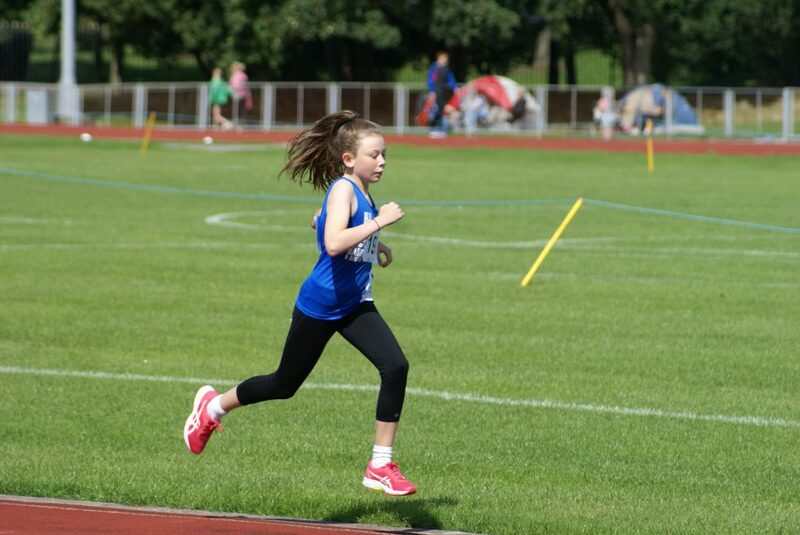 New athletes came in and performed tremendously well. 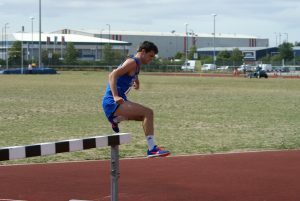 Other athletes took on more events than they would have been expected to do just to keep us in the hunt for a win on the day and to make it a clean sweep of four matches, four wins. 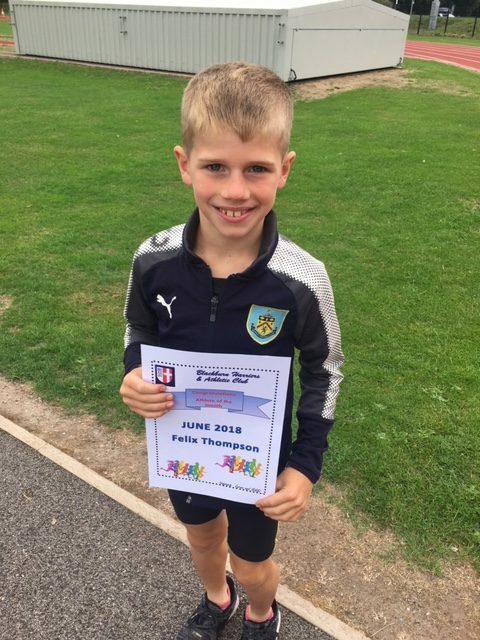 In the end we came up just seven points short as the team finished second to Holmfirth – the team spirit was amazing as can be evidenced by some of our throwers who took on high jump, sprints and sprint relays after losing a number of our 1st chcoice sprinters for the day – you really can’t ask for more. 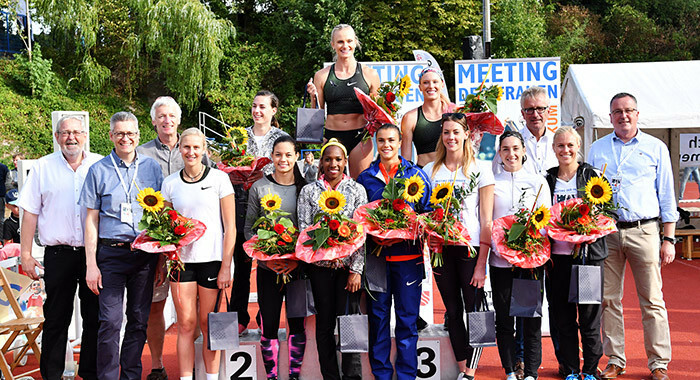 What a fabulous group of athletes to be part of. 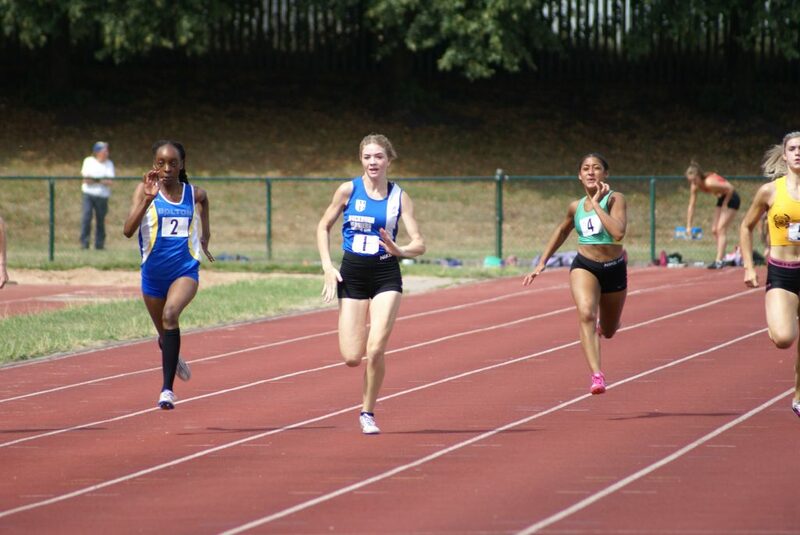 A great start for the Sprinters as Bailey Madden won the ‘A’ 100m in 12.7 and backed up by Emily Warren in the ‘B’ with a 2nd placed time of 13.3 followed by both women taking 3rd places in the 200m with times of 26.8 and 27.5 respectively. 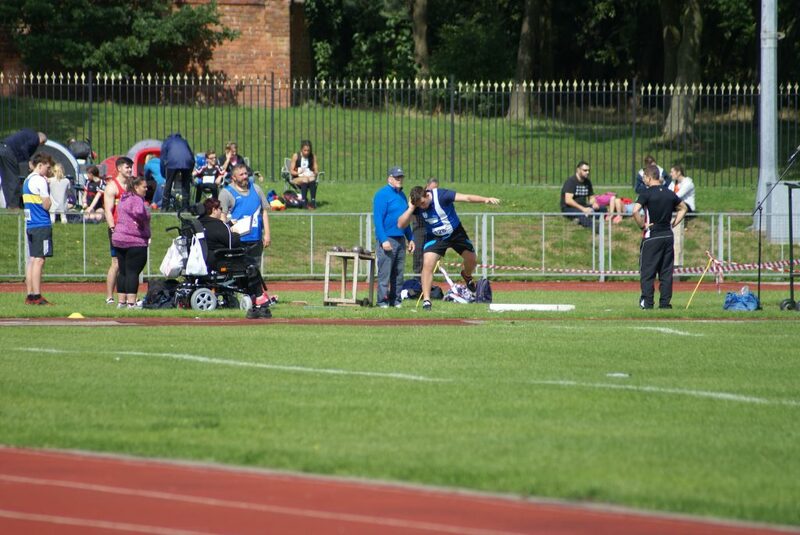 The Men’s Sprints squad having lost three members to holidays and injuries were under pressure – Dominic Bretherton who was nursing an injury himself still managed to run the 100m in 11.7 for 4th place and in the ‘B’ Hammer thrower Nathan Billington volunteered to step in and ran a very credible 13.6 for 6th. 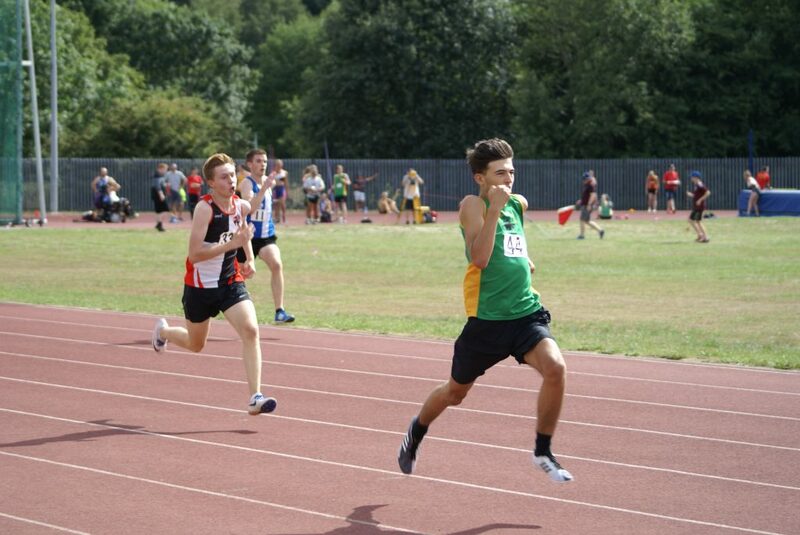 U17 Ethan Joyce was competing at his first Senior event and stepped into the ‘A’ 200m at the last minute to run 26.0 in 6th place with Nicholas Massey clocking 25.6 (6th) in the ‘B’. 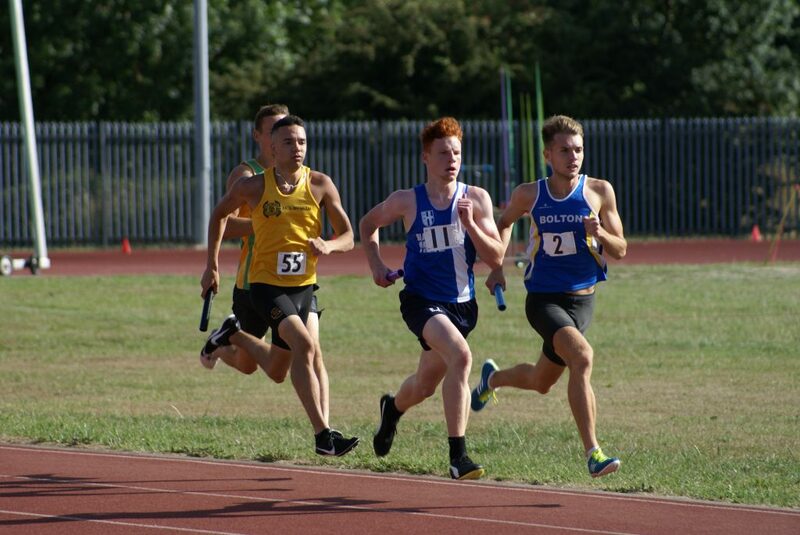 Holidays meant that we had no women athletes in the 400m or the 400m Hurdles – in the Men’s 400m Ethan Joyce made his debut at the distance for the senior team, running 55.1 in the ‘A’ for 4th spot with Joe Gebbie taking 2nd in the ‘B’ in a new PB of 55.7. 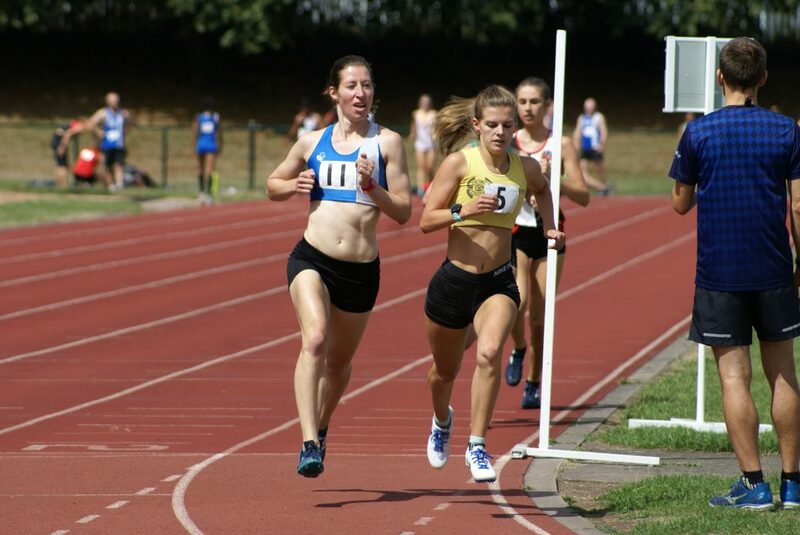 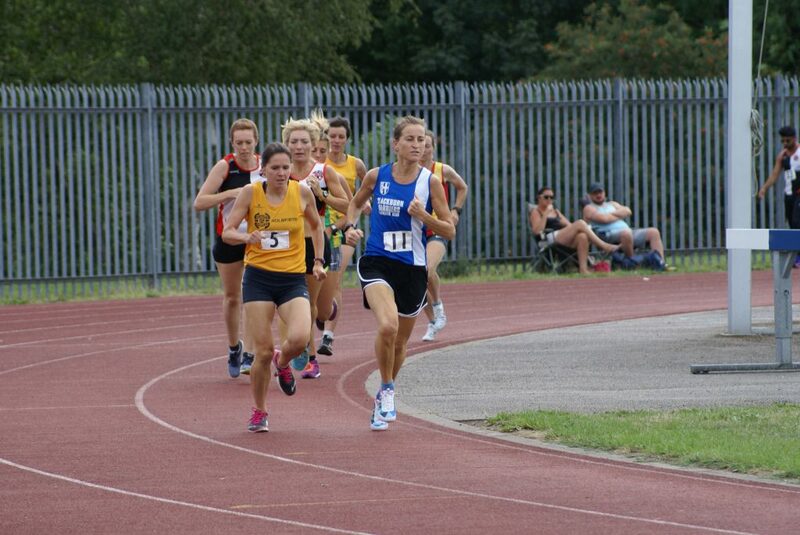 The Women’s 800m saw Jess Judd making her debut for the Club in Team events as she tore through the first 200m, going on to win the ‘A’ race in 2.06.2 with Alison Lundy making it maxoimum points in the ‘B’ with a winning time of 2.15.9. 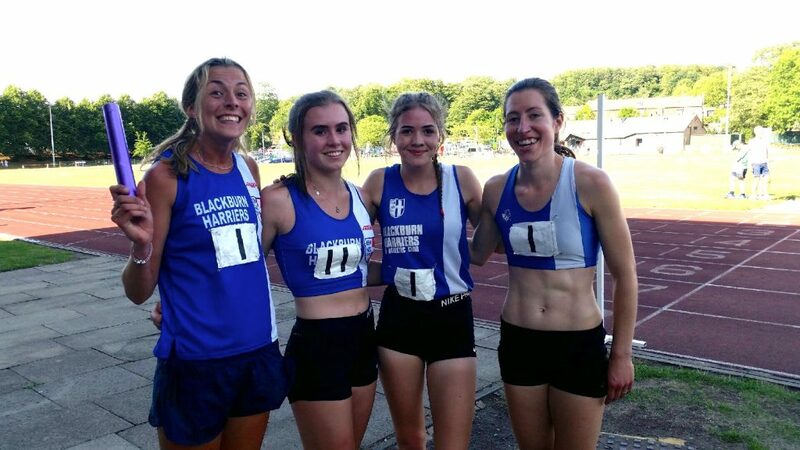 Maximum points again in the 1500m as Alison Lundy won the ‘A’ in 4.45.8 and in the ‘B’ a great run by another U17 making her debut at senior level – Amy Davies – winning with a seasons best time of 5.03.1. 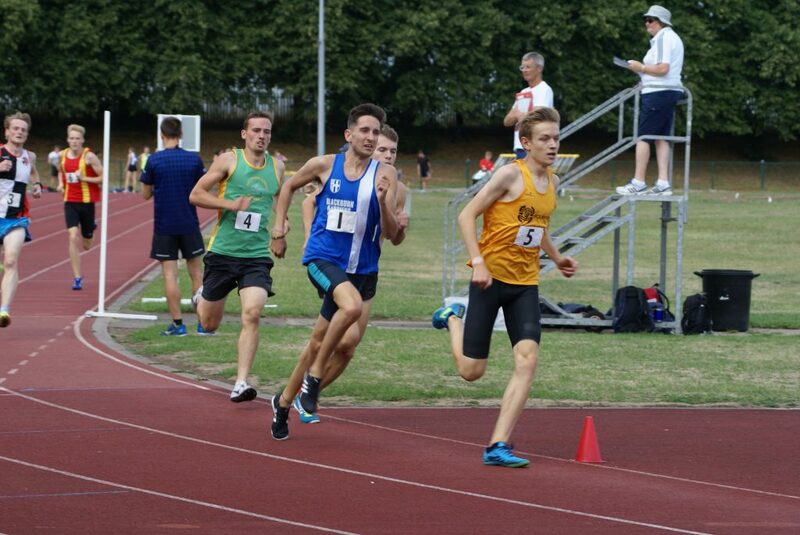 The Men’s 800m ‘A’ Race saw Rob Warner run a seasons best 1.56.2 in 2nd place with Joe Gebbie running a new PB of 2.01.9 in 3rd place in the ‘B’. 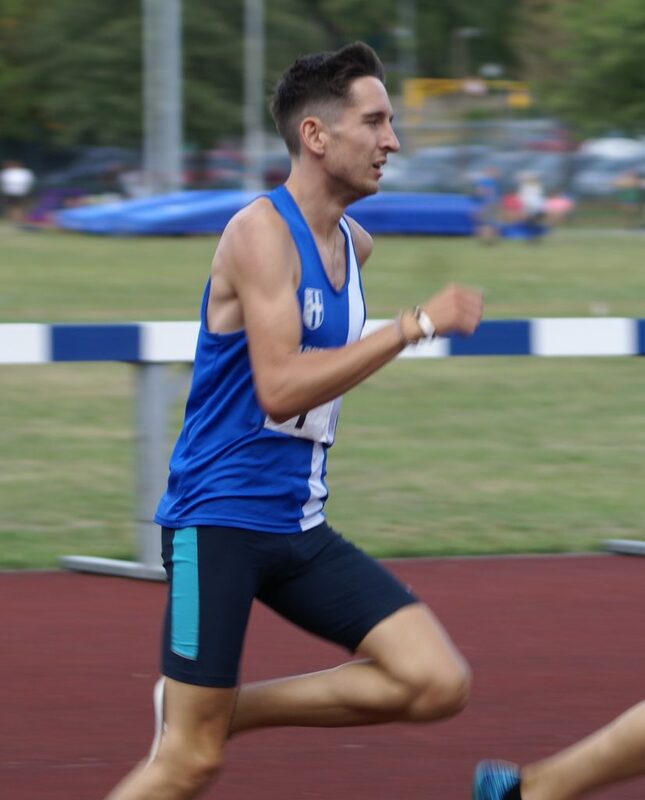 Tim Raynes clocked 4.06.7 as he led from the front in the 1500m ‘A’ race to come home in 3rd place – and – echoing the spirit within the team on the day, Chris Davies stepped out of his comfort zone to run his second ever 1500m, clocking a massive new PB by 20 seconds of 4.26.5 in 2nd position. 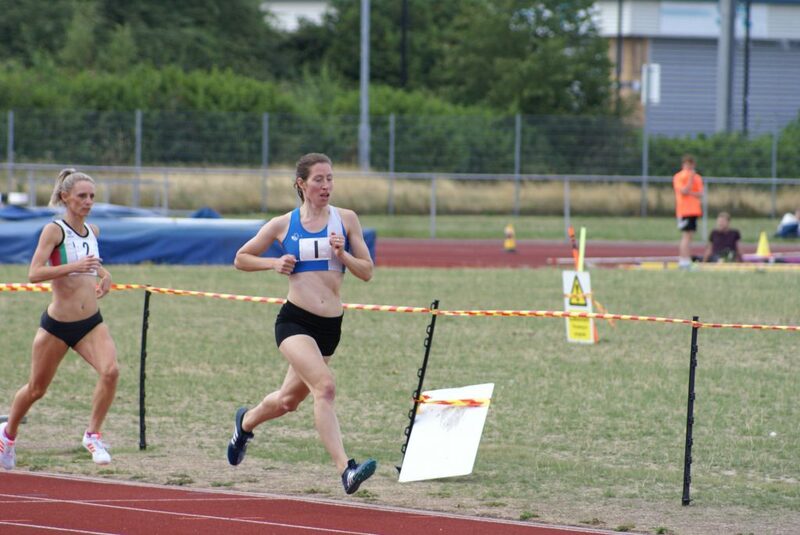 The 3000m produced maximum points again as Jess Judd ran away with the ‘A’ race from the off, winning in a time of 9.20.0 with another great run from Joanne Nelson in the ‘B’ as she won very comfortably in 11.01.9. 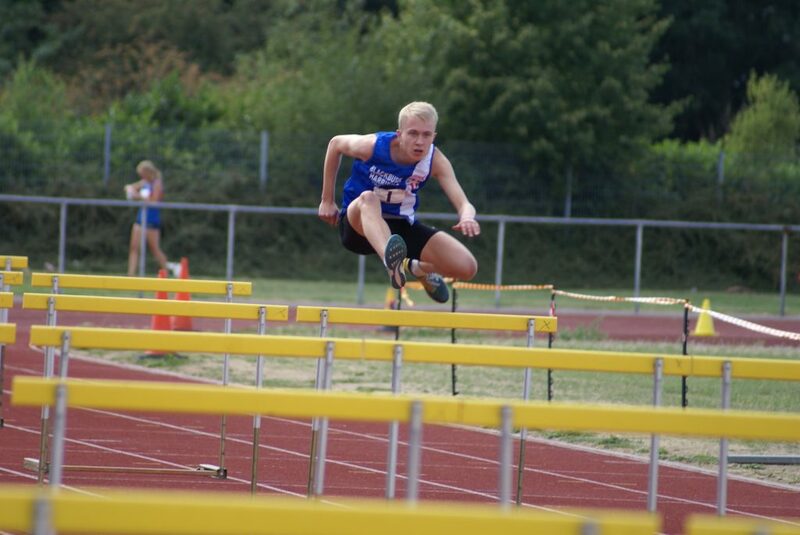 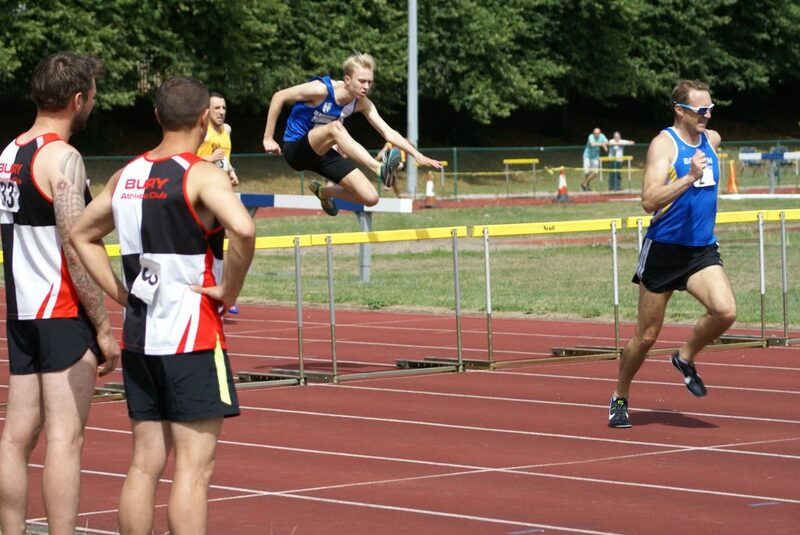 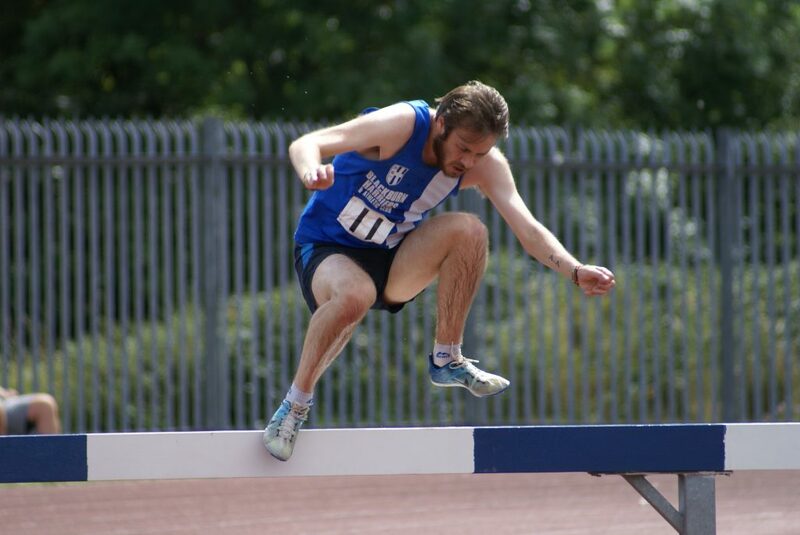 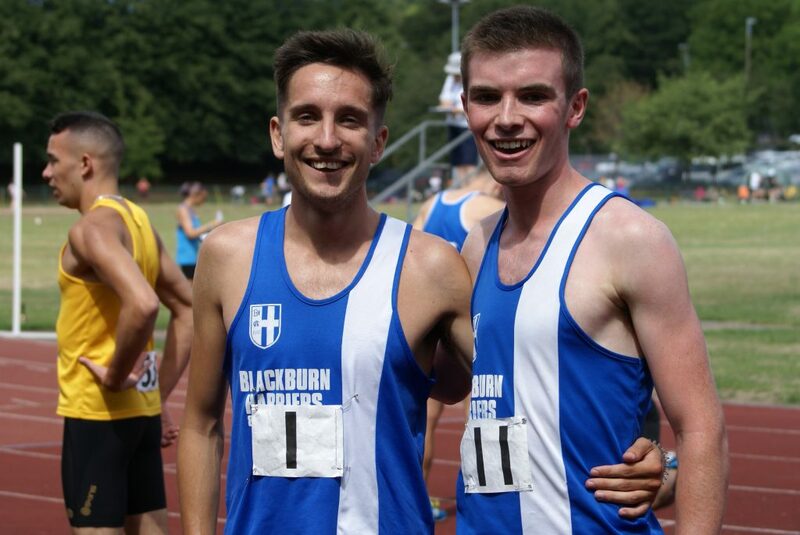 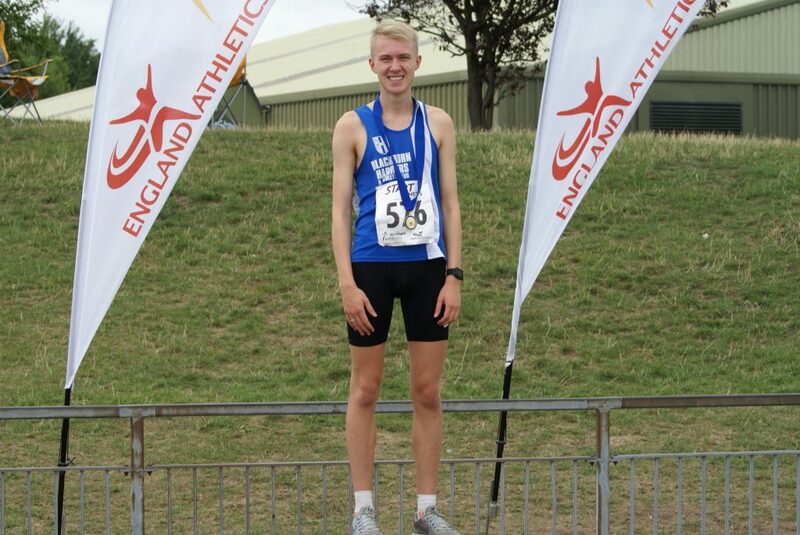 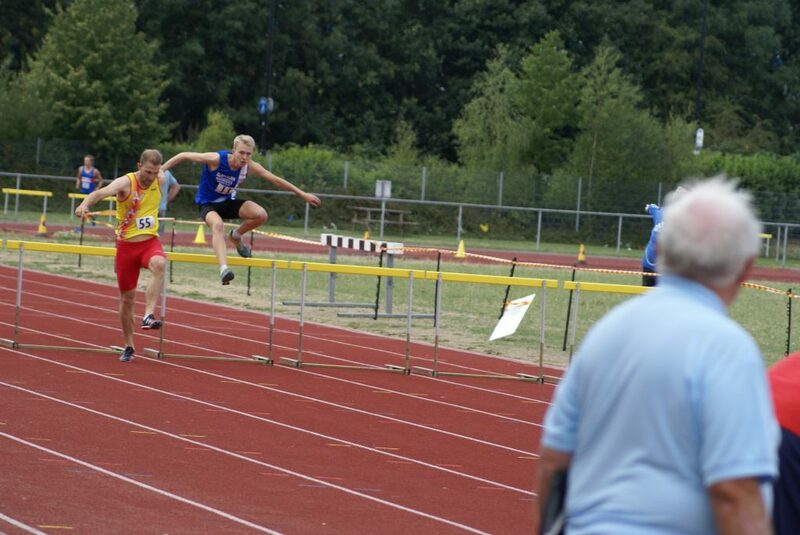 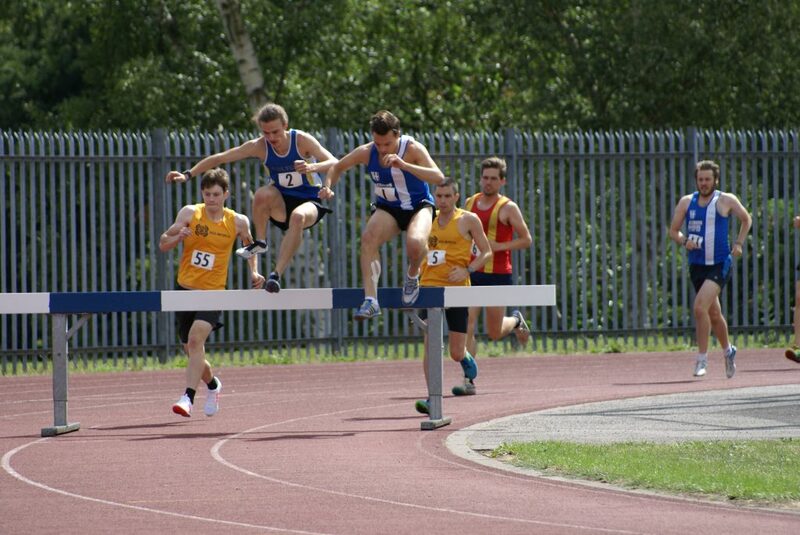 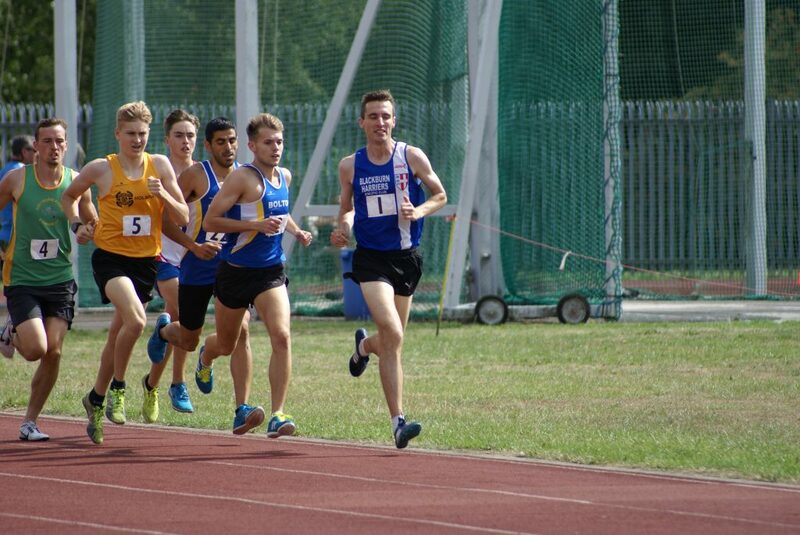 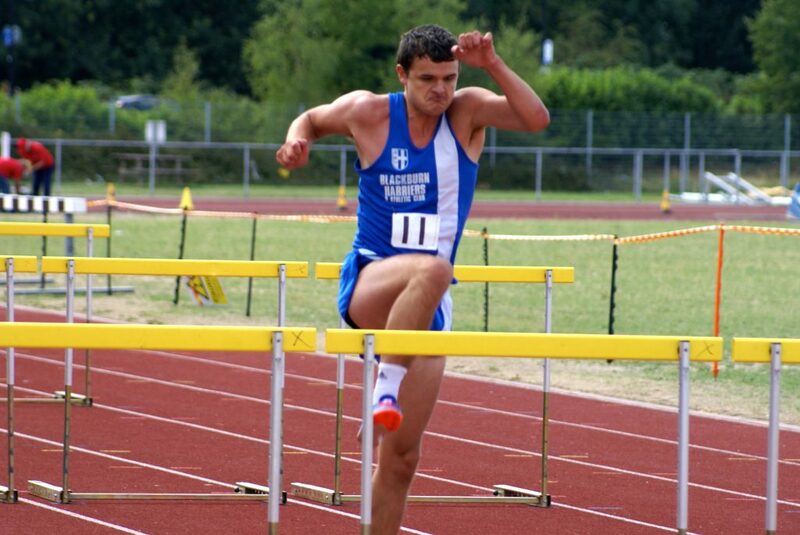 Marc Hartley was another athlete carrying an injury who pushed himself through the pain barrier to run the ‘A’ 3000m Steeplechase finishing 3rd in 10.51.8 with Karl Billington volunteering to run the ‘B’ race and earning the team very good points with a 2nd placed run of 11.19.2. 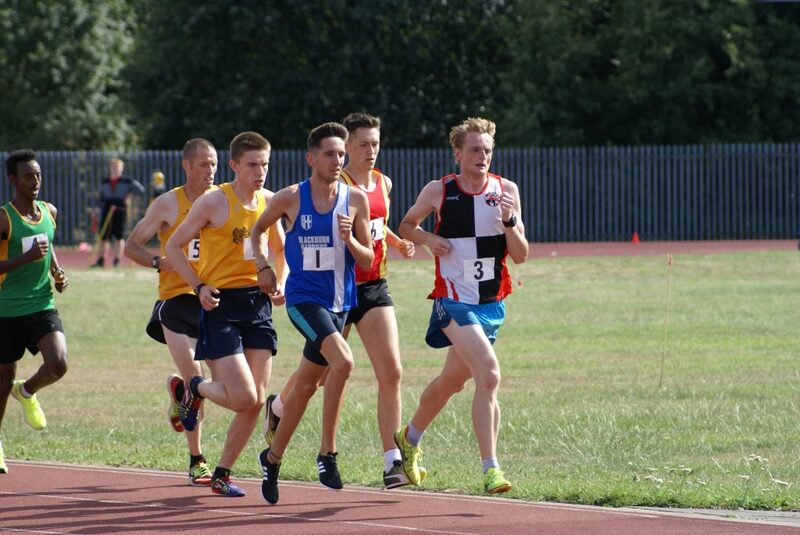 Rob Warner having run the 800m doubled up in the 5000m and won the ‘A’ in 16.01.6 with Tom Blaney making his senior team track debut running a great race to win the ‘B’ in 16.33.9. 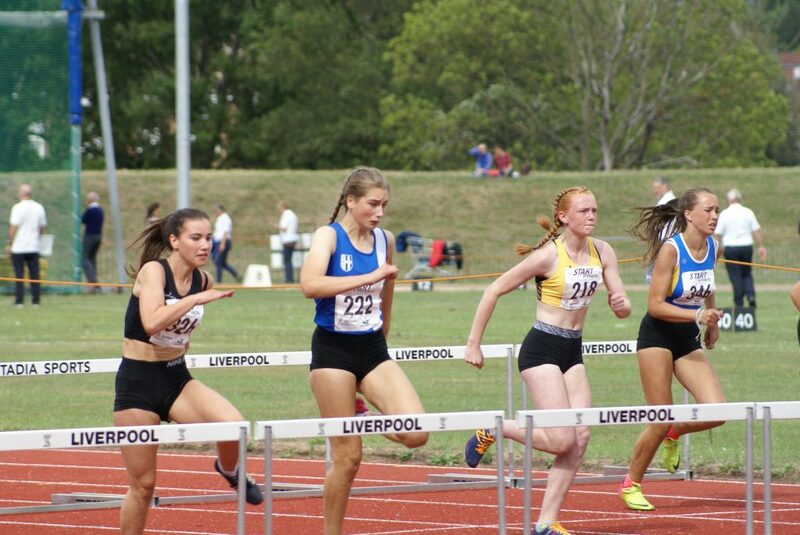 Wonderful to see Polly Pearse back in action for the team as she ran 16.9 in the ‘A’ 100m Hurdles for 2nd place whilst Nicholas Smith ran 21.8 for 3rd in the Men’s 110m Hurdles and John iLunga 21.6 in the ‘B’ fopr 3rd spot. 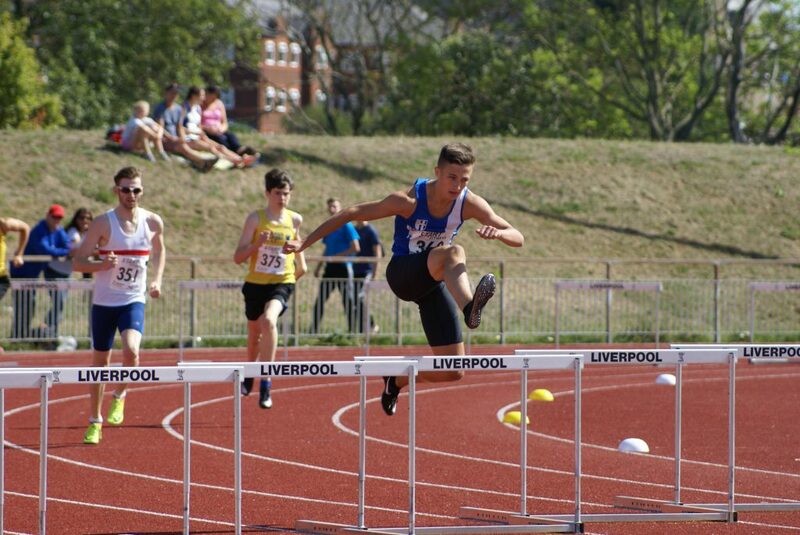 Nicholas and John also teamed up int he 400m Hurdles with Nicholas taking 2nd in the ‘A’ (62.5) and John 3rd in the ‘B’ equaling his seasons best of 69.6. 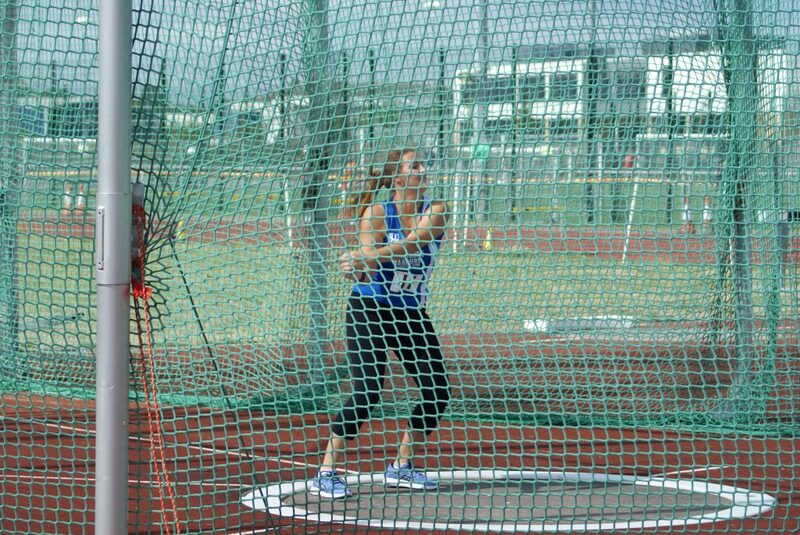 Anna Peers and Emily Taberner made a great contribution to the team total in the Throws. 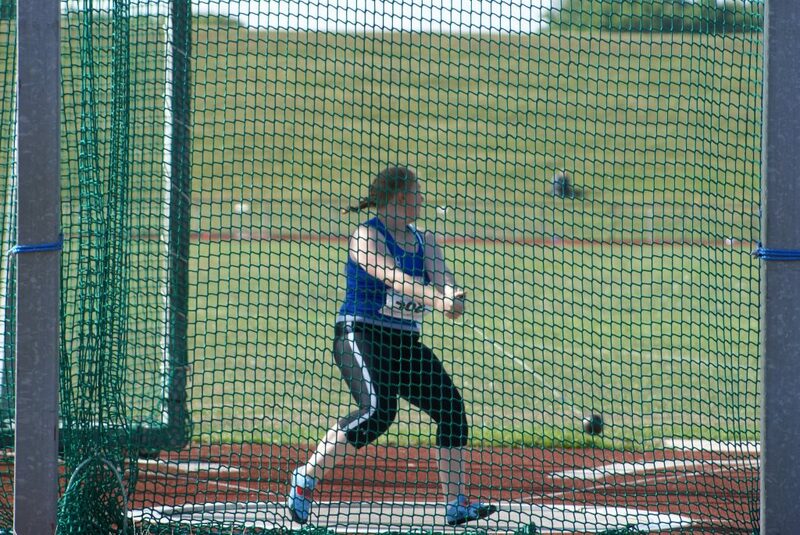 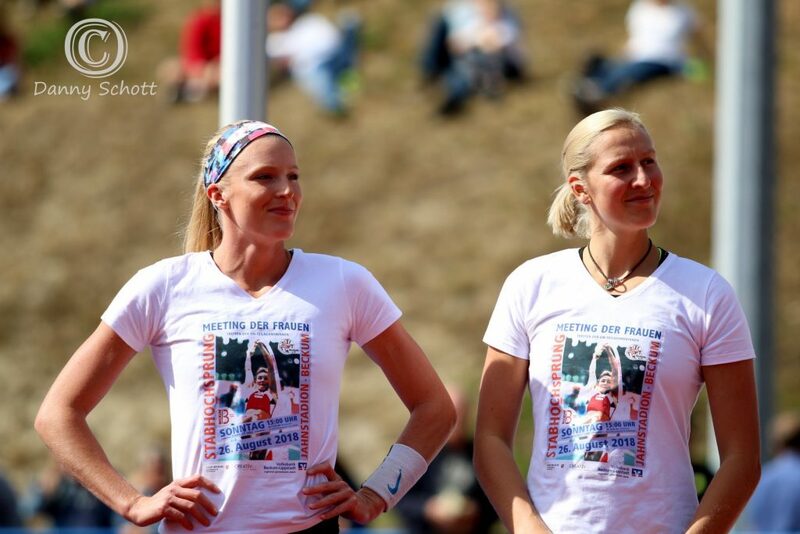 Starting in the Hammer Anna came 3rd in the ‘A’ (27.01m) and Emily 2nd in the ‘B’ with 18.13m. 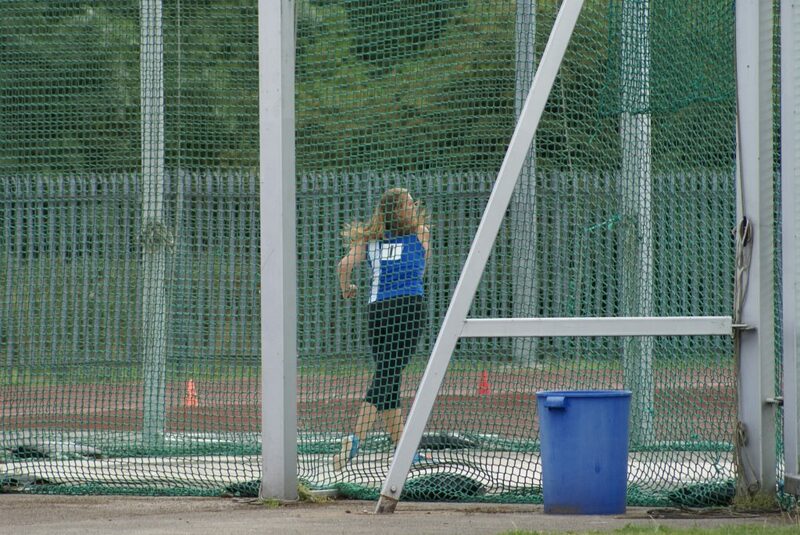 The two of them went on to win the Discus with Anna throwing 35.13m in the ‘A’ and Emily 22.37m in the ‘B’. 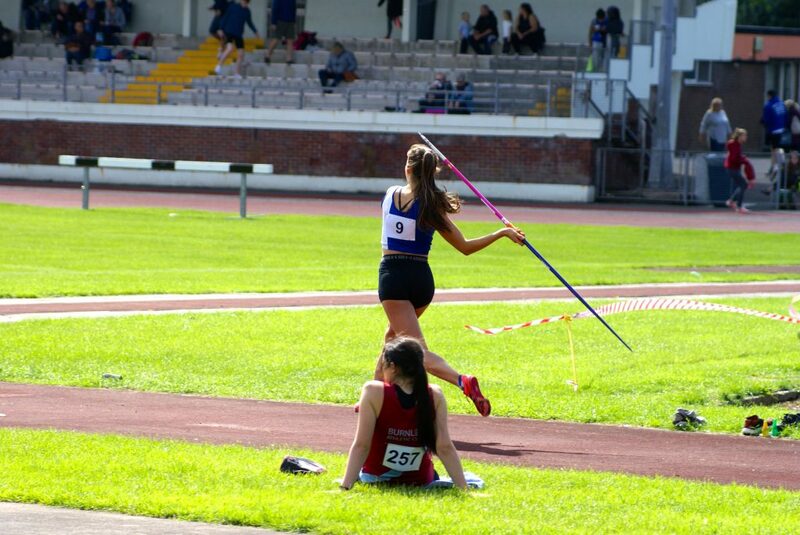 On to the Javelin and another double win which saw Anna throw a seasons best of 38.40m in the ‘A’ and Emily 29.19m in the ‘B’. 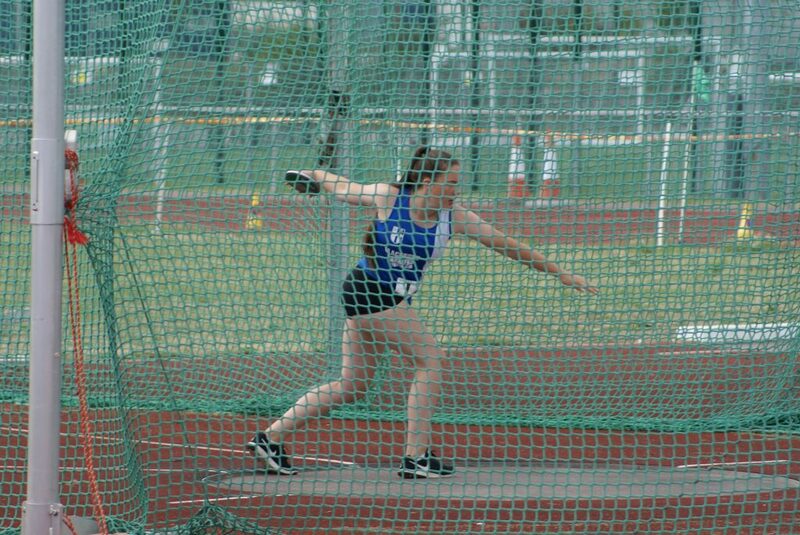 And in the last of the Throws events Anna took 2nd spot in the ‘A’ Shot Putt with 10.17m and Emily also 2nd in the ‘B’ with 7.95m. 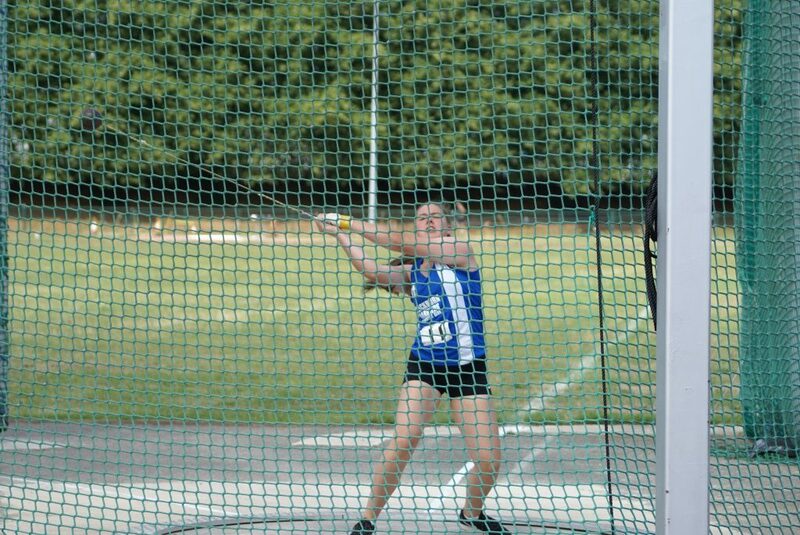 The contribution to the teams success this year by the Throws squad cannot be over emphasised as the men and the women have been tremdously consistent throughout the whole season. 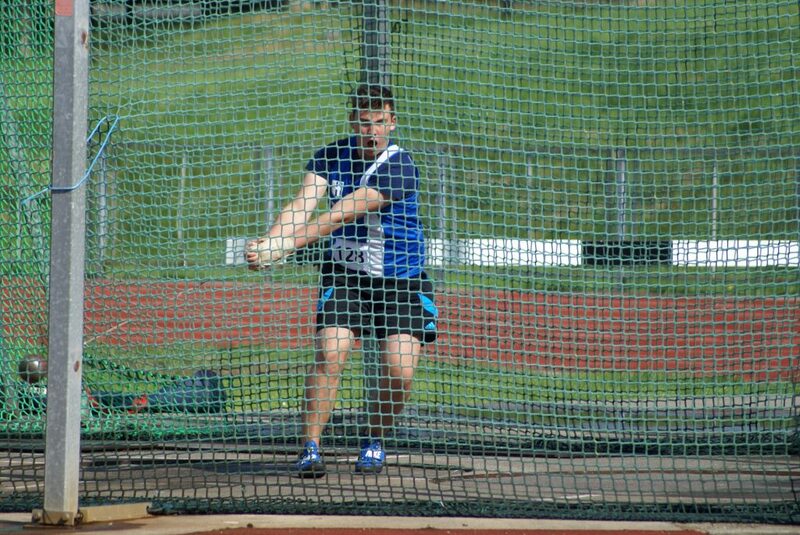 Today the Men started off winning both ‘A’ and ‘B’ Hammer with Anthony Kent throwing 38.33m in the ‘A’ and Nathan Billington 36.82m in the ‘B’. 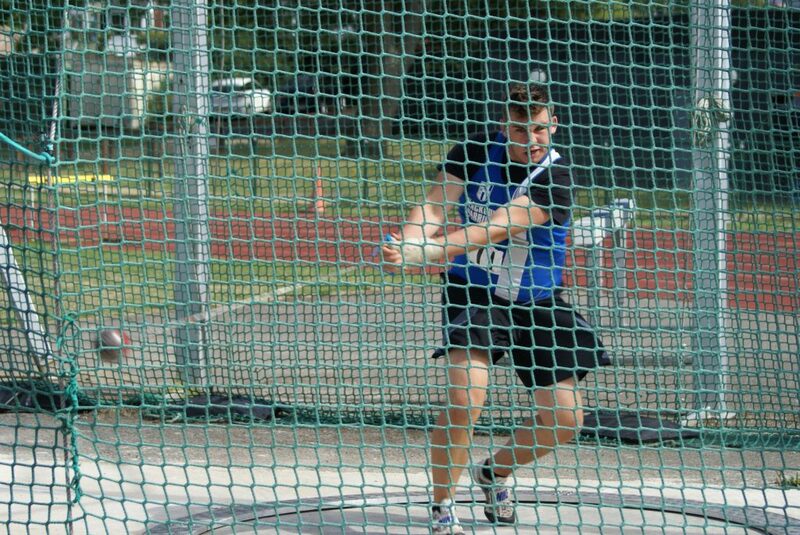 In the Discus Anthony placed 3rd in the ‘A’ with 32.66m followed in the ‘B’ by a win for Tony Balko with a throw of 29.05m. 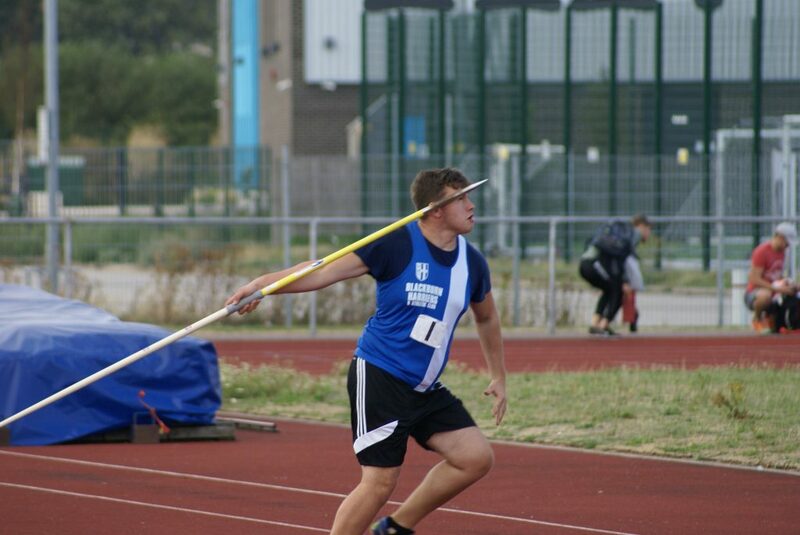 In the Javelin, Anthony threw a new PB by over 2 metres of 38.78m in 3rd with Nathan Billington placing 4th in the ‘B’ (26.77m). 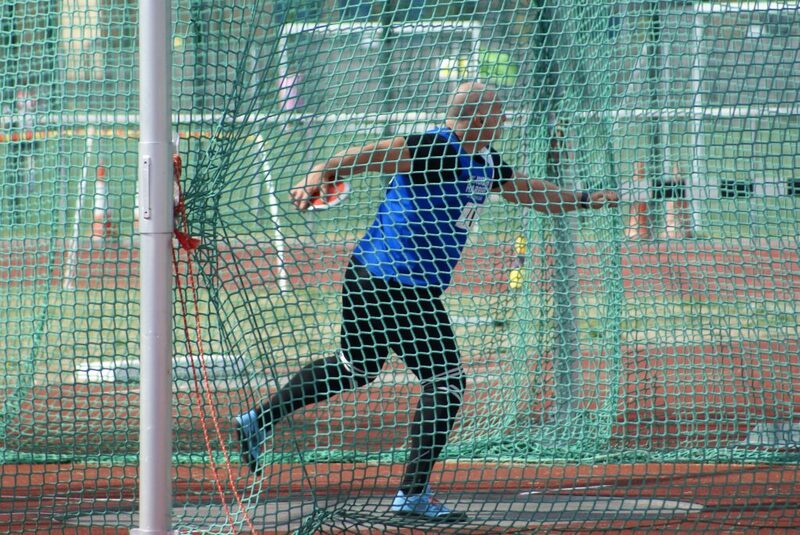 And in the final throws events – another double win – with Anthony winning the ‘A’ (11.09m) and Tony Balko also winning the ‘B’ with 9.42m. 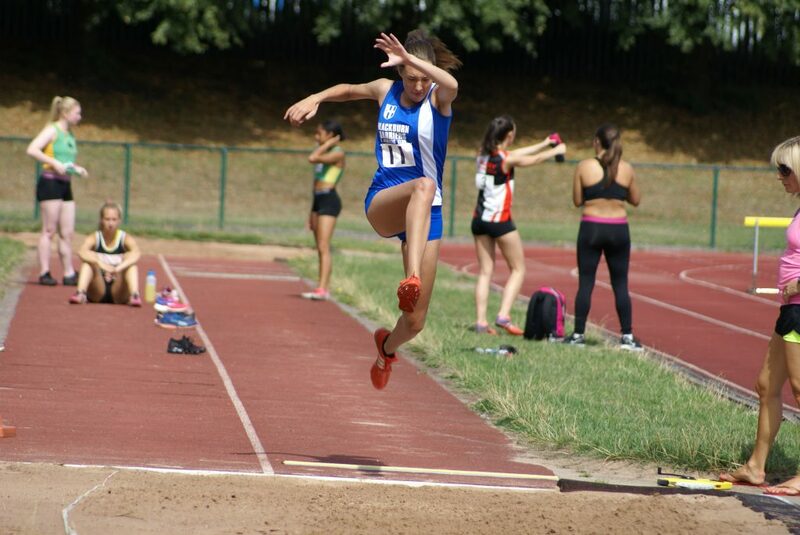 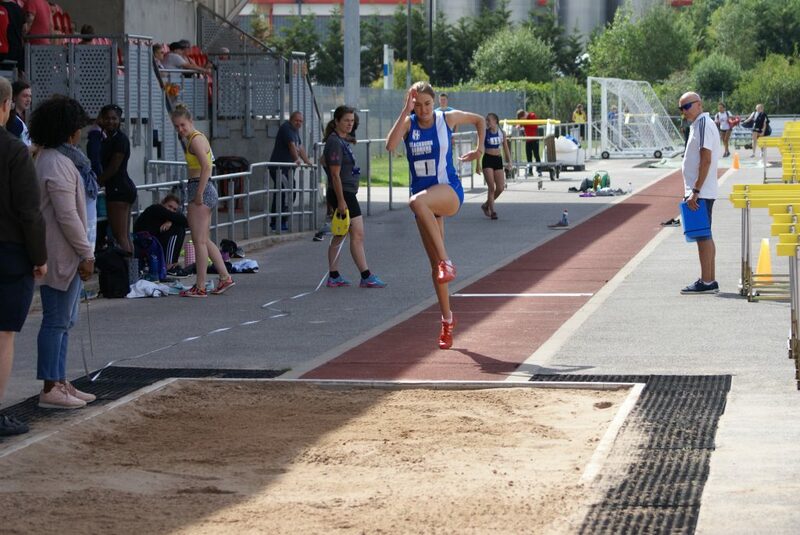 In the Jumps Polly Pearse was back on old territory as she jumped for the first time since 2016 posting 4.54m in the ‘A’ Long Jump in 4th, leapt 9.78m in the ‘A’ Triple Jump in 2nd place and won the ‘A’ High Jump with a clearance of 1.50m for a fabulous return to competition. 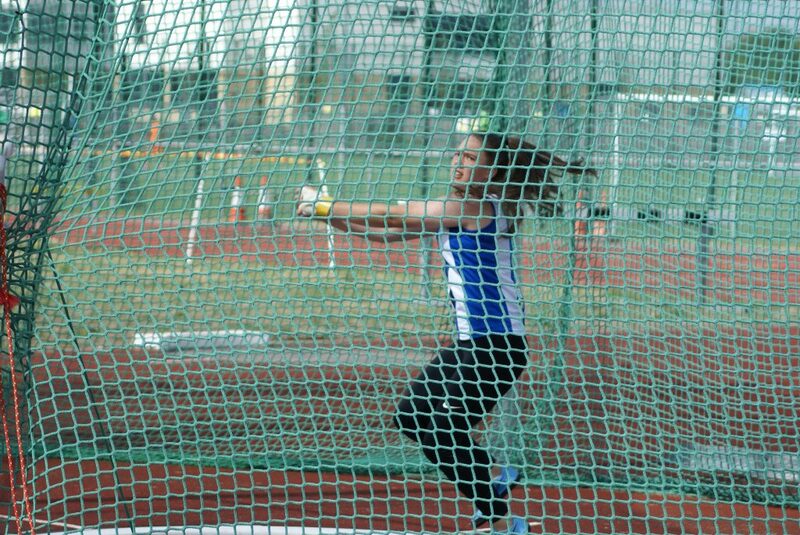 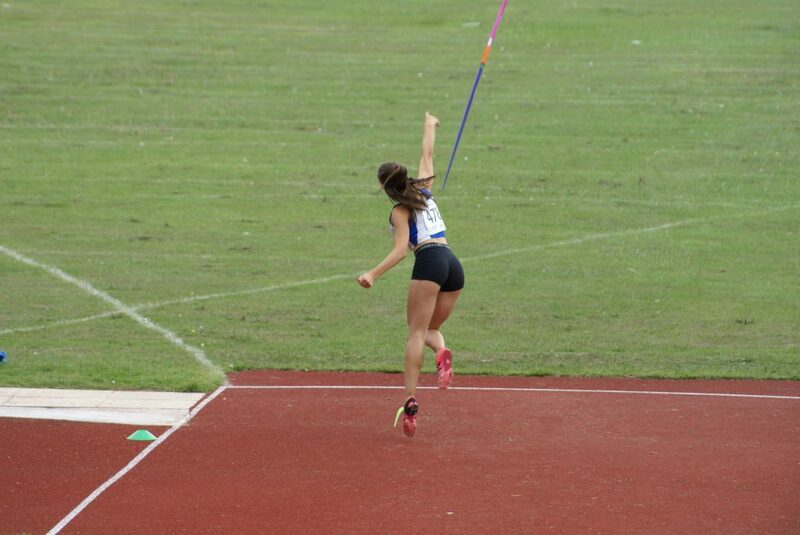 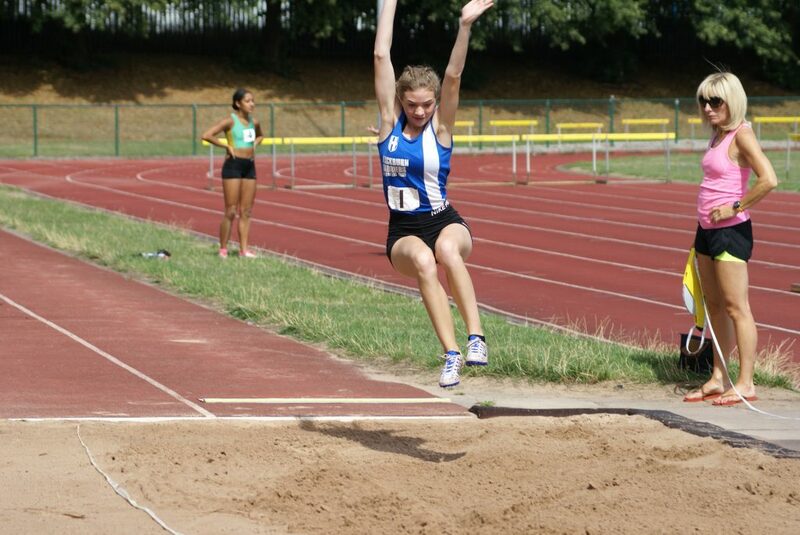 And what about thrower Anna Peers who took on the ‘B’ High Jump to help the team gain points clearing 1.15m in 3rd place. 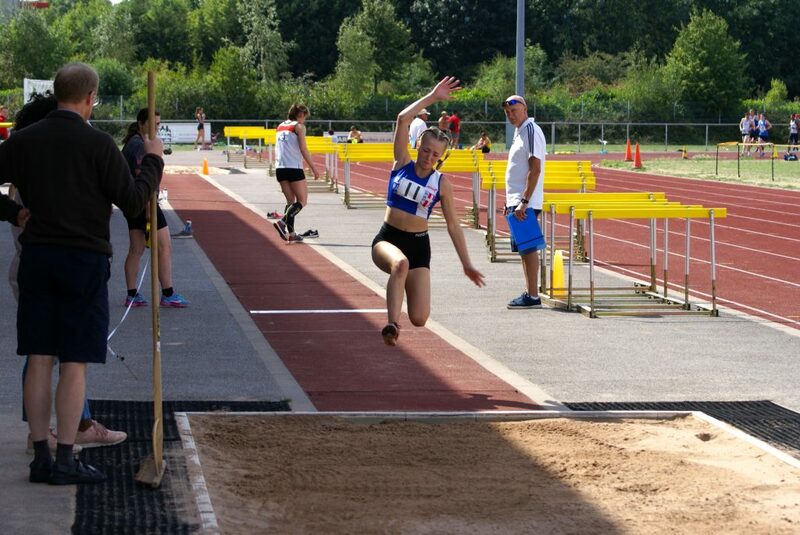 Bailey Madden backed this up really well with 3rd in the ‘B’ Long Jump (4.37m) and then won the ‘B’ Triple Jump with a leap of 9.44m – her first time ever at the event!! 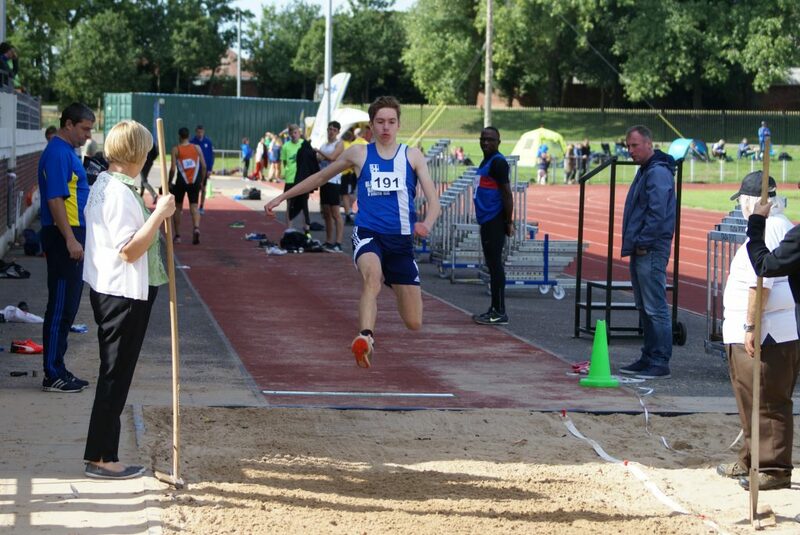 In the Men’s Jumps Ben Branton is another promising U17 making his senior debut in the Long Jump where he placed 5th in the ‘A’ with a distance of 5.49m just outside his seasons best. 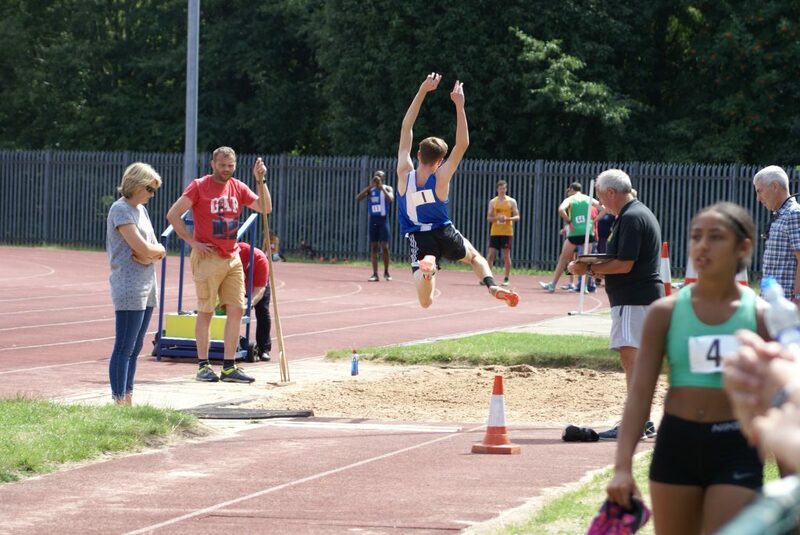 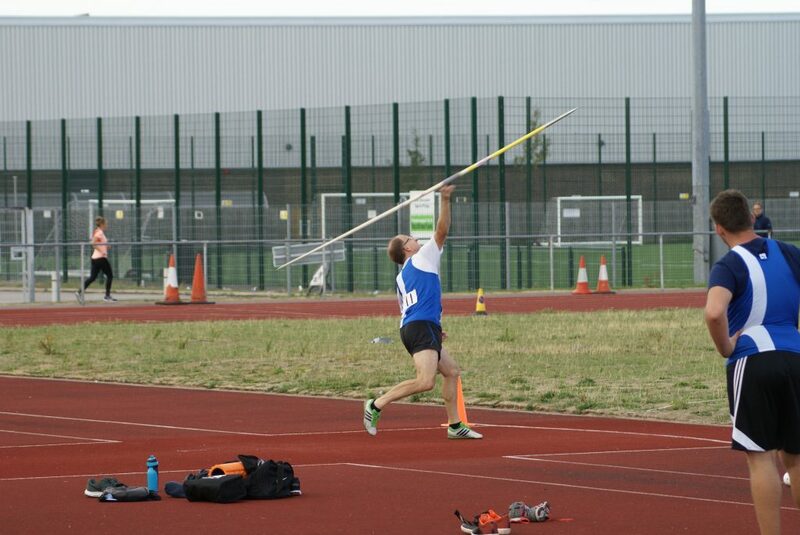 Dominic Bretherton carrying an injury, stepped into to help the team in the ‘B’ and managed to get only one jump, before retiring, which was good enough to win the ‘B’ (4.89m). 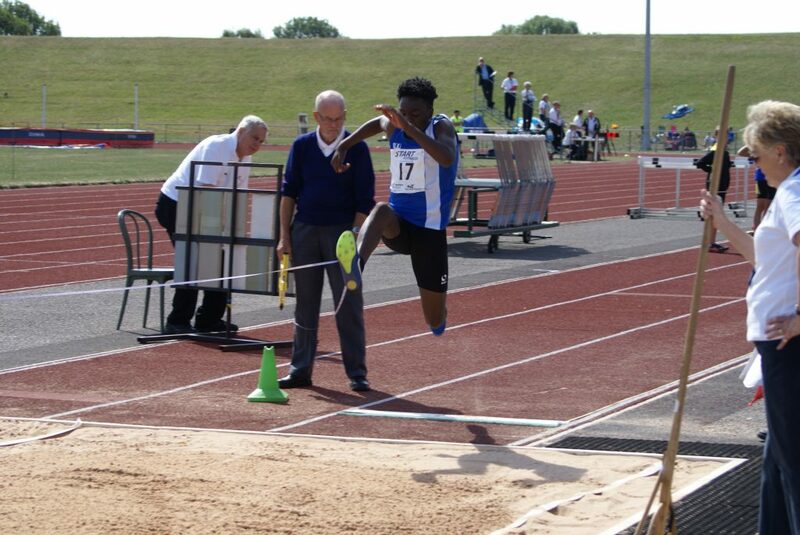 Nicholas Smith and John iLunga teamed up in the Triple Jump with Nicholas placing 4th in the ‘A” (10.96m) just 3cms outside his personal best and John leapt to 9.94m in the ‘B’ for 2nd spot. 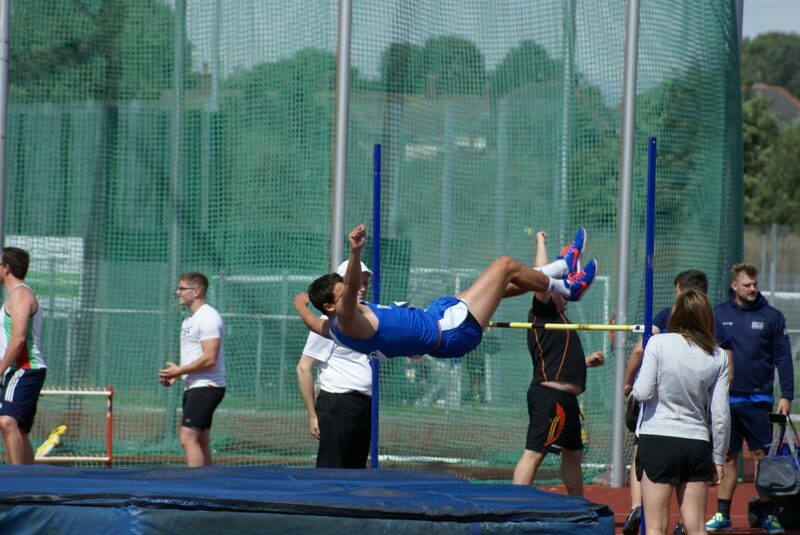 The lads then took two 3rd places in the High Jump with Nicholas clearing 1.65m in the ‘A’ and John 1.55m in the ‘B’. 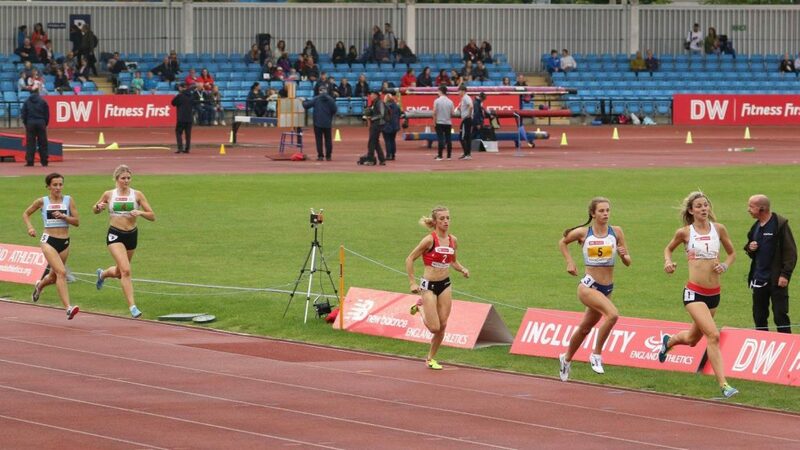 In the Relays, the Women’s 4 x 400m team produced a fine win in 4.09.8 – just a second outside the Club record which has stood since 2005 (4.08.4). 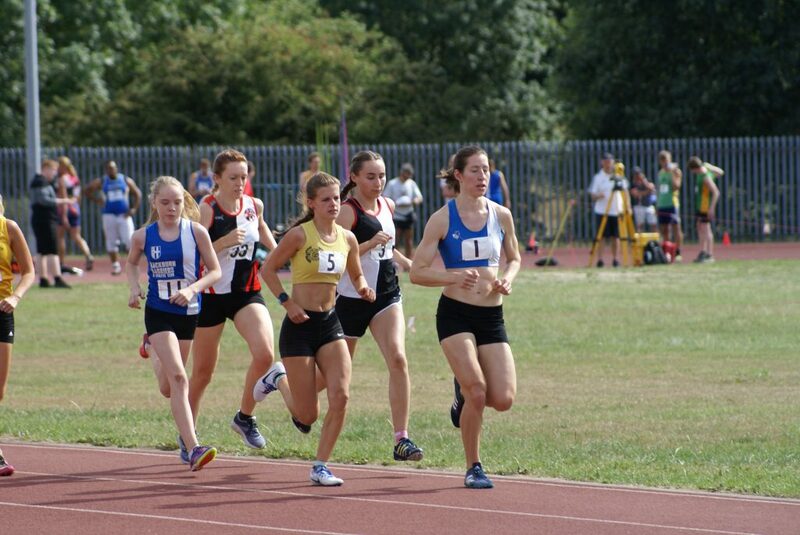 In that 2005 team was one Alison Leonard (now Alison Lundy) who was also part of this squad which was led off by Emily Warren, handing over to Alison Lundy on Leg 2, with Bailey Madden on Leg 3 who handed over to Jess Judd on the final leg which saw her catch the leading Bolton athlete at about 250m, pushing on to finish with a 57 second last leg. 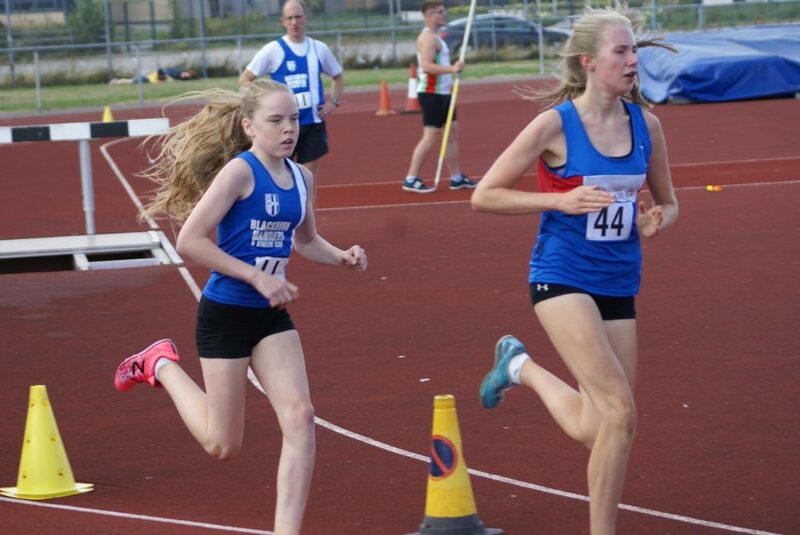 Another example of the wonderful team spirit here as Emily Warren was running only her second ever 400m and Bailey Madden had never raced the distance before. 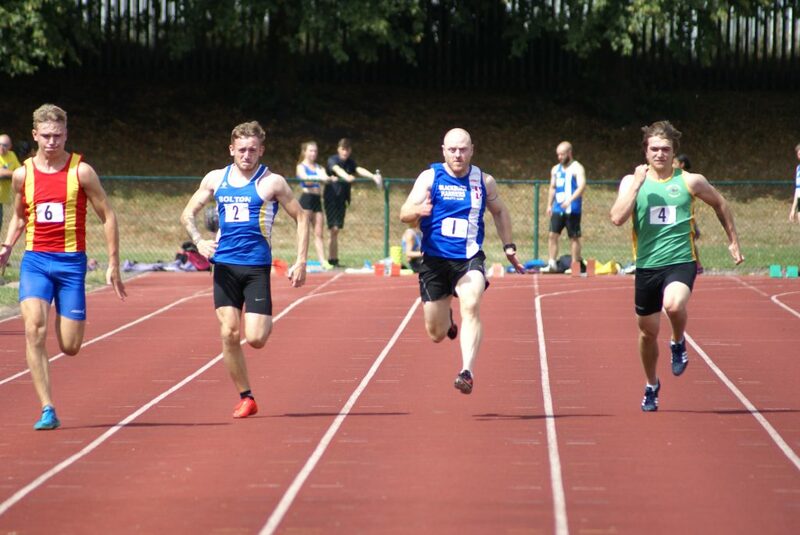 When it comes to team spirit, the men weren’t lacking either as the Harriers finished 5th (51.8) in the 4 x 100m – a team which included two hammer throwers who volunteered to make up the squad – so hats off to Nathan Billington, Nicholas Massey, Nicholas Smith and Anthony Kent. 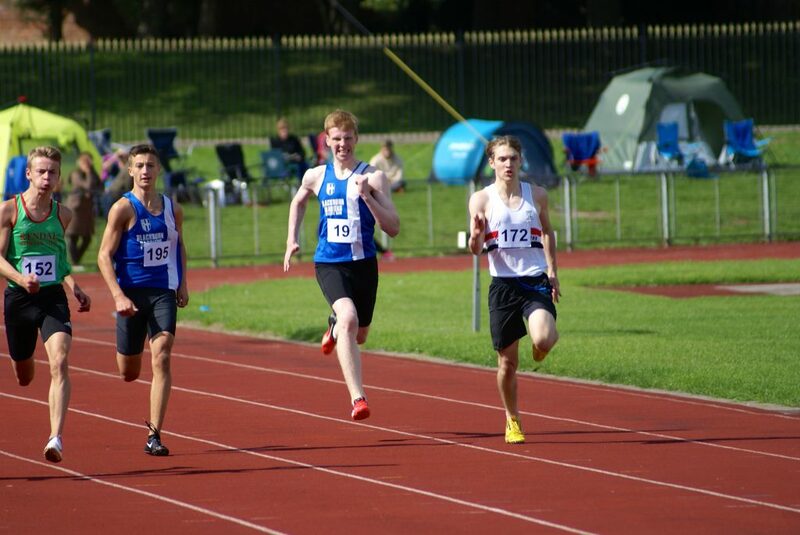 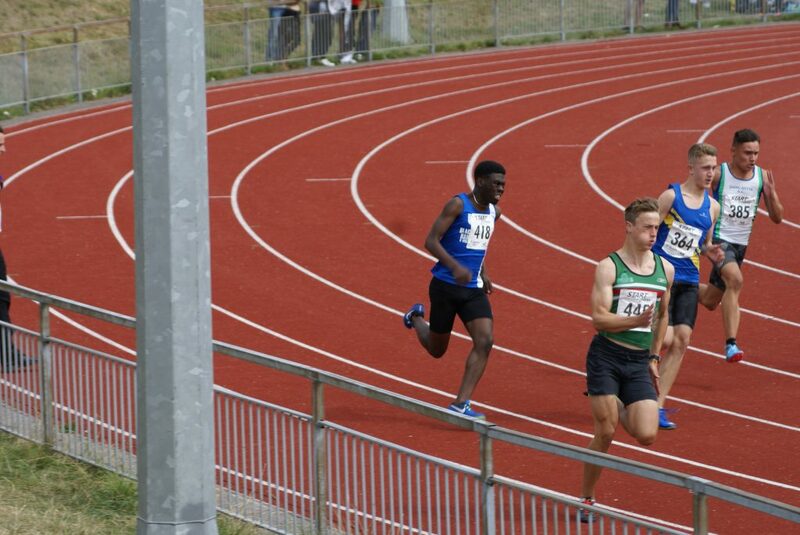 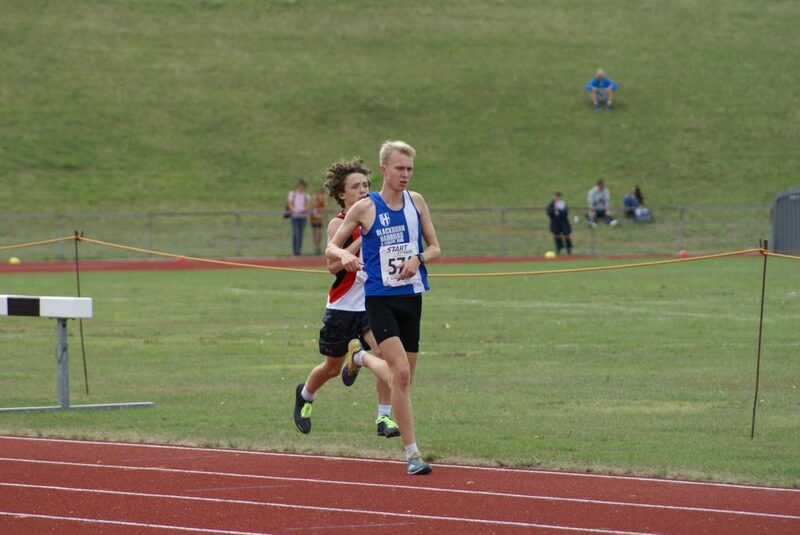 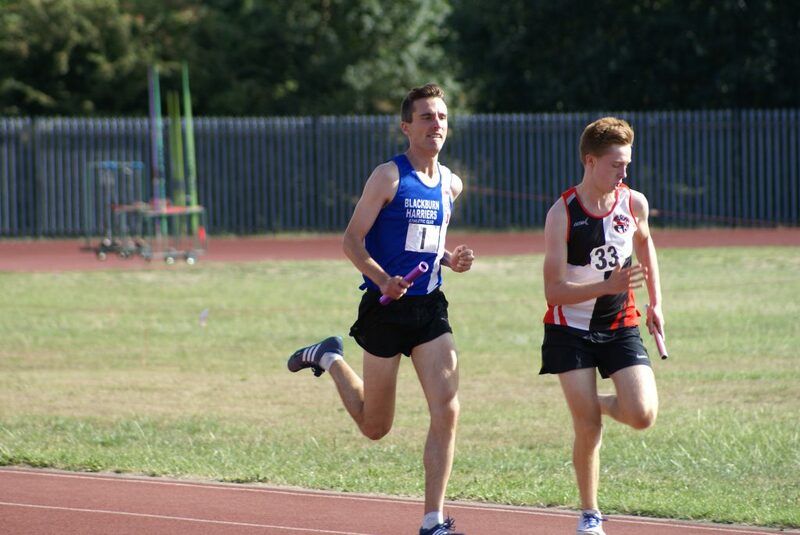 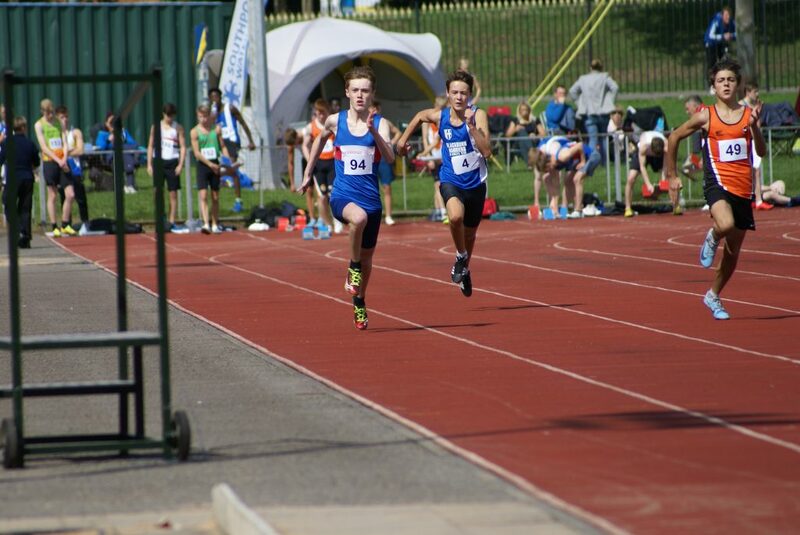 Similarly in the 4 x 400m where U17 Ethan Joyce who had already run two races took on Leg 1 (55.7) handing over to Chris Davies who is not a 400m specialist (57.6) with Tim Raynes who had run the 1500m previously along with Chris clocking 56.5 on Leg 3 and then Rob Warner posting a final Leg time of 55.3 after running the 800m and 500m. 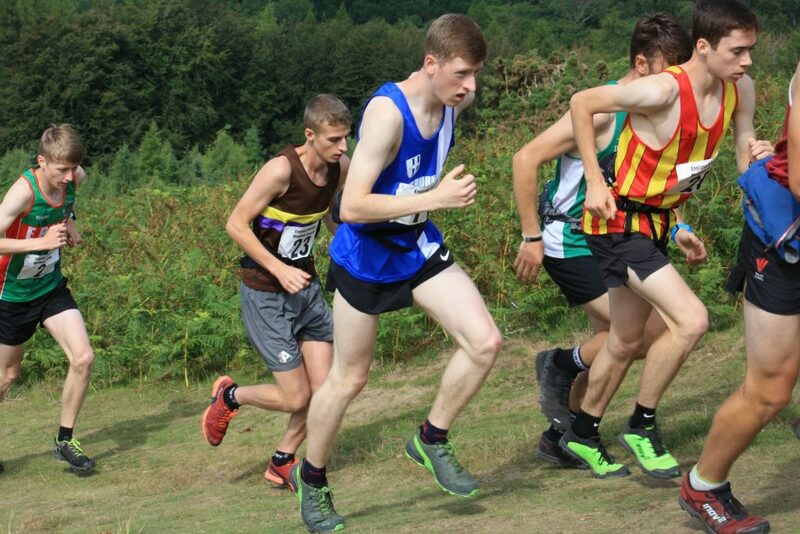 Jack Hindle took on the Snowman Classic Distance at the weekend – an event described as one of the toughest in the country. 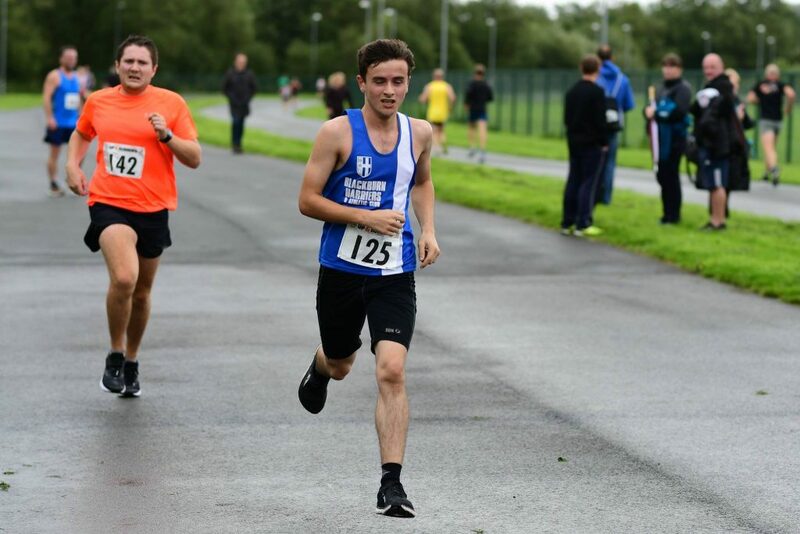 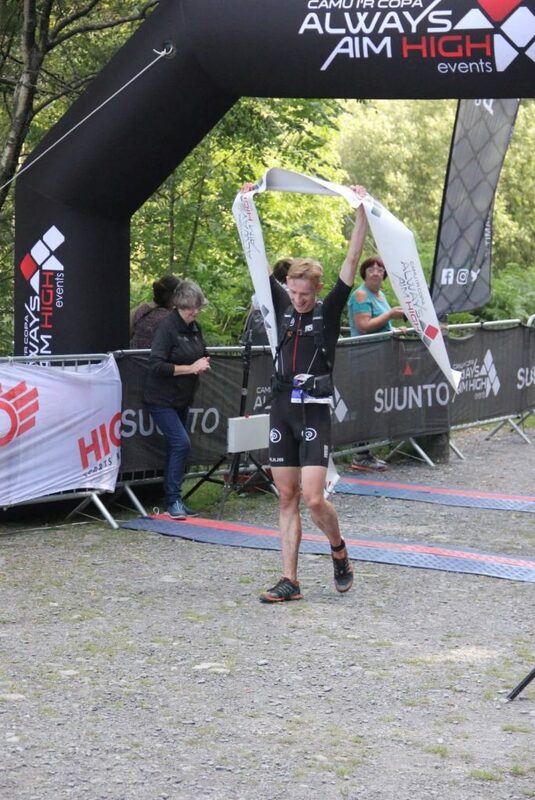 Not only did Jack win the event by over five minutes from the 2nd placed finisher Llewellyn Holmes he smashed the Course Record by some twelve minutes to top of a magnificent overall performance clocking 3hr.11.47. 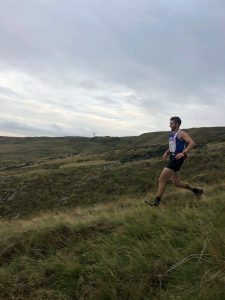 Also competing in the event was Craig Greenough who finished with a total time of 4hr 07.29 to finish 32nd male and 10th V40. 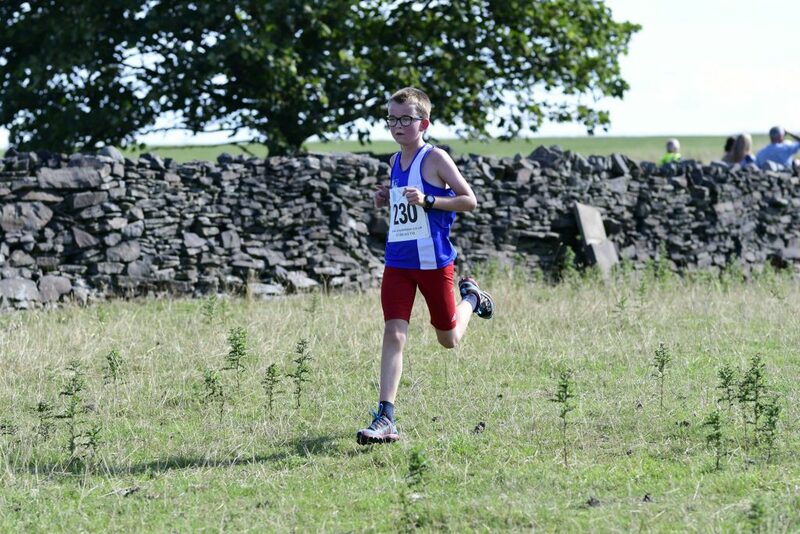 On Sunday evening Jack told the Harriers “I’ve had the Snowman as a target race ever since the Slateman. 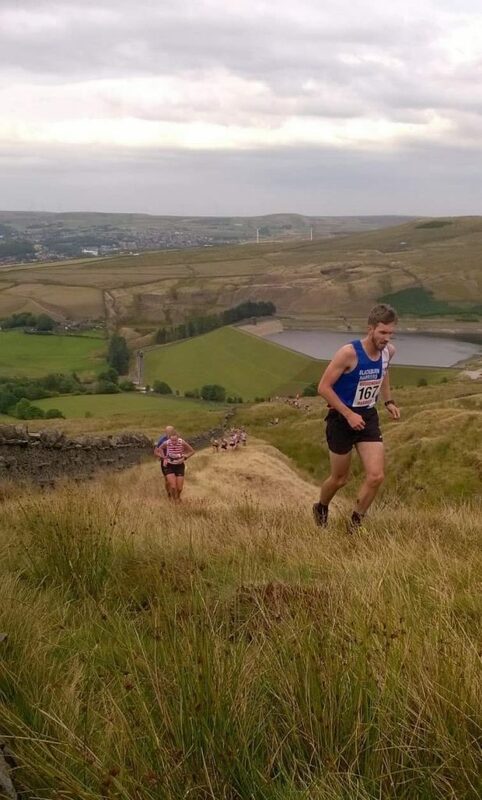 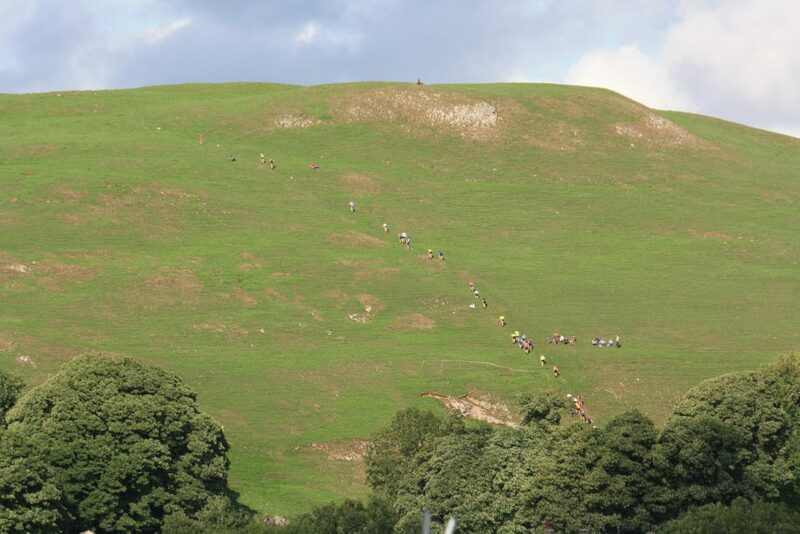 The course on paper looked tough and on the day it lived up to that. 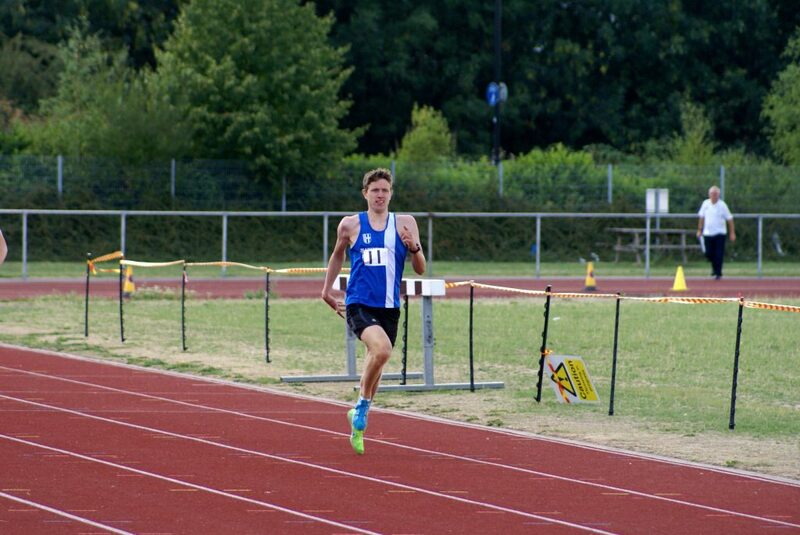 I led out of the swim and quickly settled into a lonely ride on the bike. 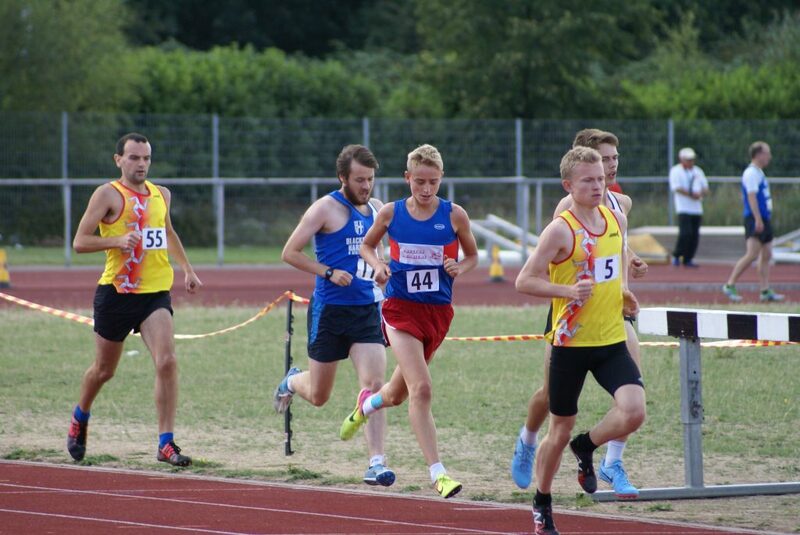 For the first time in a race, it challenged me mentally to keep focus and hold a strong pace. 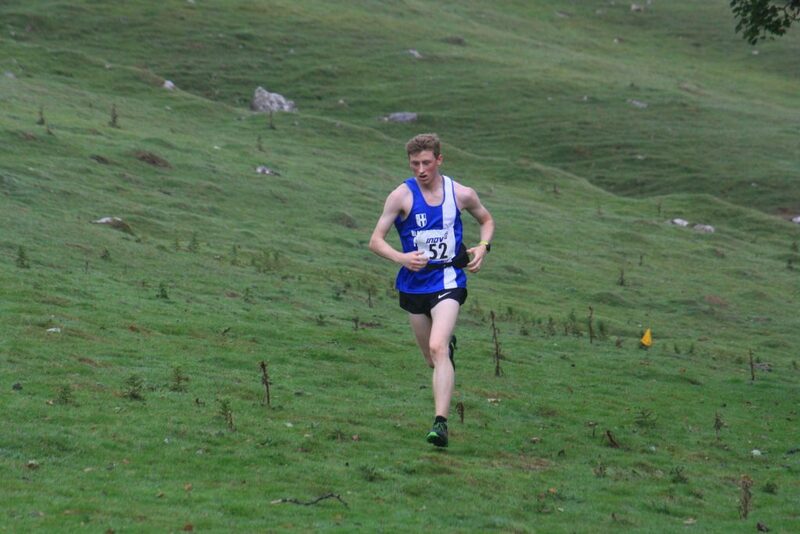 I was happy to come in off the bike and be on familiar mountain running territory. 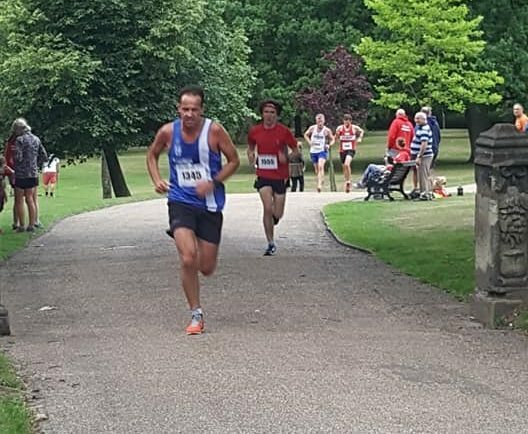 I didn’t feel the best I ever have done off the bike, but still managed to increase my lead over 2nd, making further inroads on the course record. 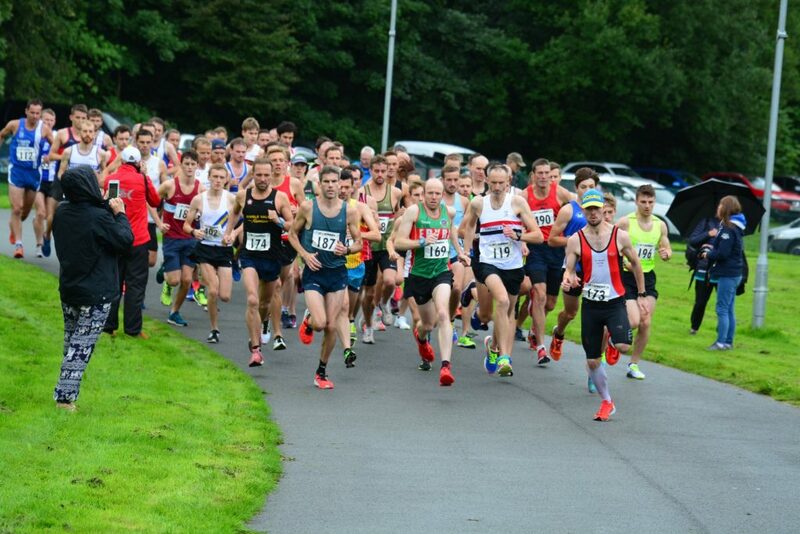 Once again a great and well organised event, and thanks once again to my individual sponsors and supporters”. 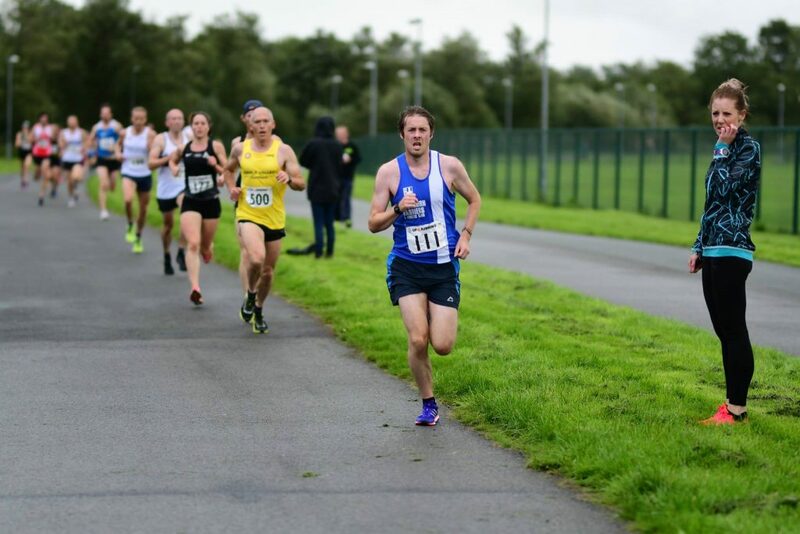 The final race in this years Series took place last Wednesday featuring one hundred and seventeen athletes and was won by Chris Davies in a time of 24.44, over a minute in front of second place and meant that he also took the overall Series Winners prize. 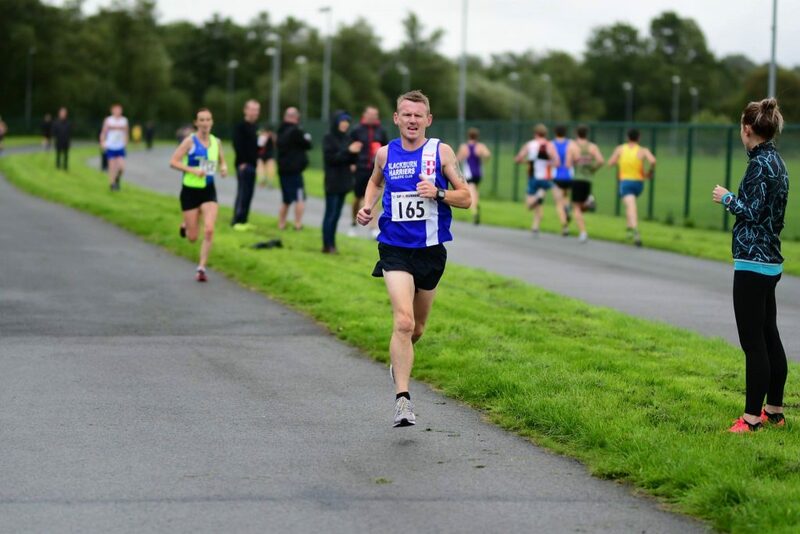 Paul Guinan finished in 7th place on the night clocking 26.50 which gave him 4th place in the Series – Chris and Paul also took 1st and 2nd places in the V40 age group categories for the Series. 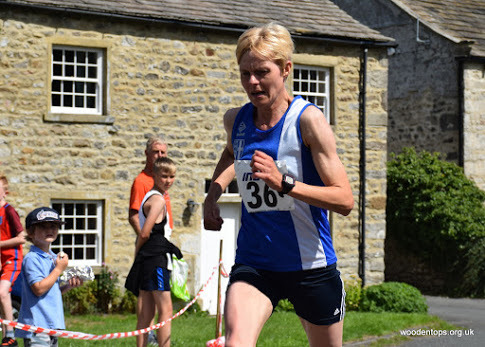 Lindsay Davies was the next Harrier home in 59th place ( 33.43) – 11th woman and 1st V40 with David Morris (V55) in 109th (44.36). 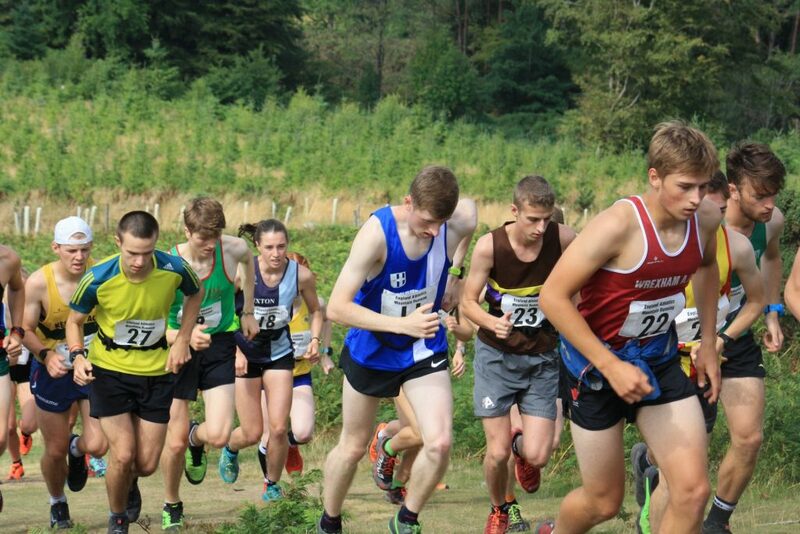 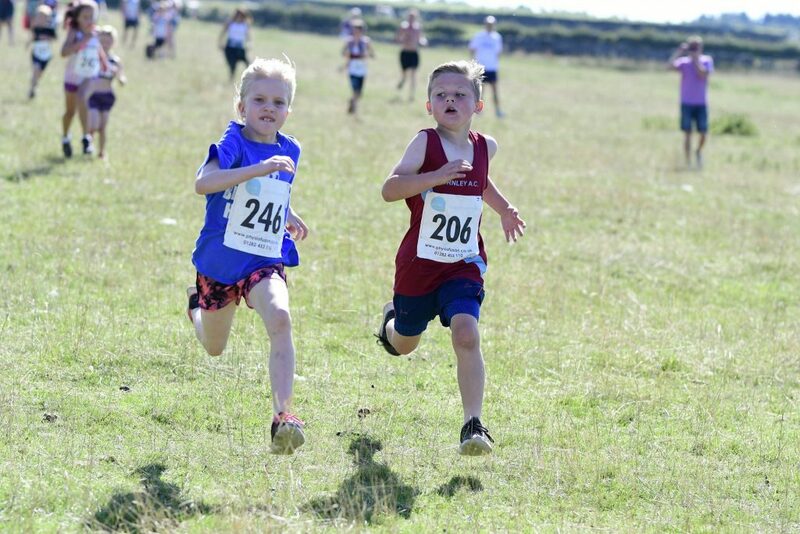 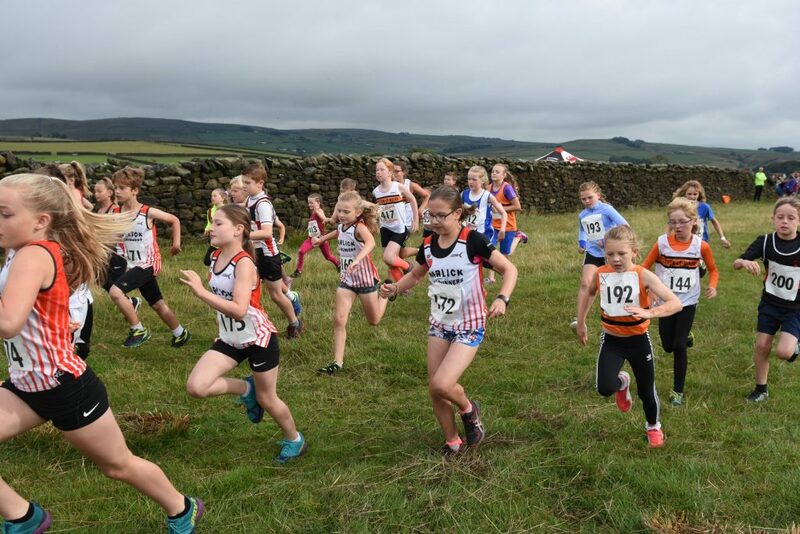 Eighty four youngsters took part in the Junior Race which continues to show that young boys and girls are turning out in increasing numbers at these local short distance races and is good to see. 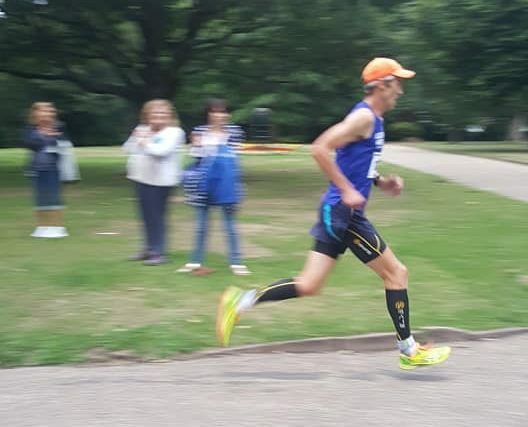 Matthew Smith who has been running very well in this format of events took 7th place overall in a time of 5.46 and being quite a bit younger than all of the runners in front of him – Matthew finished 1st M10 on the night and the leading M10 for the Series. 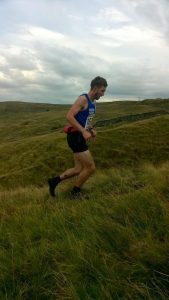 Thomas Marchant ran well today and is beginning to find his feet again on the Fells and Mountains after a sustained period of injuries. 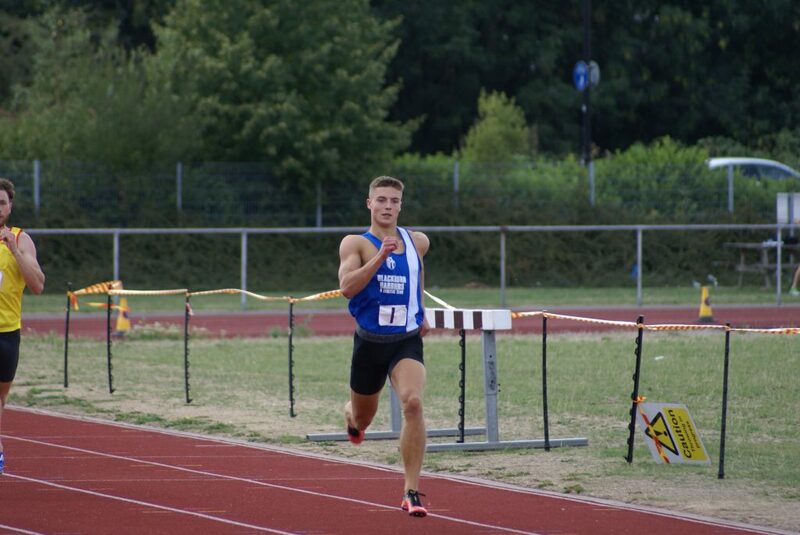 In a tough race against the the top U20s and in hot conditions Tom battled the whoie way to come home in a time of 51.09 and 19th overall. 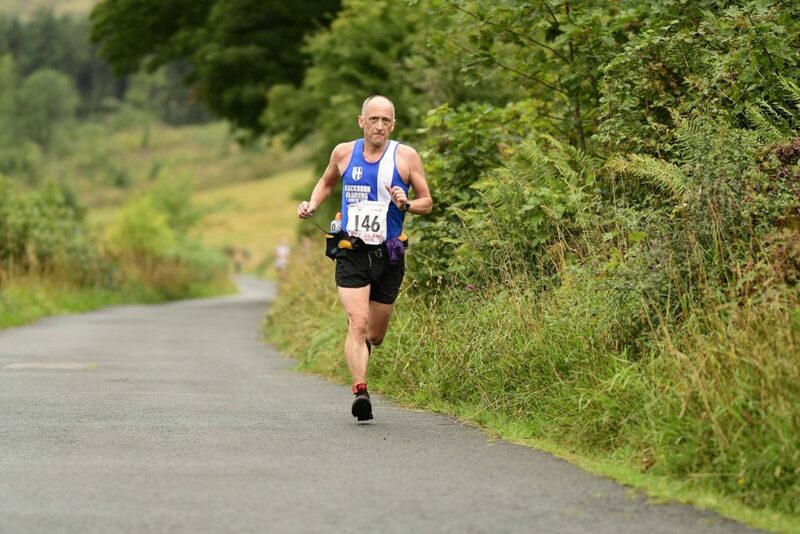 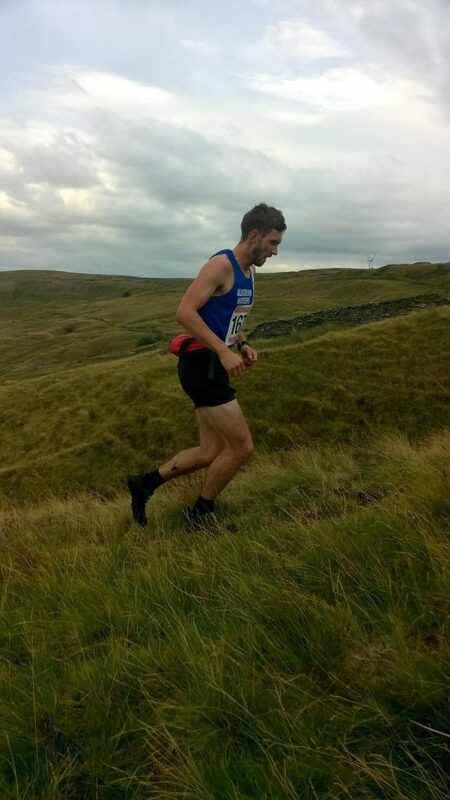 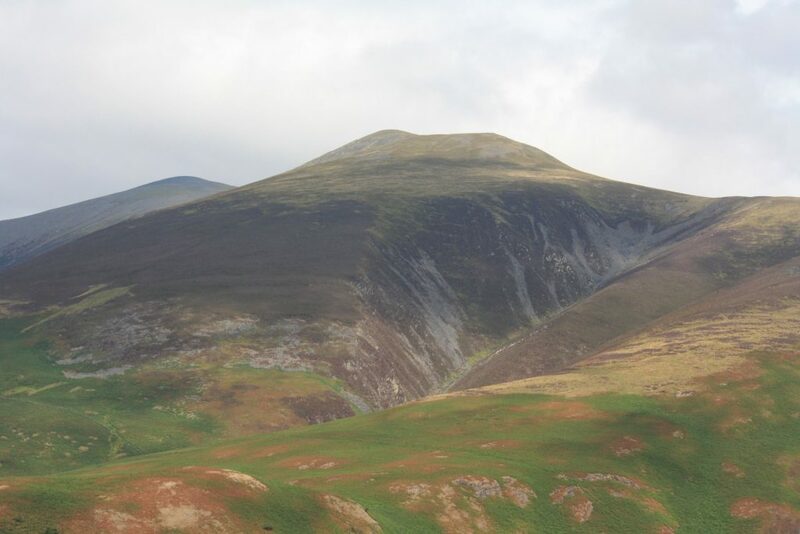 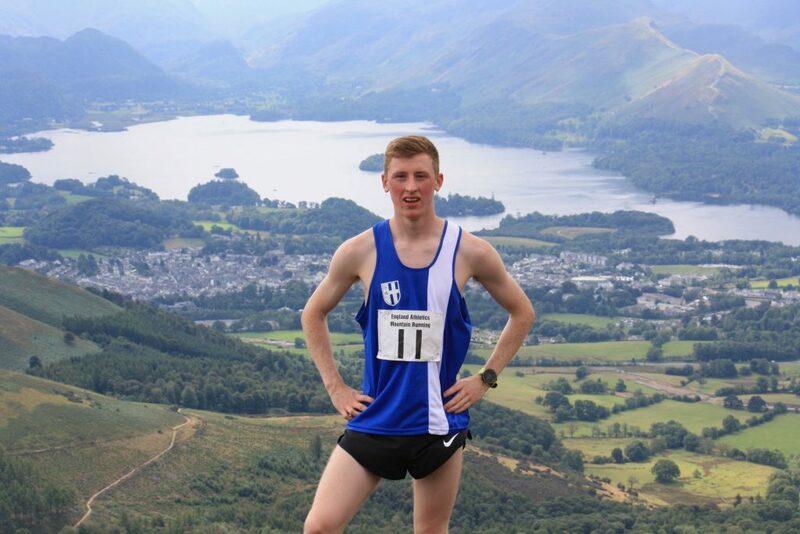 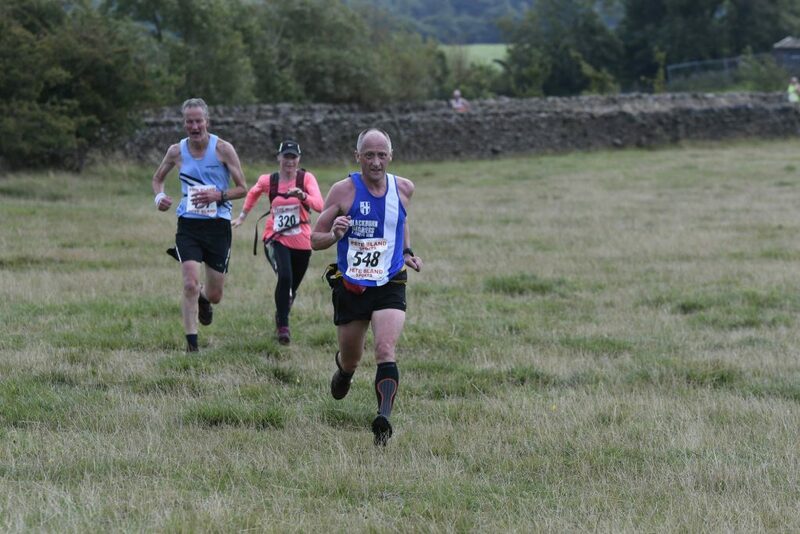 John Horrocks has been running really well on the Fells and had another very good run in his latest outing taking 7th place overall in a 95 strong field with a time of 48.57 – the race being won by James Kevan in 46.06. 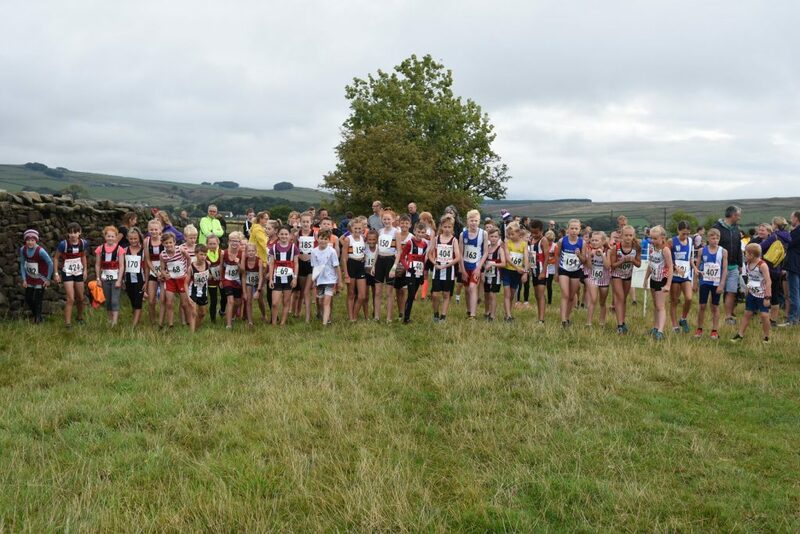 Four age group categories at this latest Race in the Burnley & Pendle Grand Prix Series featuring nearly one hundred youngsters in the four races. 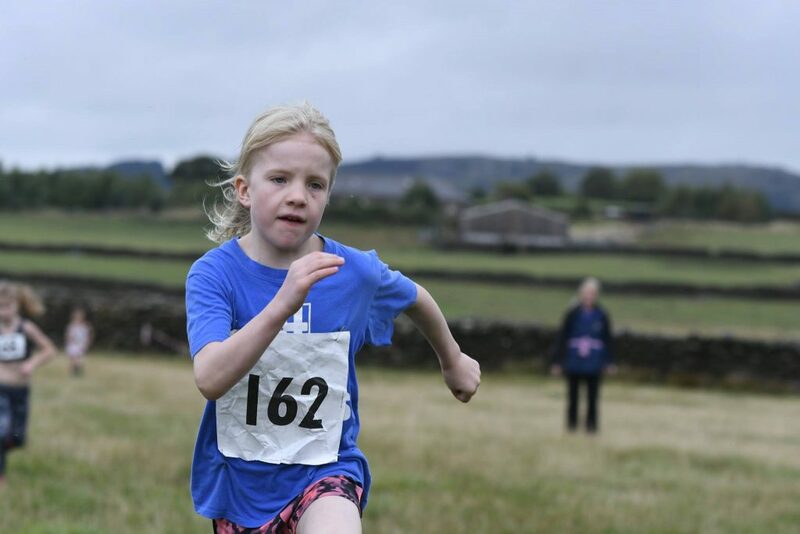 The U7/U9 Race with twenty one runners saw Charlotte Smith clock a time of 4.14 to finish 9th and looking at this photo there is little doubt about this young girls determination to do her very best! 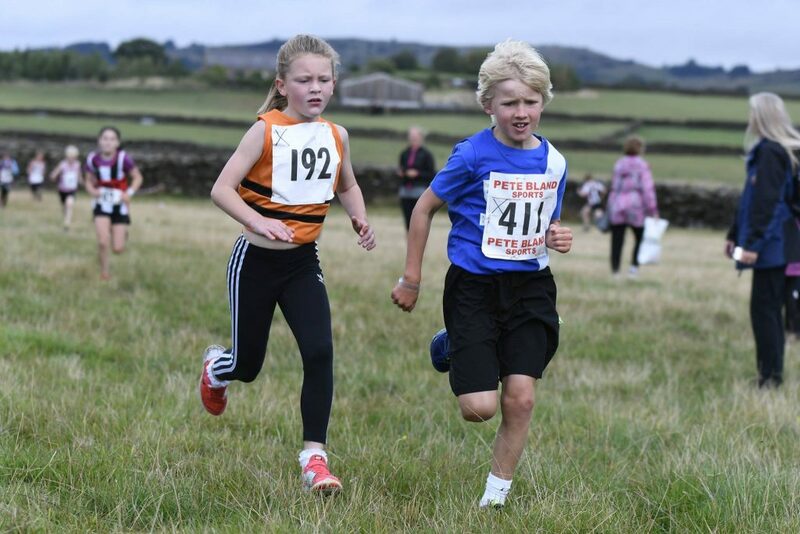 It was another win for the in form Matthew Smith in the U11 Race as he was first home in the thirty two stong field running a time of 6.01 with Tippi Francis in 22nd spot overall and 4th F11 in a time of 7.33. 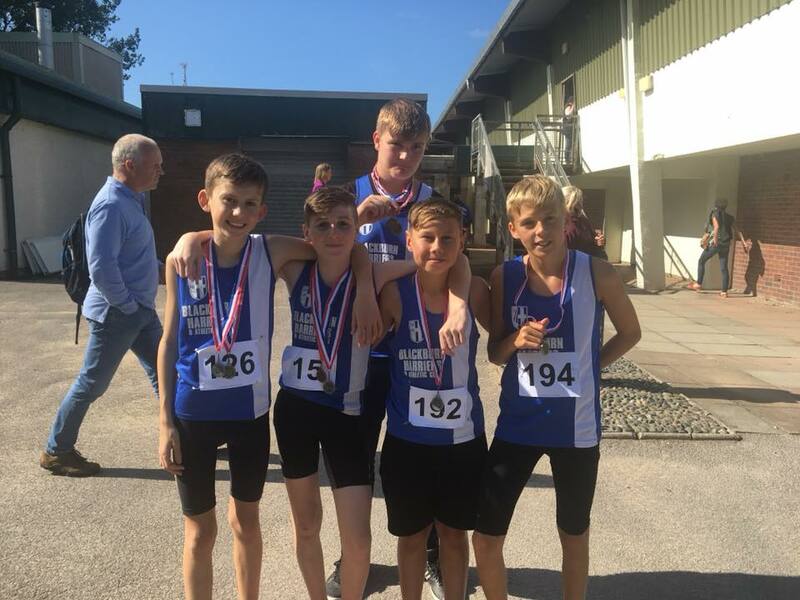 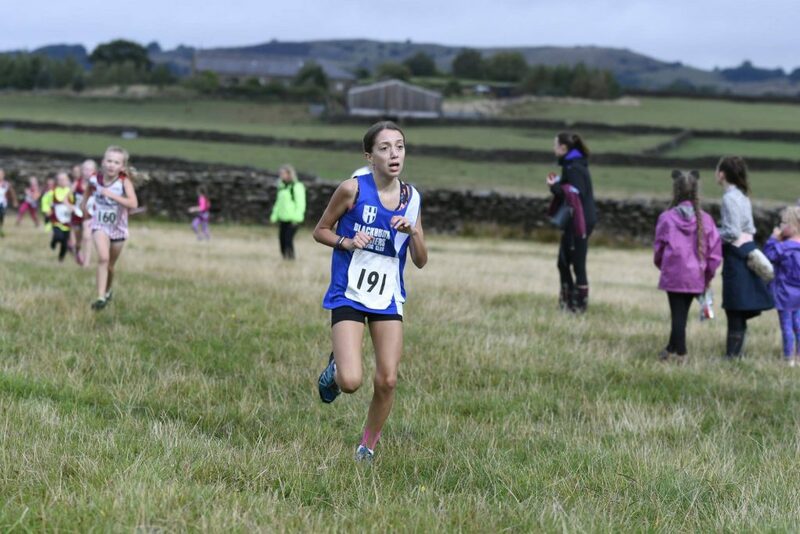 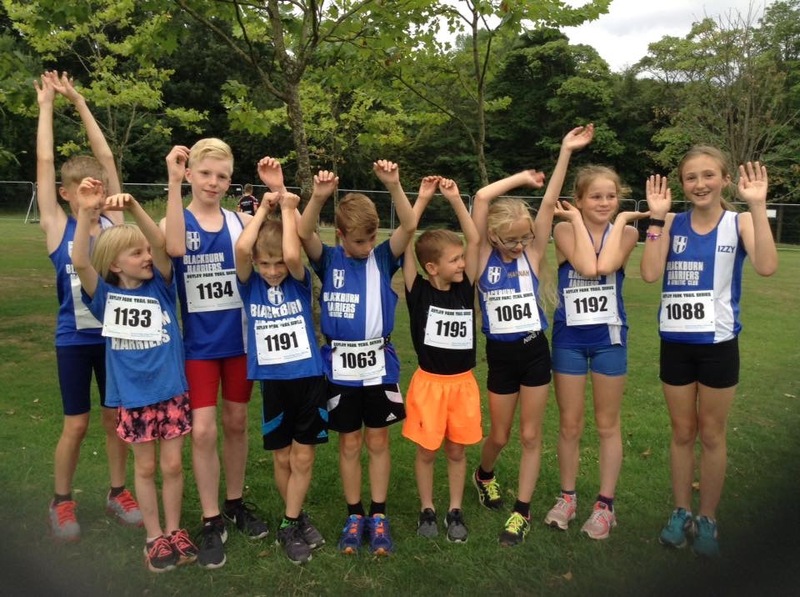 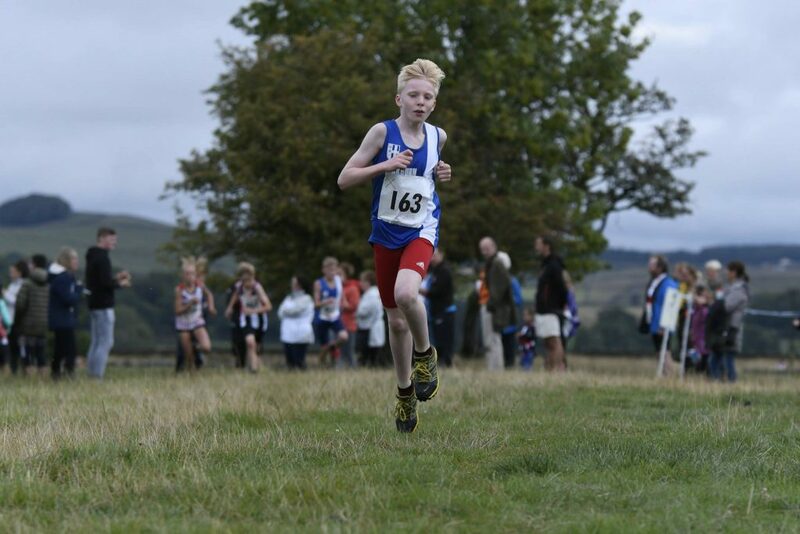 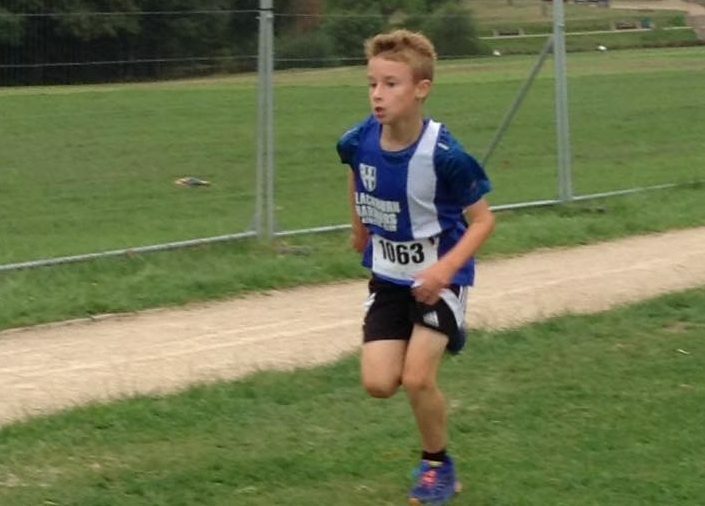 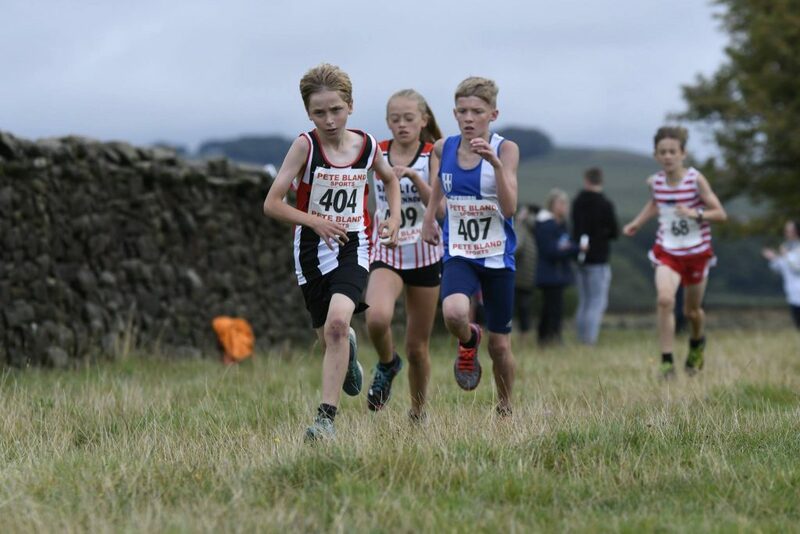 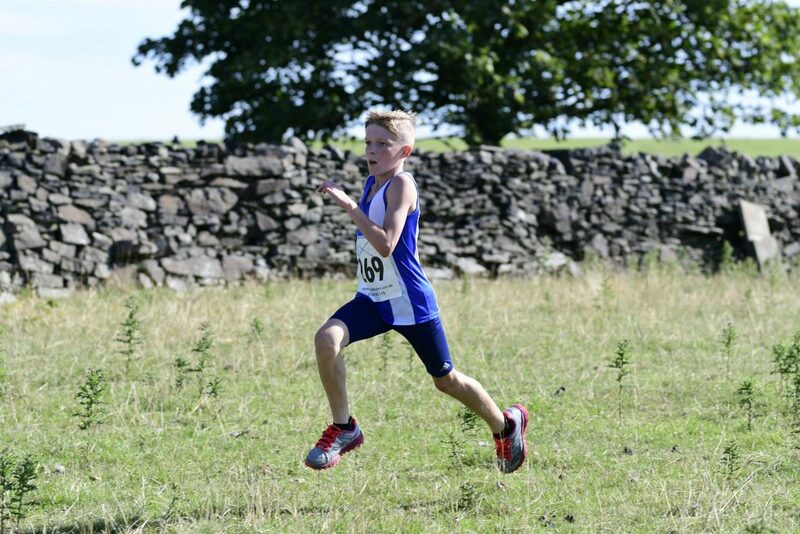 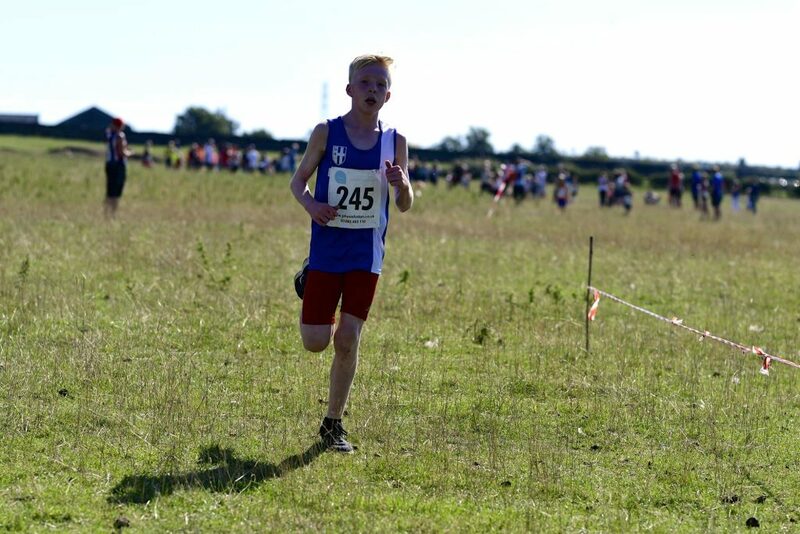 Impressive running in the U13 Race saw the Trawden lads finish 1,2,3 with Blackburn Harriers – Codie Dewhurst (11.04), Oliver Gill (11.29) and Daniel Smith (11.51) in 4th, 5th and 6th places – Libby Neal took 15th spot overall in a time of 14.07. 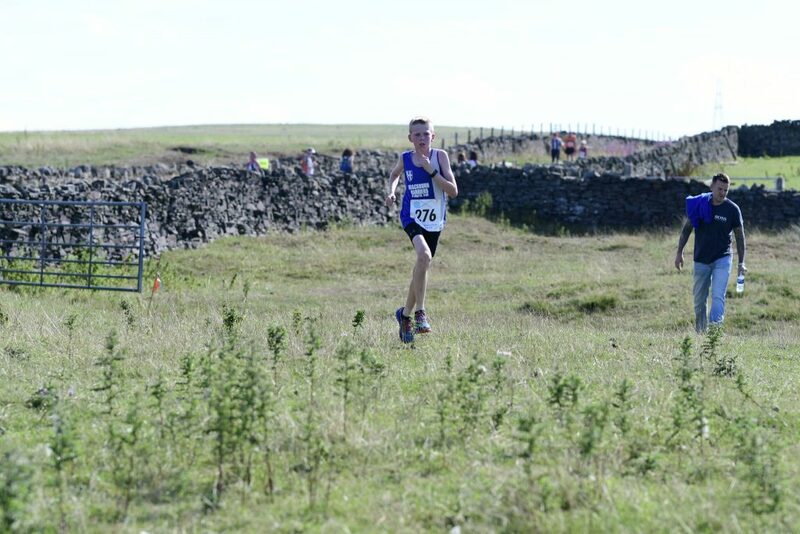 In the Senior Race won by Thomas Corrigan ahead of a field fearuing one hundred and sicty seven runners, Richard Taylor came home in 84th place with a time of 63.25.